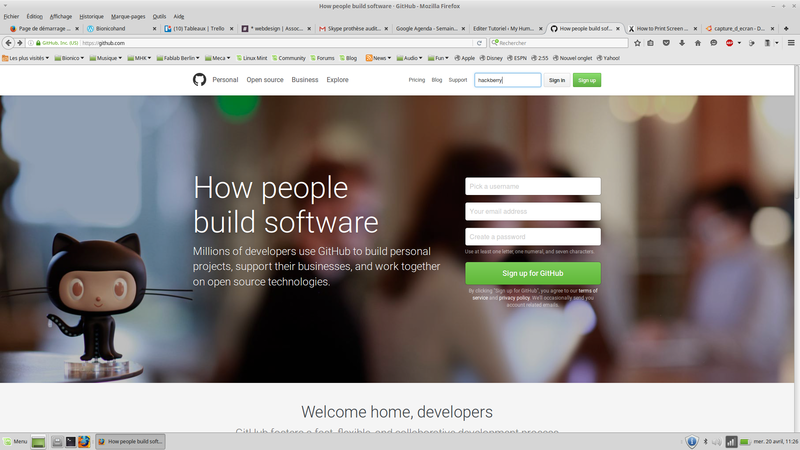 1- GitHub, what is it? 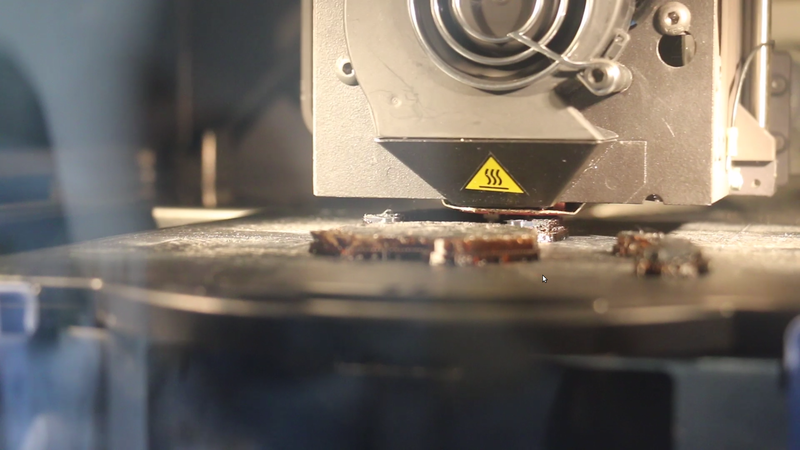 24- Fablab or hybrid version ? 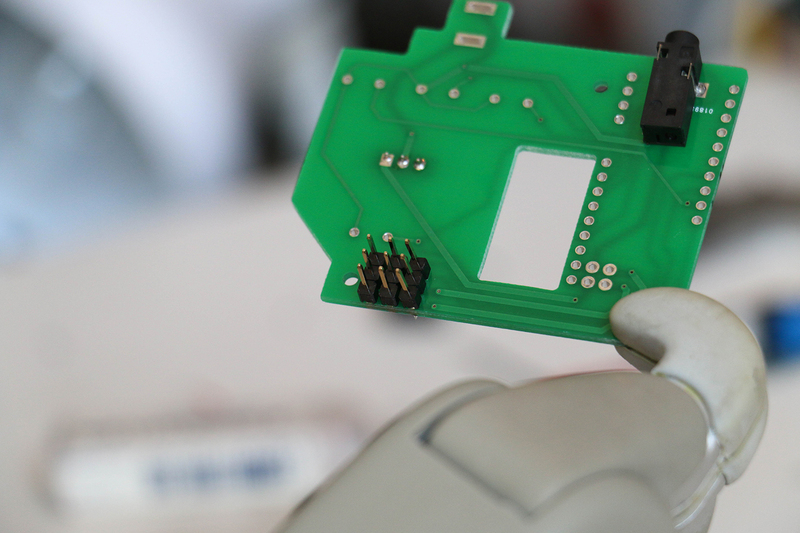 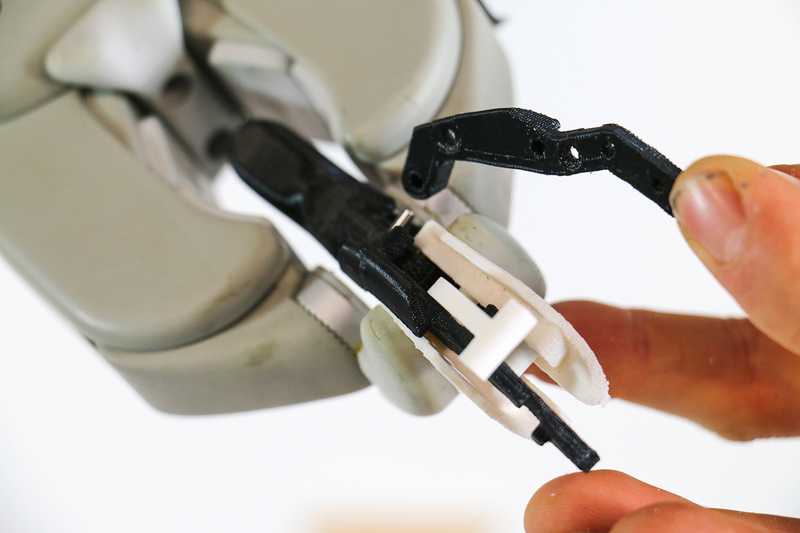 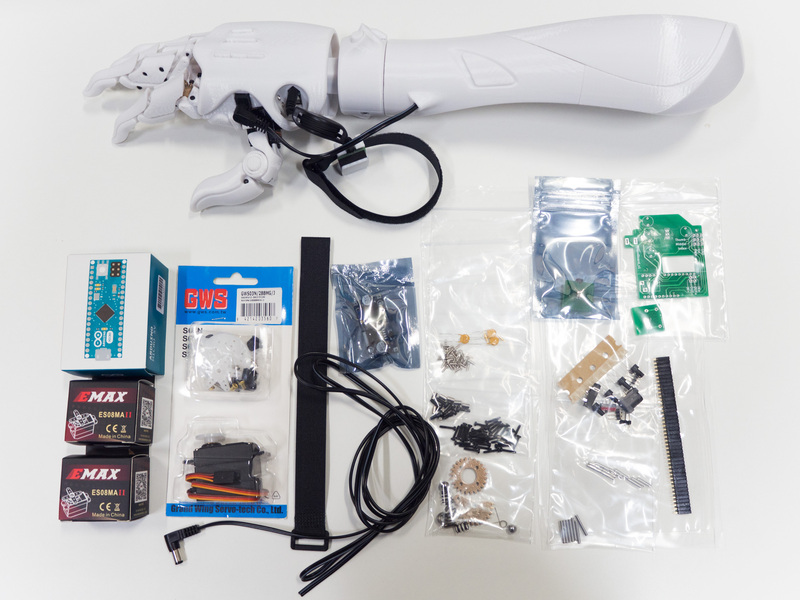 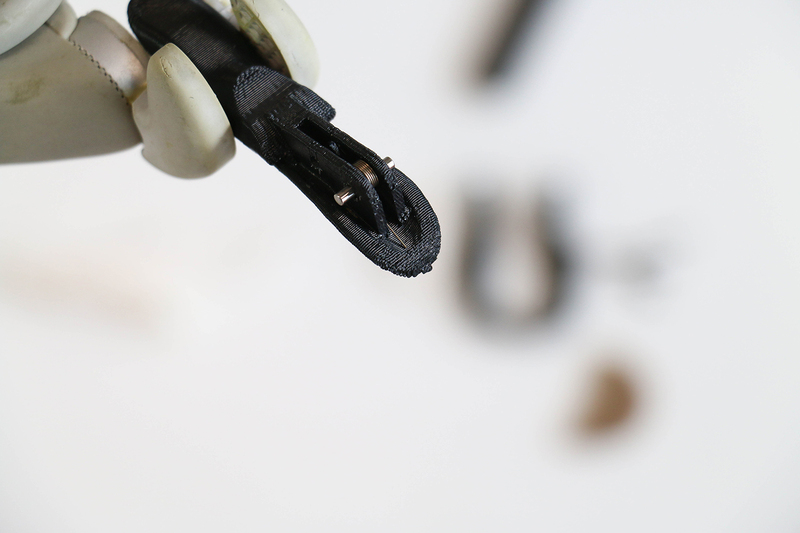 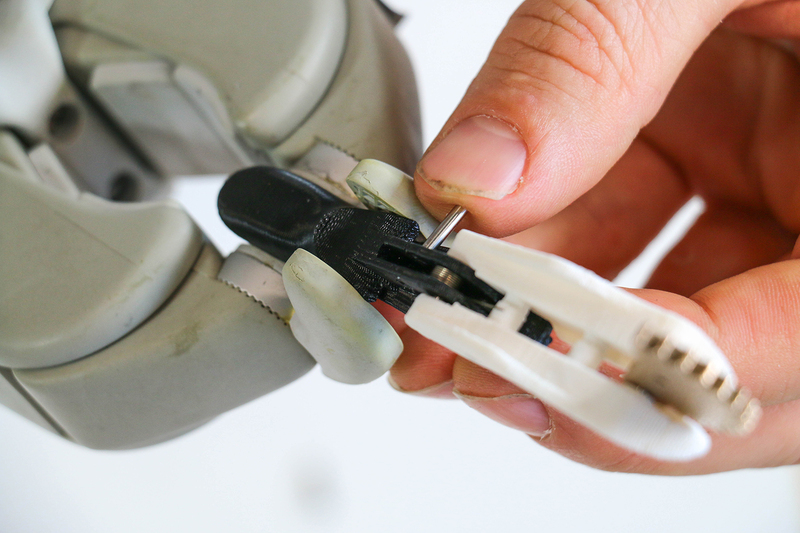 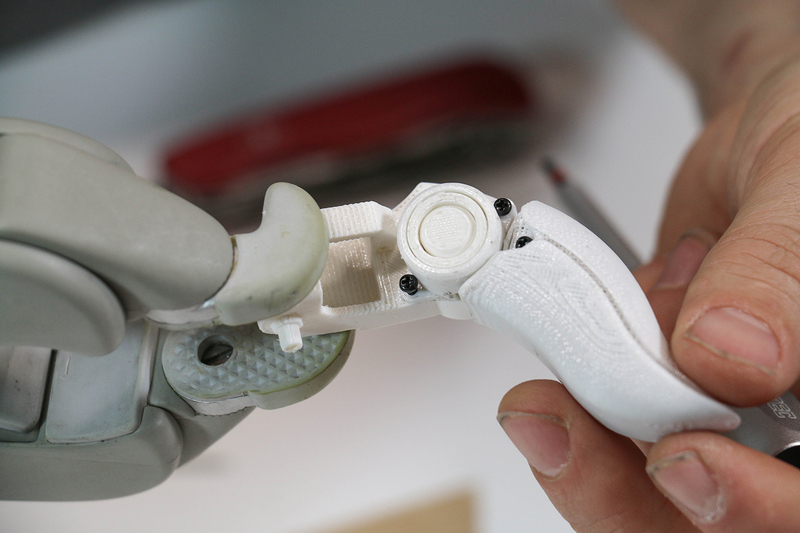 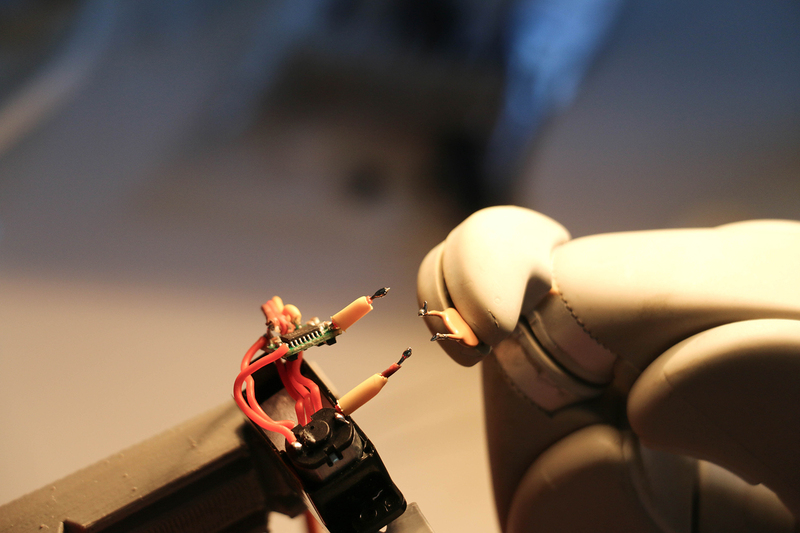 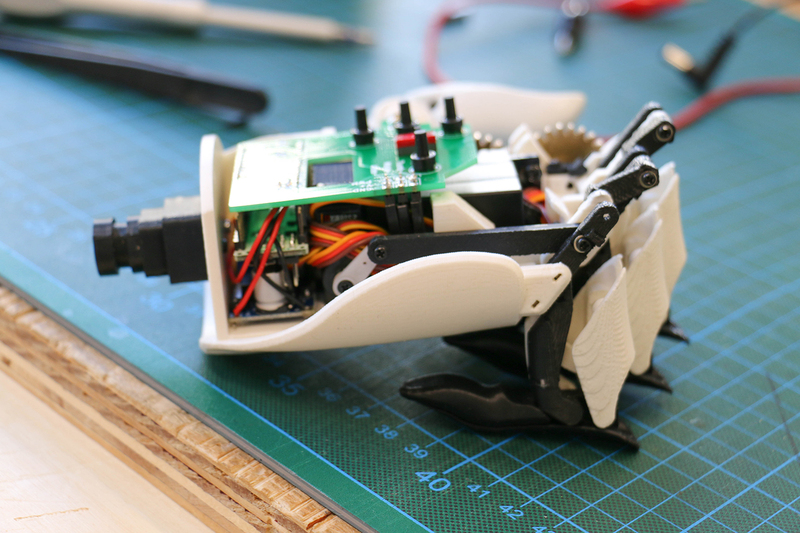 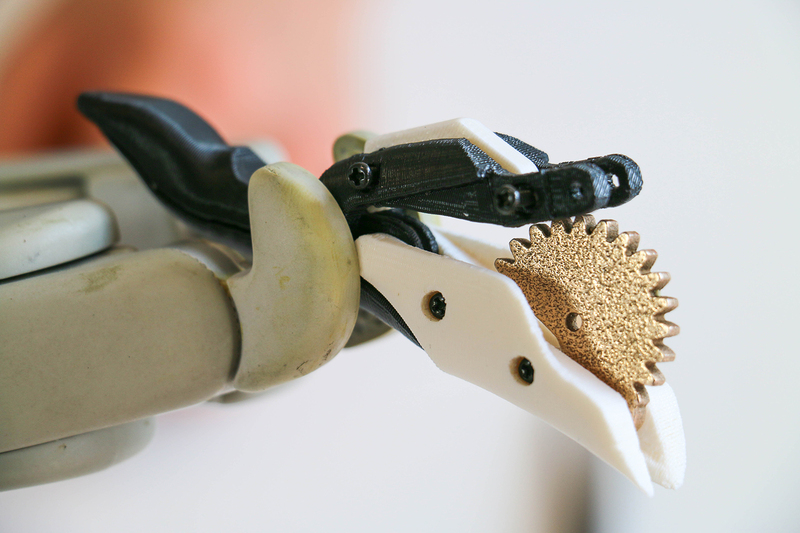 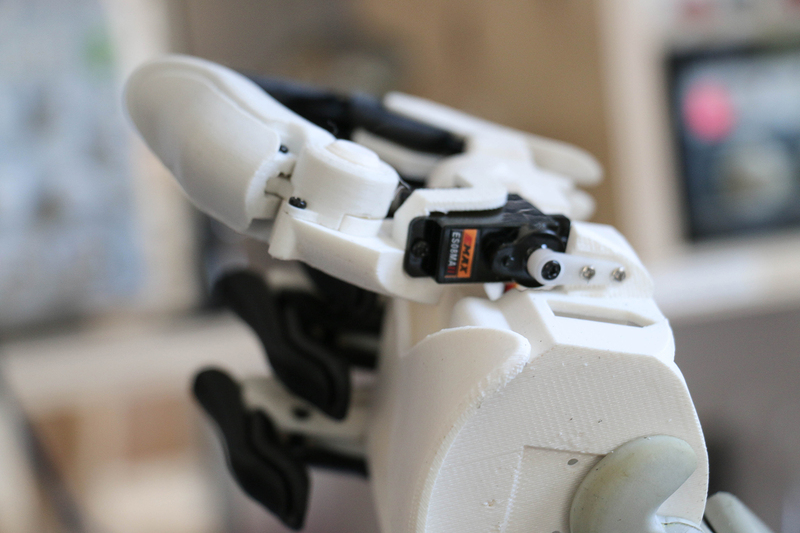 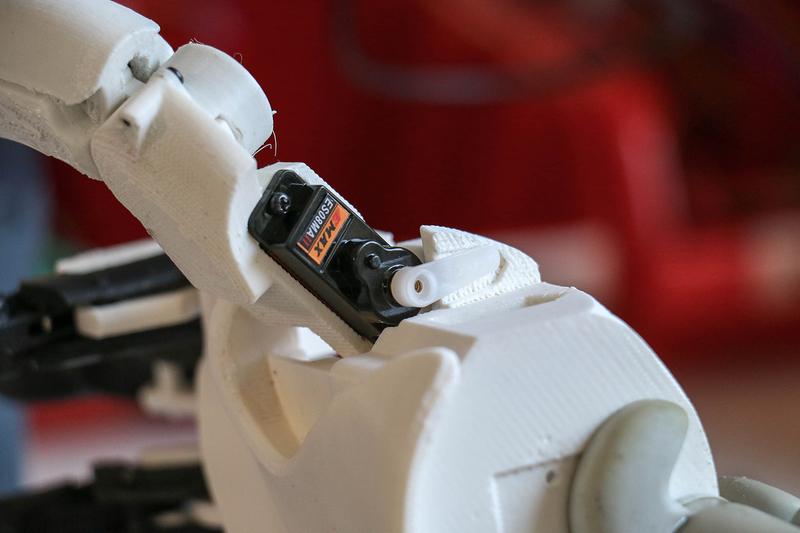 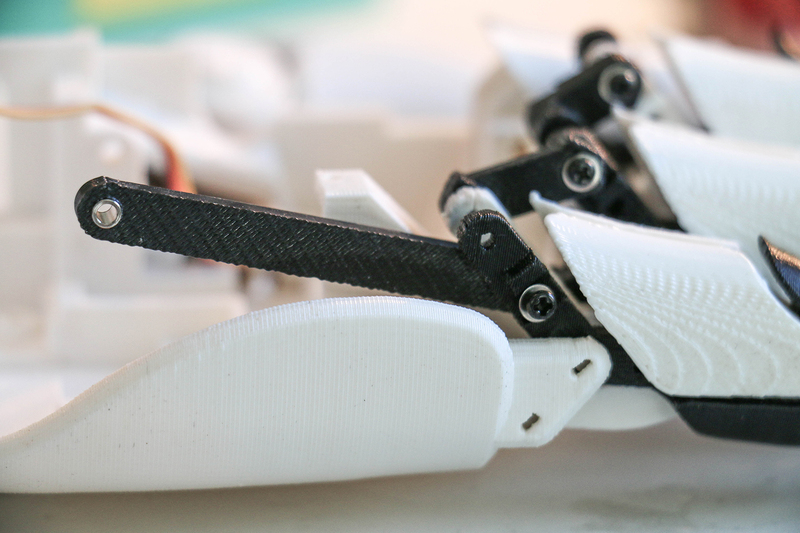 Since 2013, technological innovation have seen projects emerge such as Open Bionics (Bristol, England) or Exiii Hackberry (Japan) with the same target. 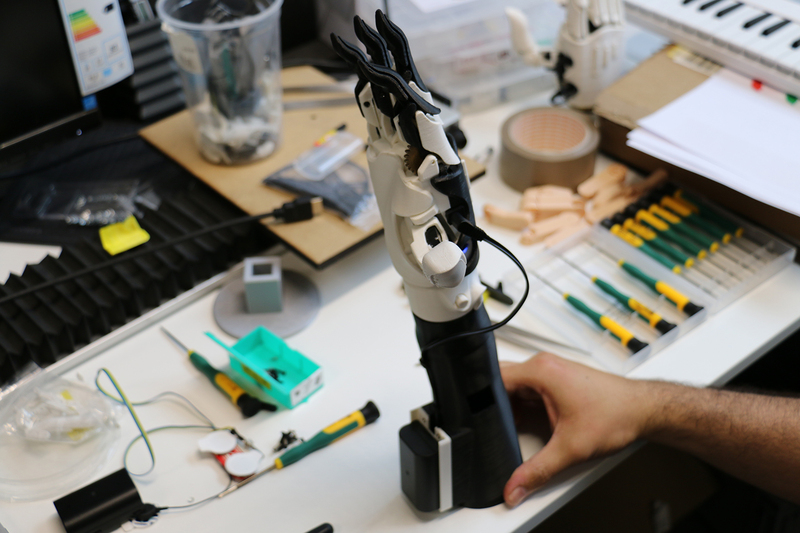 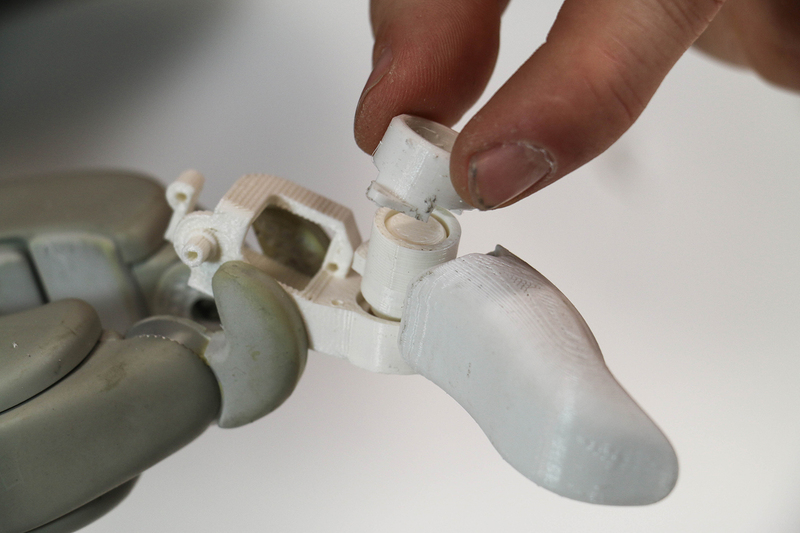 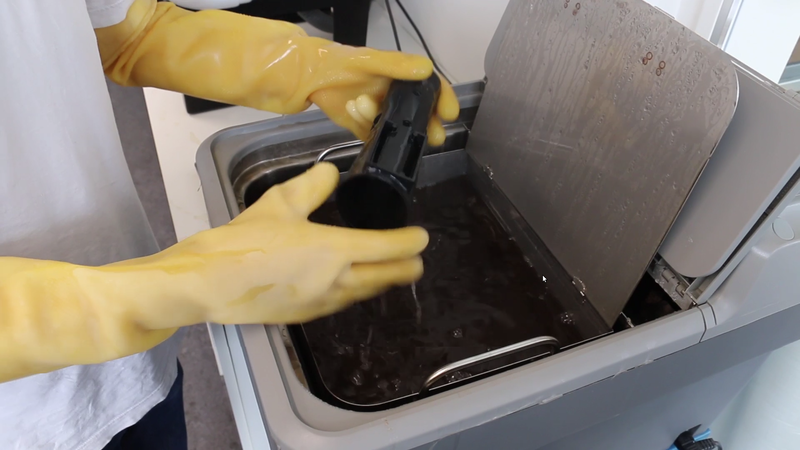 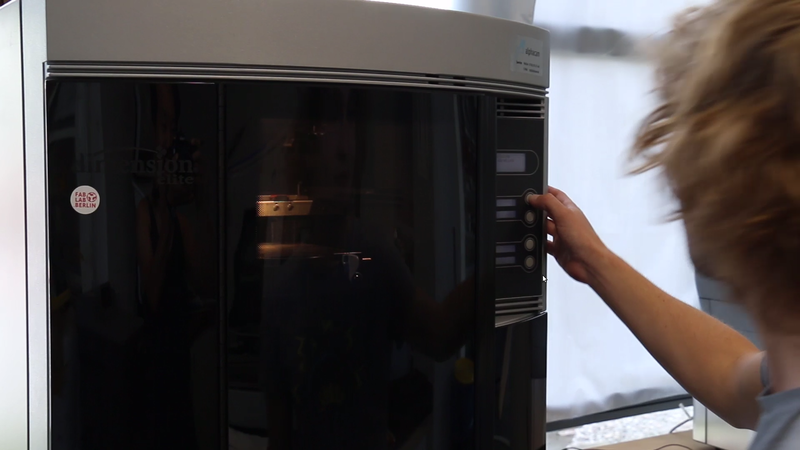 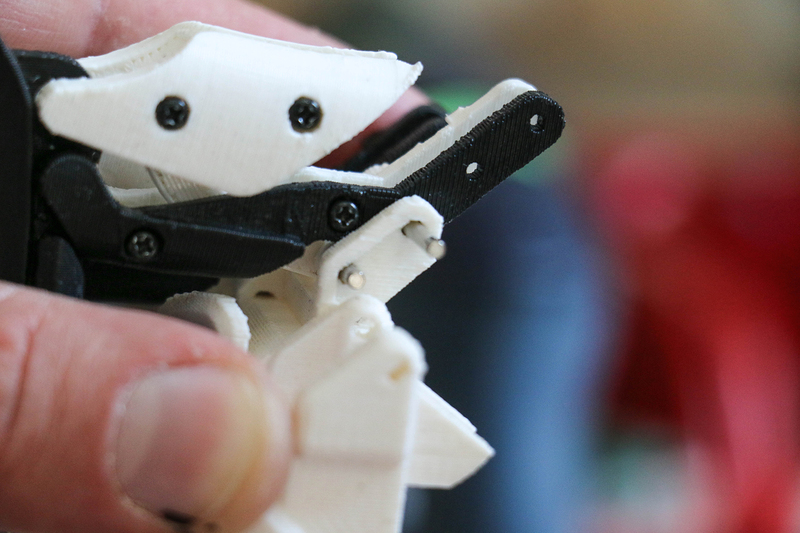 From the GitHub link, we have made the Exiii hand at Fab Lab Berlin. 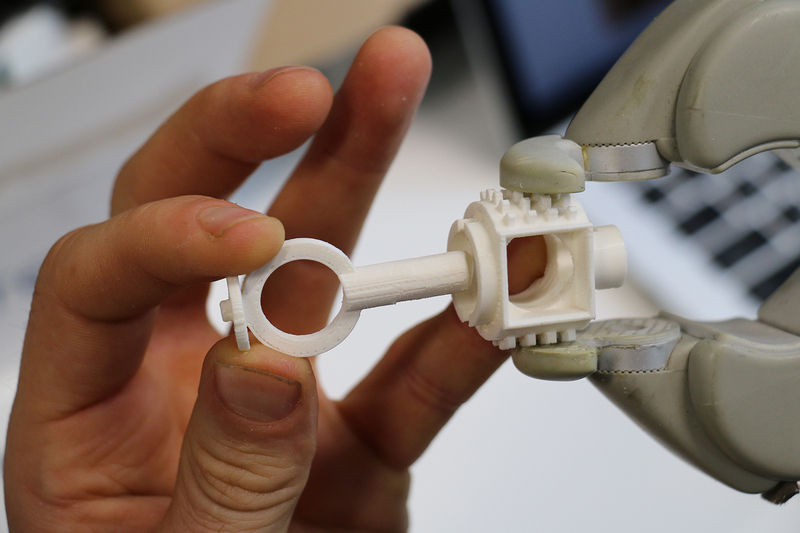 The total cost for all the pieces is about 700 euros, but if you have a 3D printer, you can reduce the total cost to 150 euros. 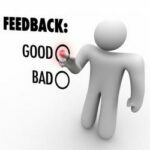 Here we summarize how we proceeded and hope it will encourage you to do the same. 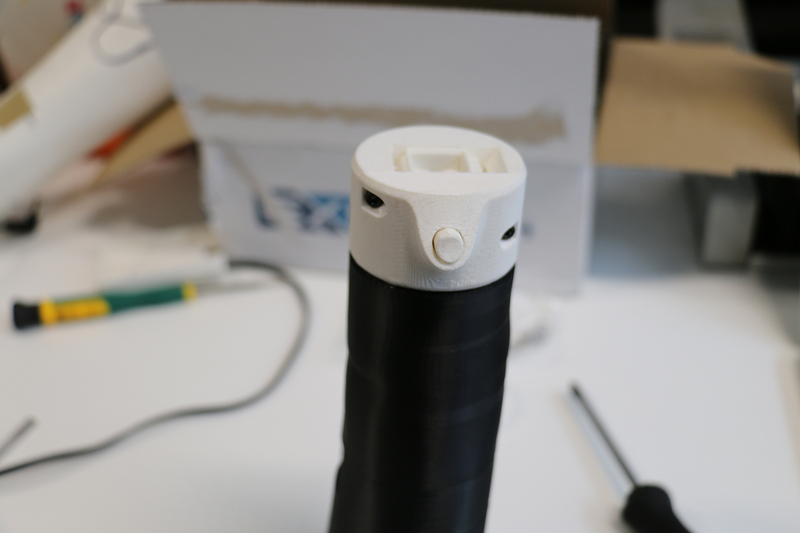 This project is difficult, you may need people around to help you, do not hesitate to go to a fablab and ask someone to join you. 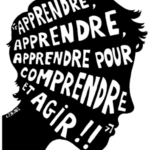 & most important, have fun! 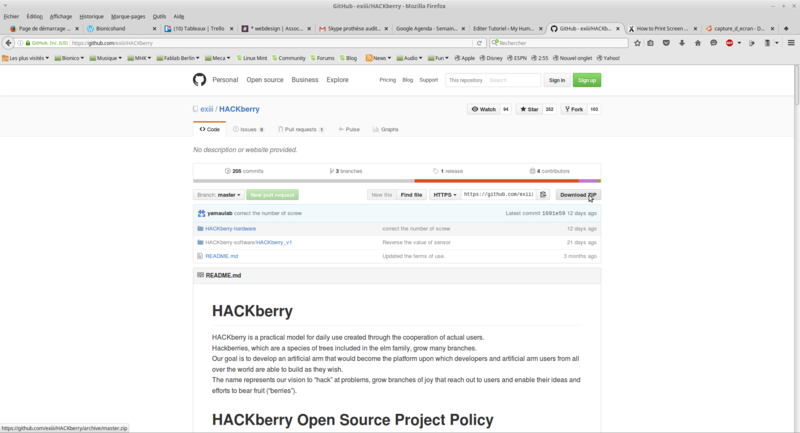 We are in 2016, Github is the social network that definitely changes our way to work. 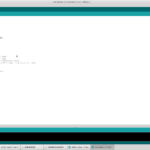 Follow the steps to get started, download the files and feel like a geek!! 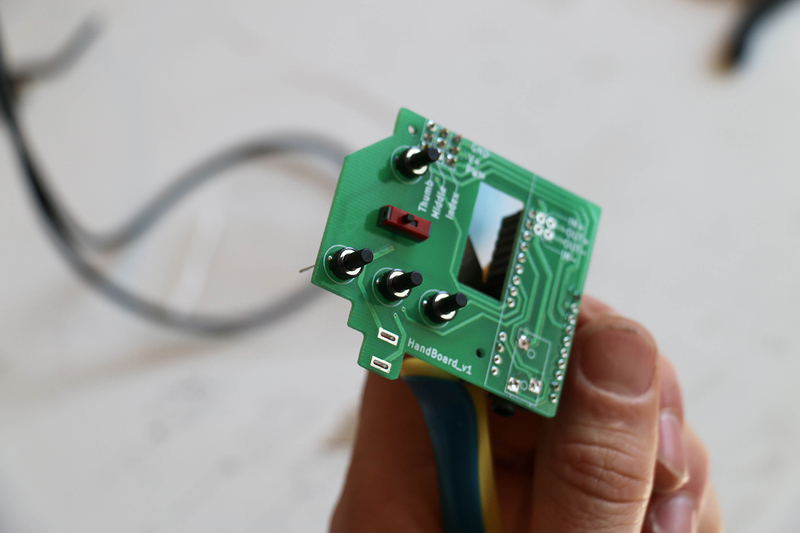 As It was hard to find some of the components in Europe, we decided to buy them directly from the HACKberry team to save time. 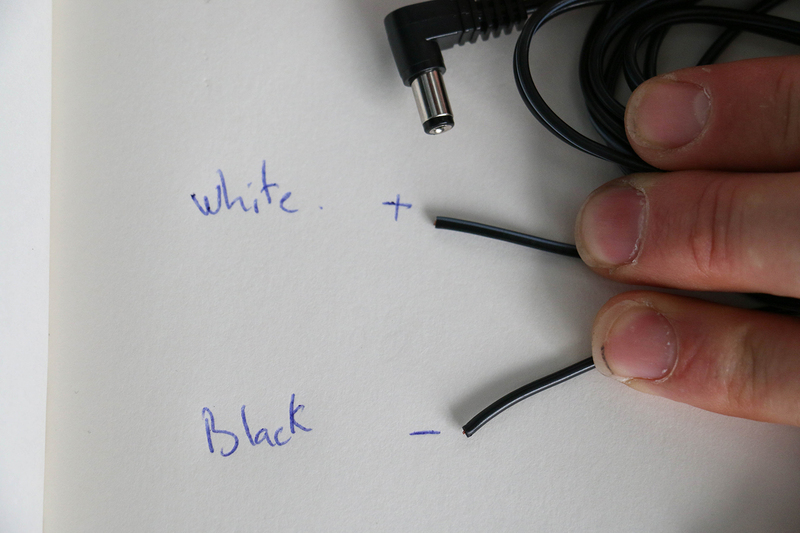 There are three types of packages to buy: 1. 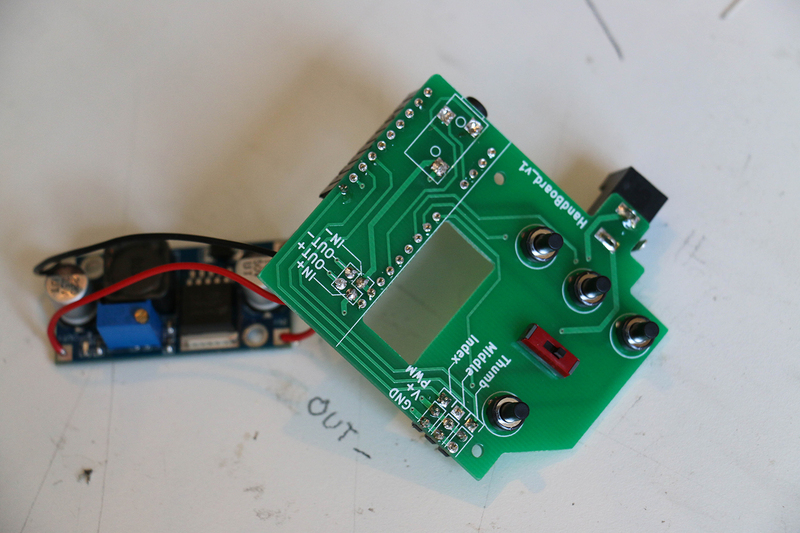 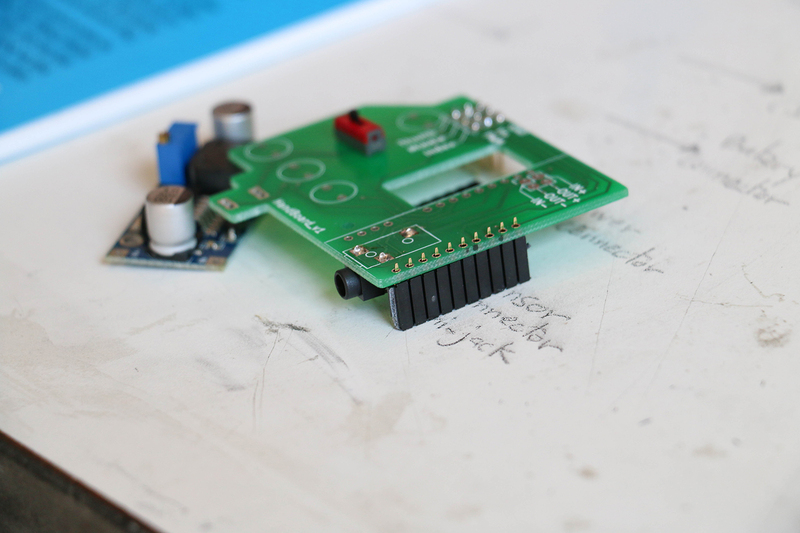 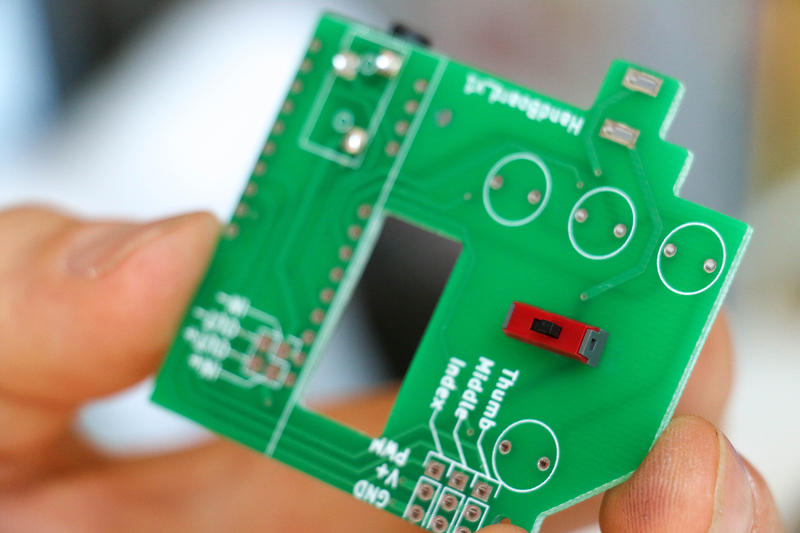 PCB for HACKberry: 30 USD (three PCBs for hand-control, sensor and battery) 2. 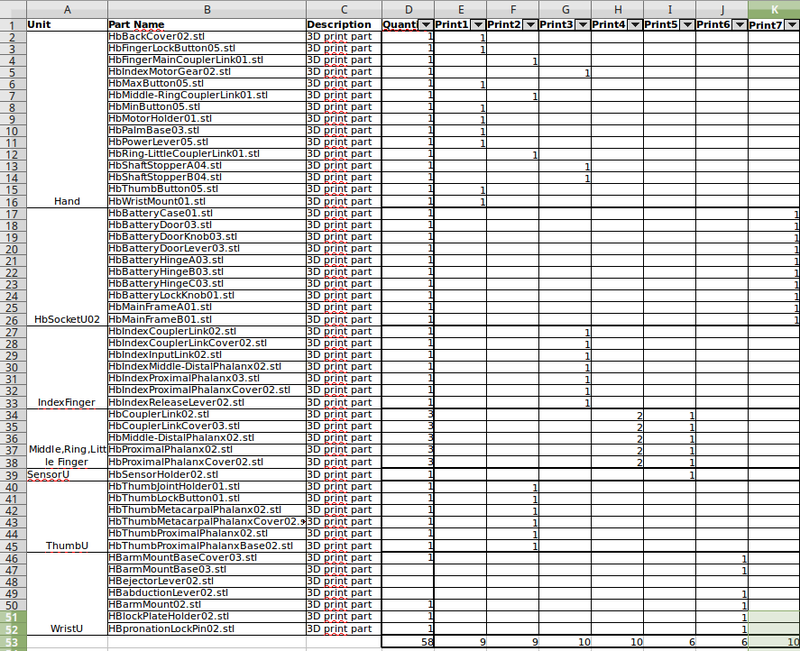 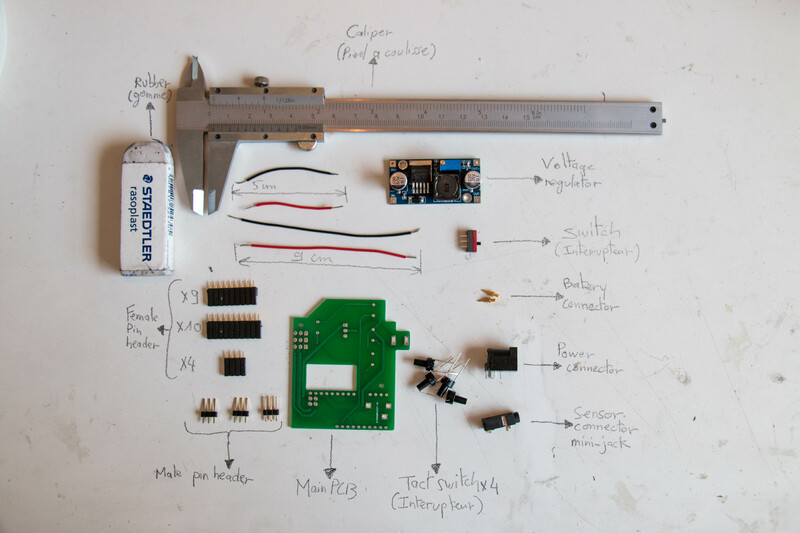 PCB + Electronic/Mechanical parts: 135 USD (All parts except battery and body parts) 3. 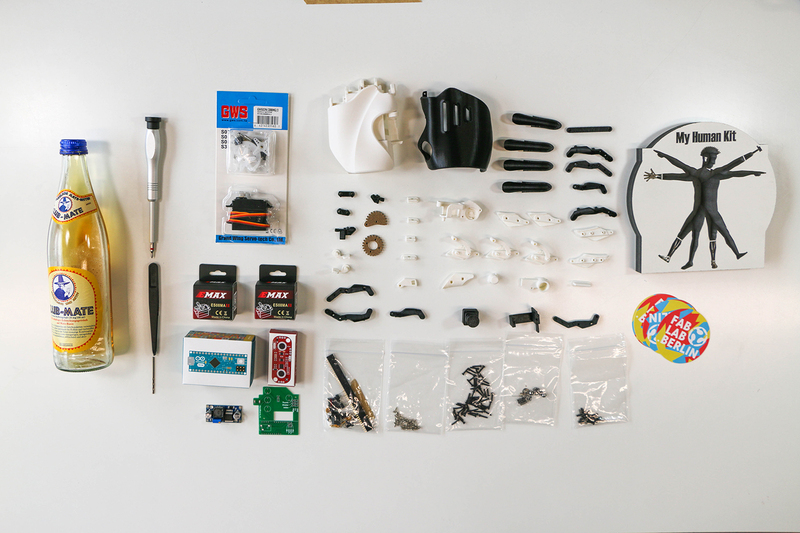 PCB + Electronic/Mechanical parts + 3D-printed body parts: 720 USD (All Parts except battery) * These prices DON'T INCLUDE shipping fee. 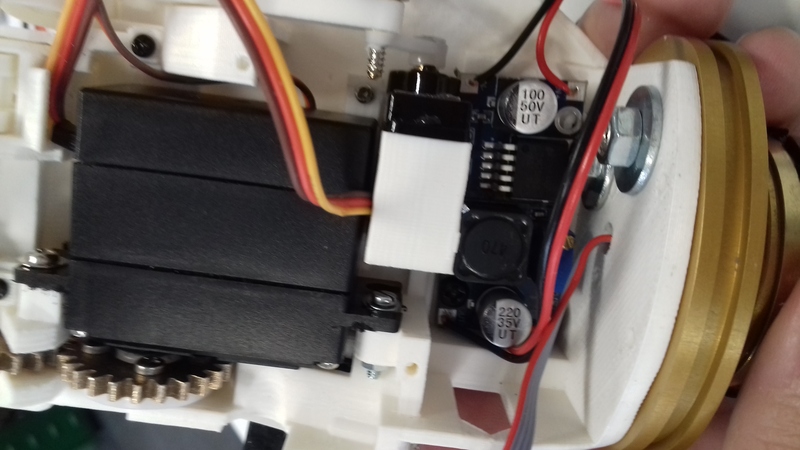 We started to use 3D print softwares such as Simplify, Maker Bot or Cura and desktop 3D printers such as I3 Berlin and Maker Bot but we did not reach the required quality. 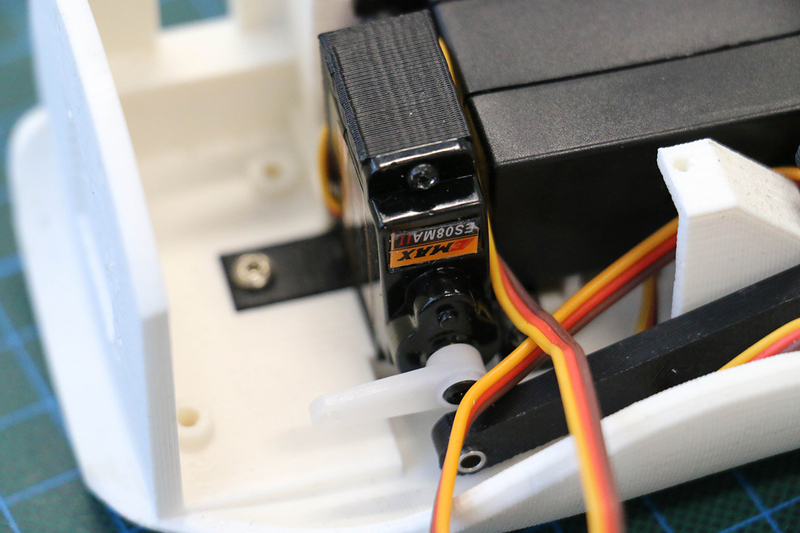 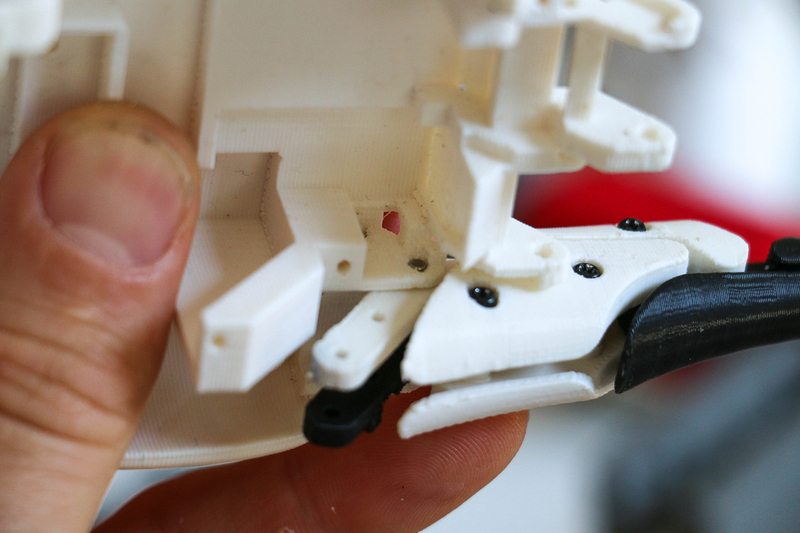 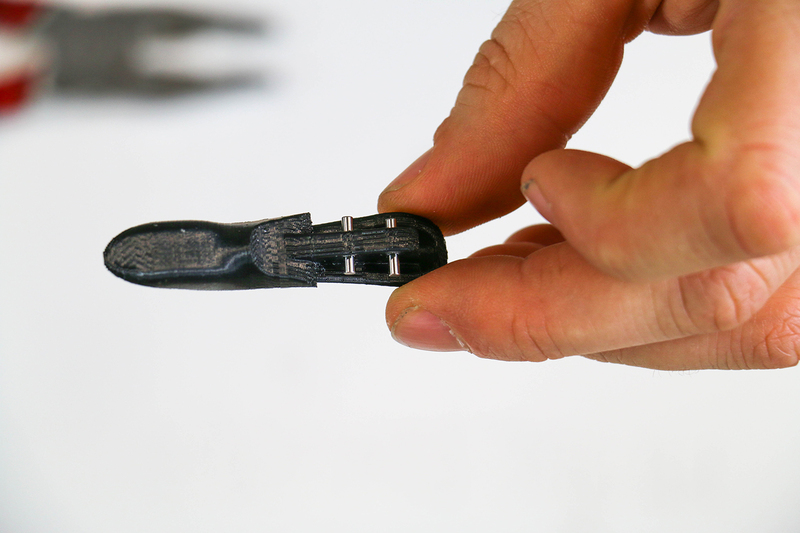 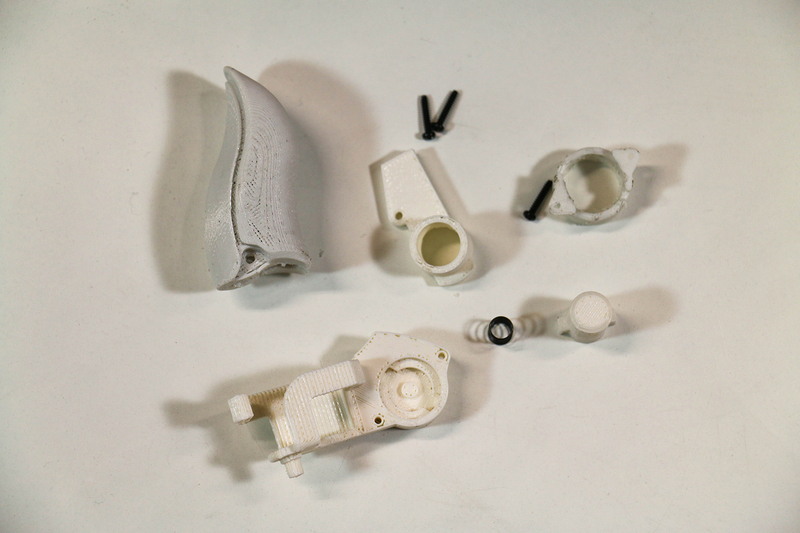 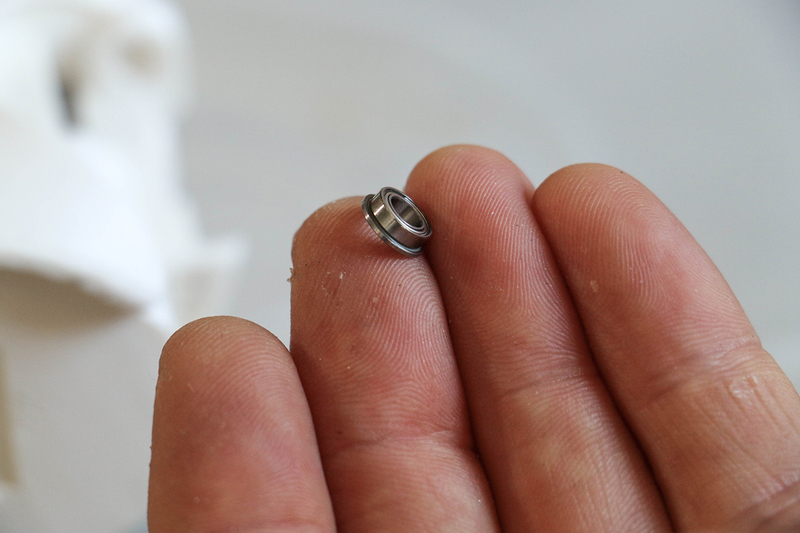 We ended up using a Stratasys -Dimension- 3D printer and its associated software to make sure to get higher quality, especially for the small parts such as the finger ones. 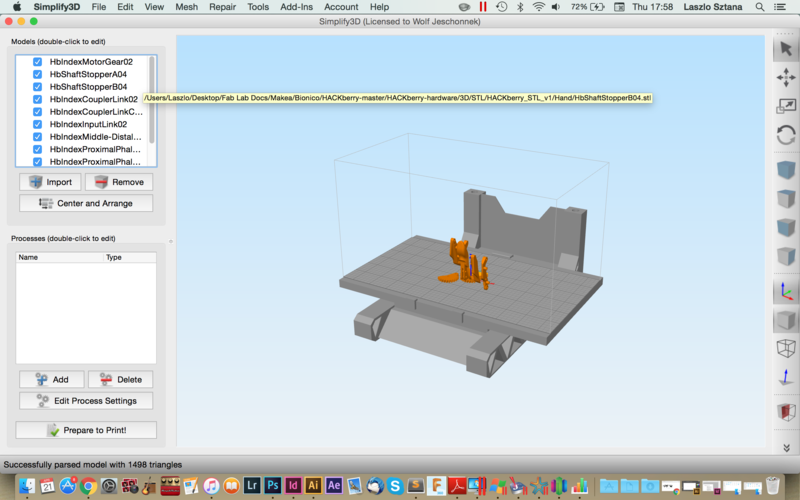 This step explains the basic set up of a 3D print software such as Simplify. 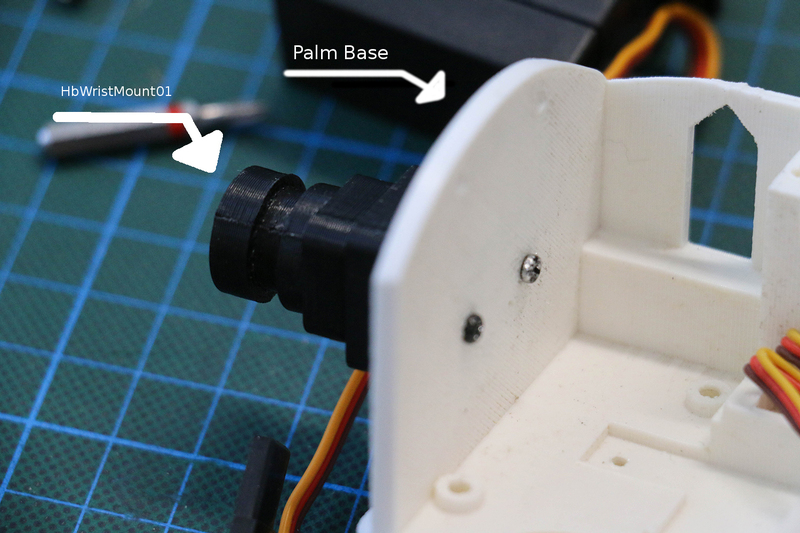 Go to: HACKberry Hardware folder Open the file: "HACKberry_BOM_v1_for_print.xlsx"
First of all, screw the wirst on the palm base because once the elements are assembled on the hand (fingers, components), it becomes impossible to do it. 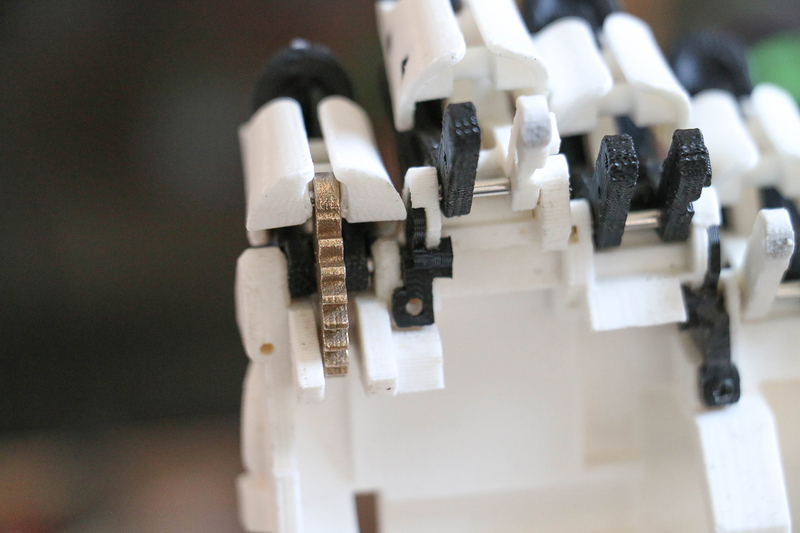 The 3 motors the hand must be protected be protected to protect from overheat. 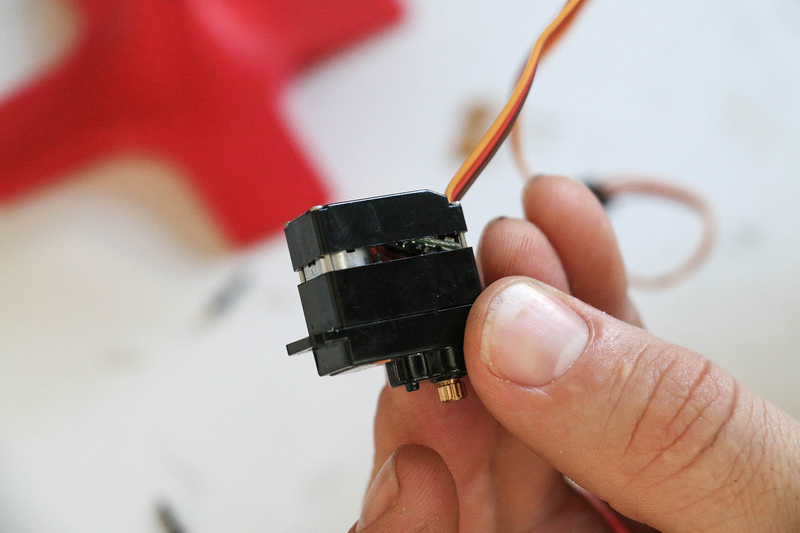 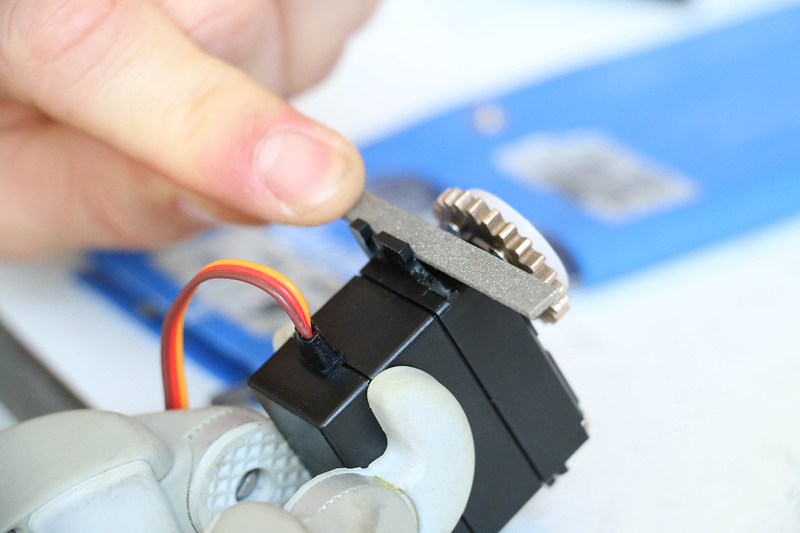 This step explains how to weld the resettable fuse (PTC) on each servomotor. 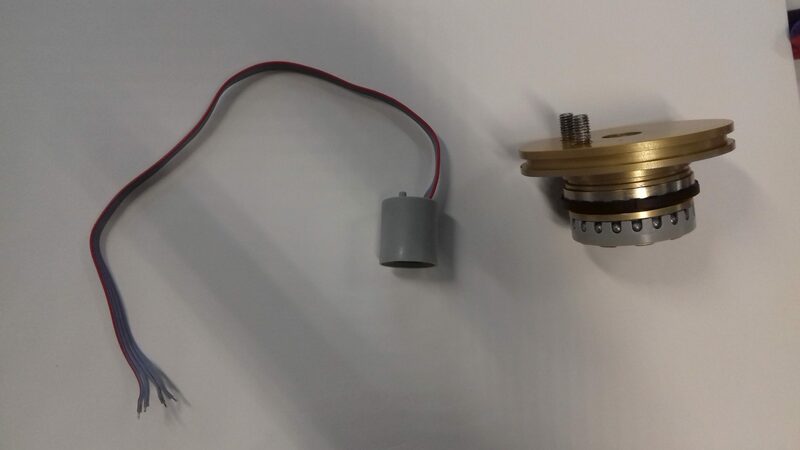 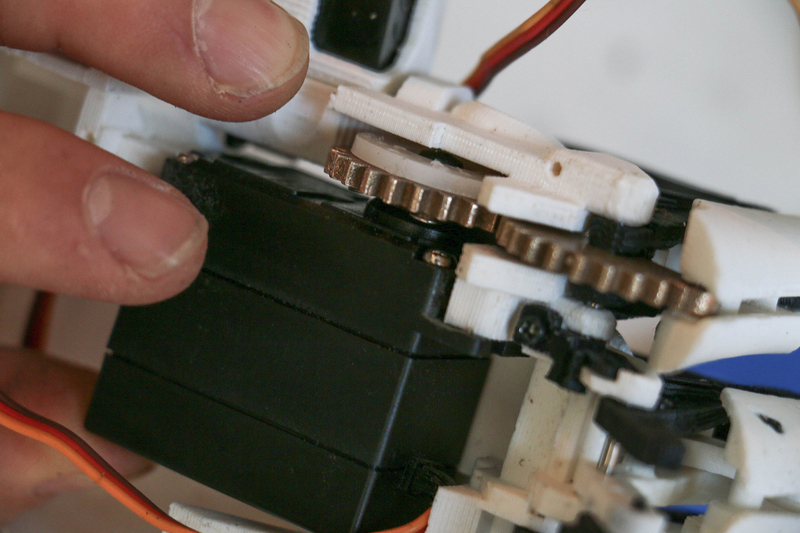 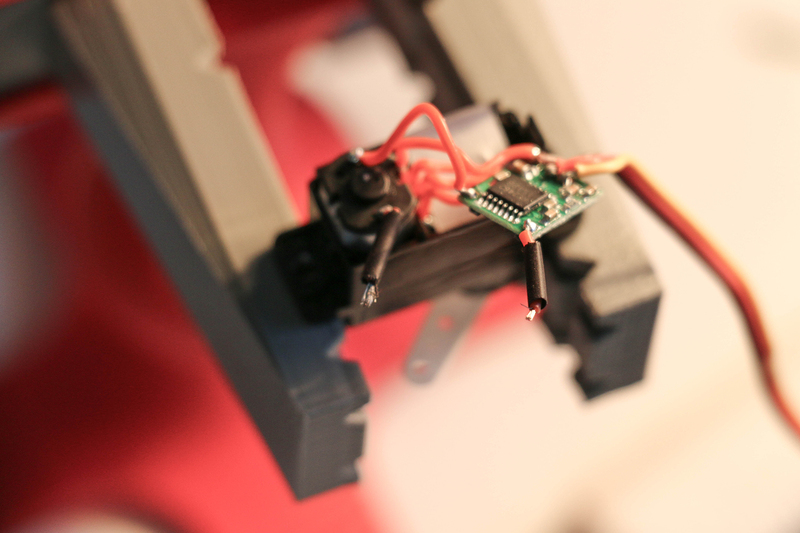 Enlarge 2 holes of the pulley (included with the servo) with a 2mm drill in order to screw the gear on it. 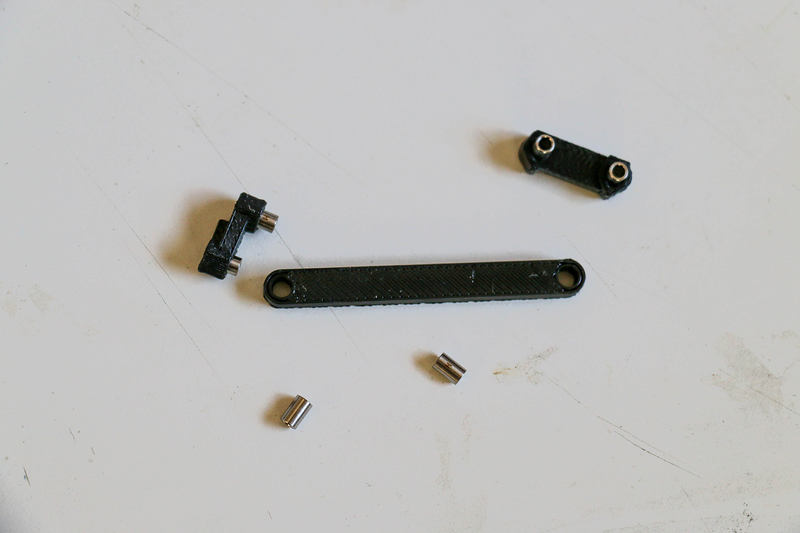 Screw HbRing-LittleCouplerLink01 with 2 screws and 2 washers. 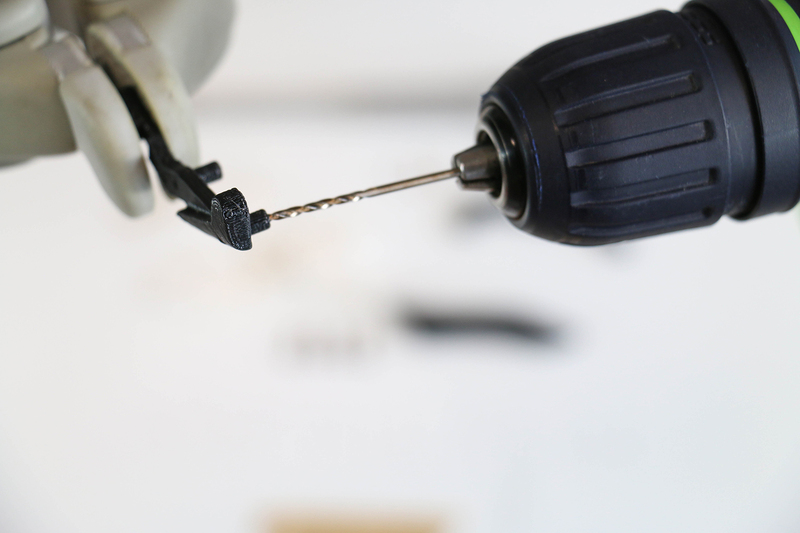 Don't tight too much. 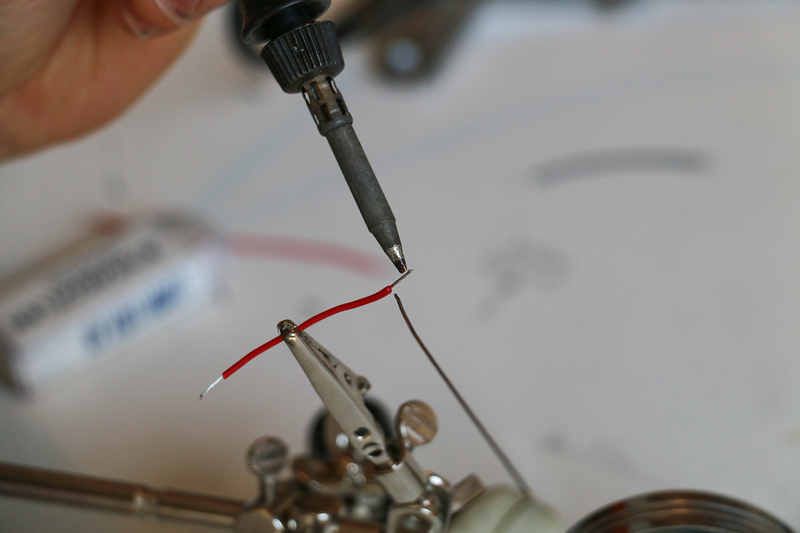 - Check all the comonents - Prepare 4 wire strip length as indicated. 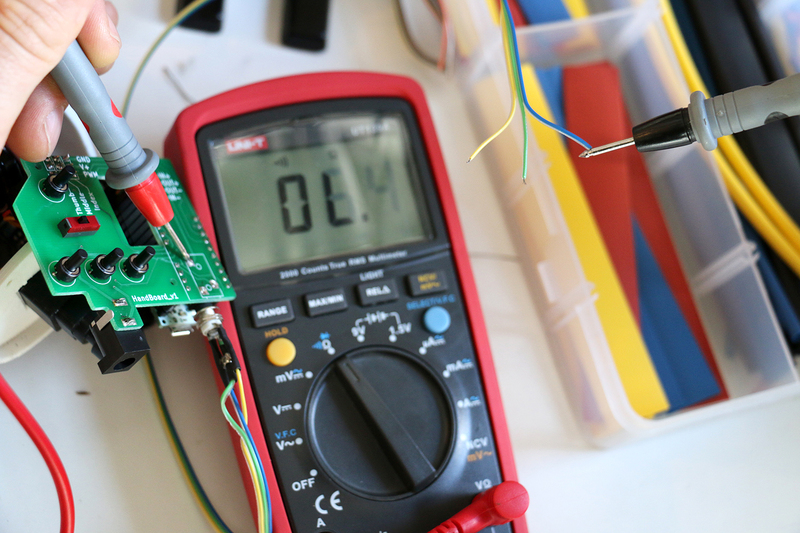 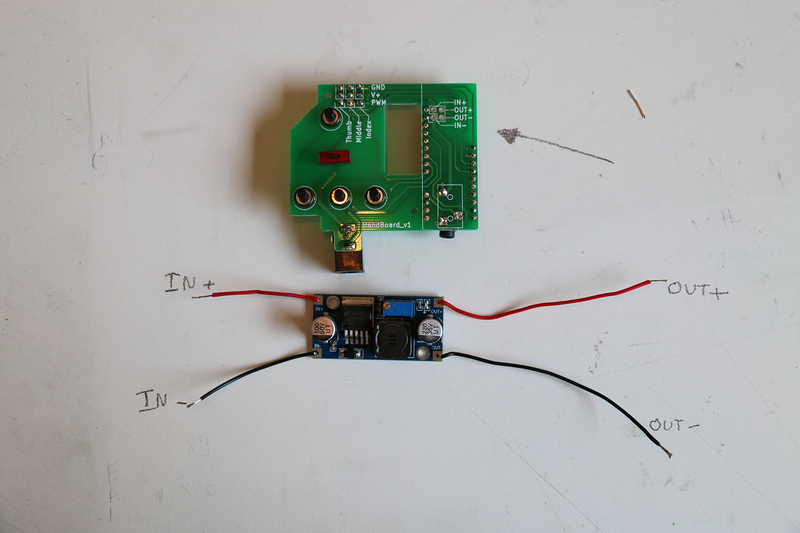 The voltage regulator receive the 7.2V from the battery to converts it into 5V to power the PCB and the arduino - Solder IN+ to IN+, OUT+ to OUT+, IN- to IN- and OUT- to OUT- BRAVO you succeed the soldering part! 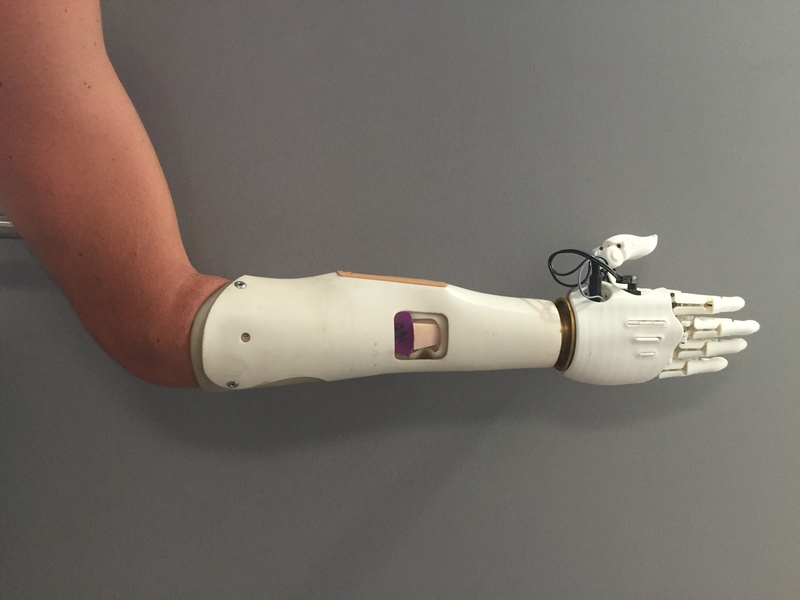 - When the muscle is contracted, the diameter of the forearm changes, so the pressure on the sensor too. 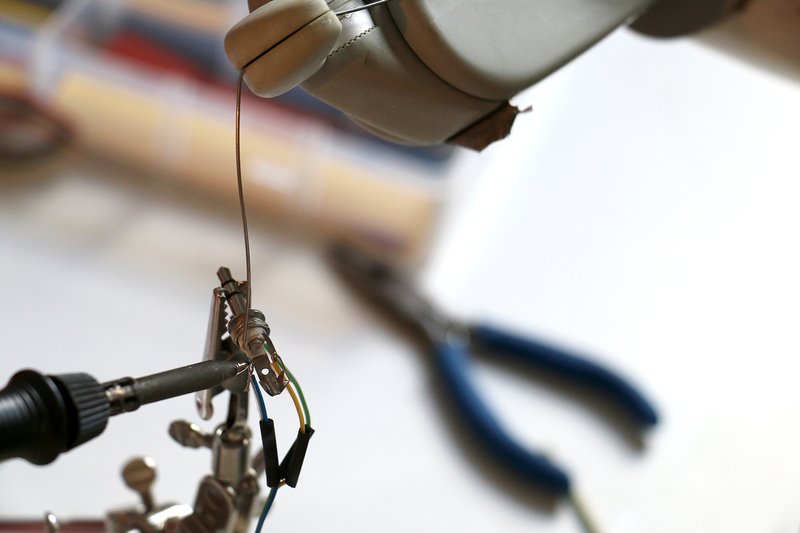 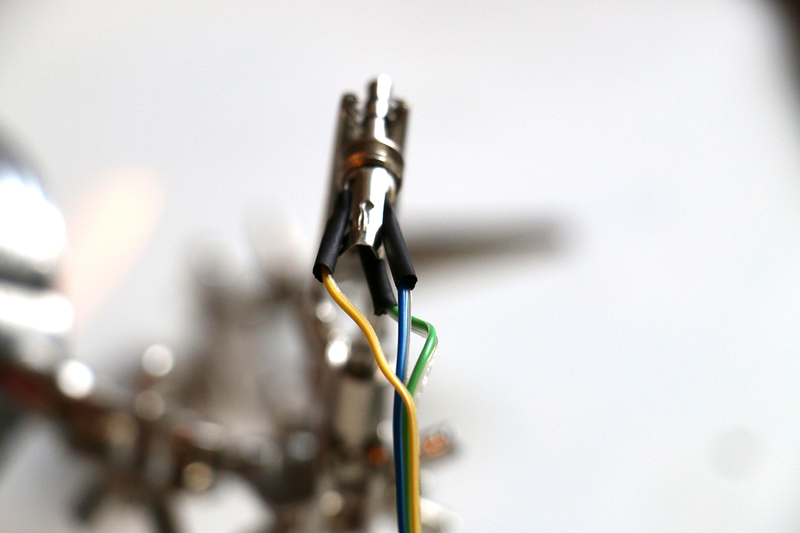 Solder extremities of cables to the sensor by respecting +, signal and ground. 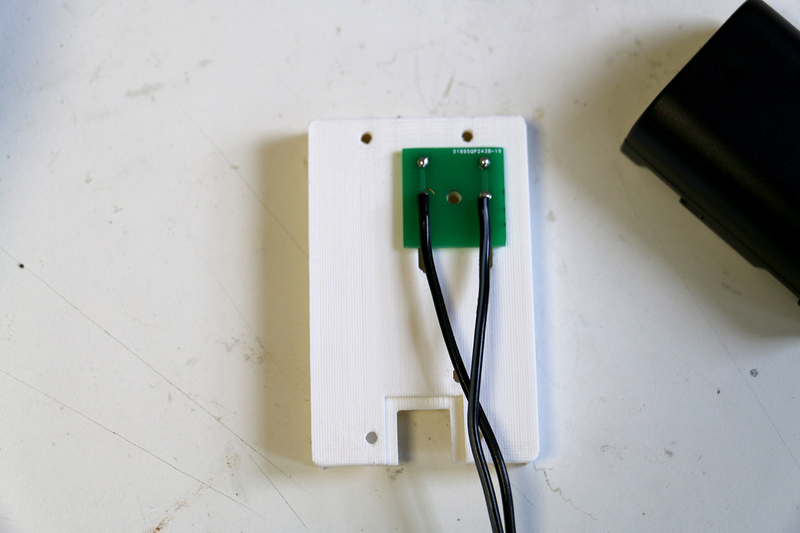 Your muscle sensor/jack is ready, congrats! 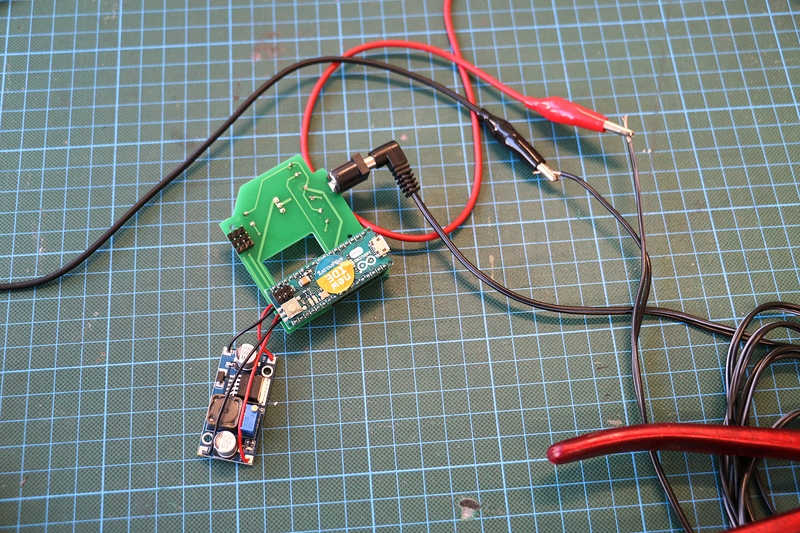 Set the power generator to 7.2V to simulate the current delivered by the battery. 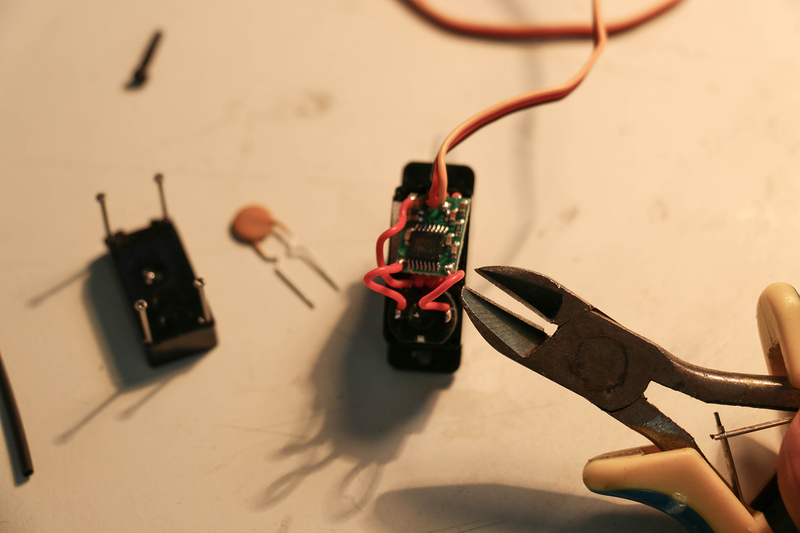 If you don't have a power generator, simply use the battery. 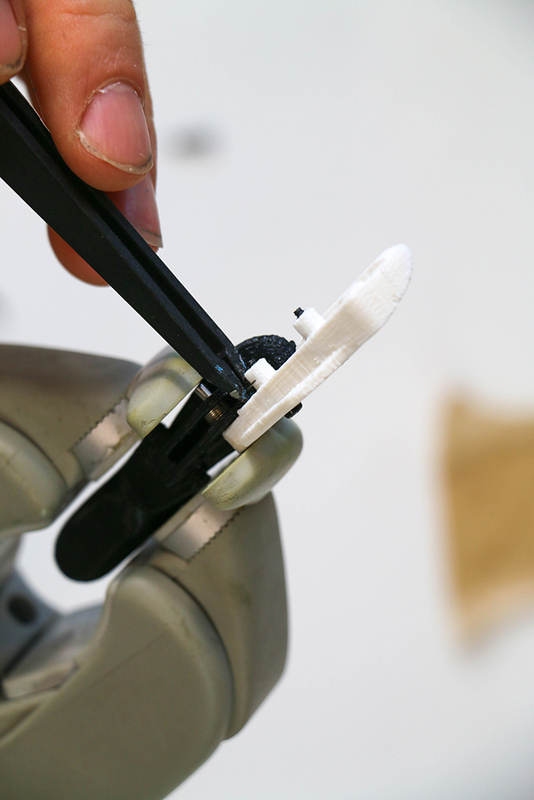 The residual limb has been 3D scanning with the silicone liner on the stump. 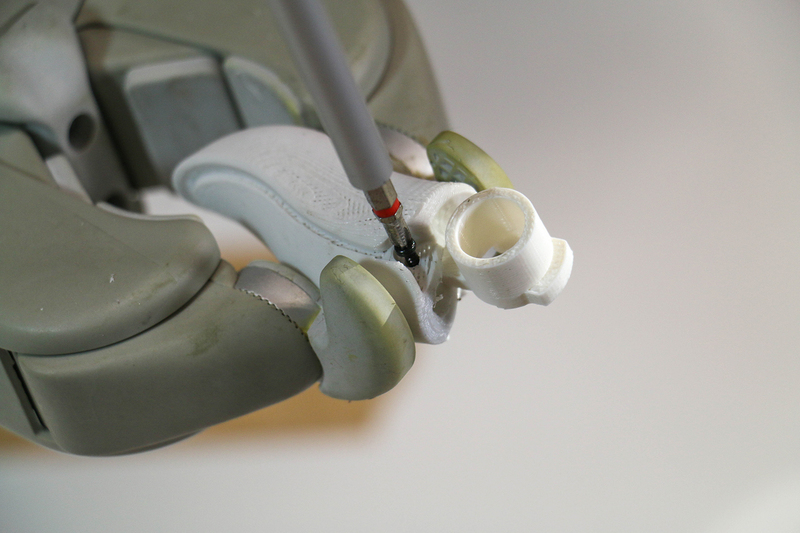 In this configuration, the socket is fitted on the shape of the residual limb + the silicone liner to ensure a good grip between the body and the interface. 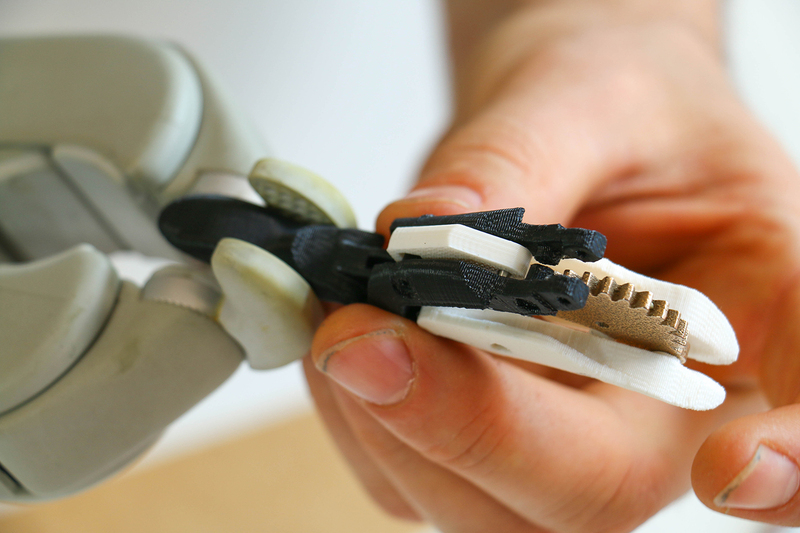 Because each person has a particular need and different grip depending of the level of missing limb, the grip will be different. 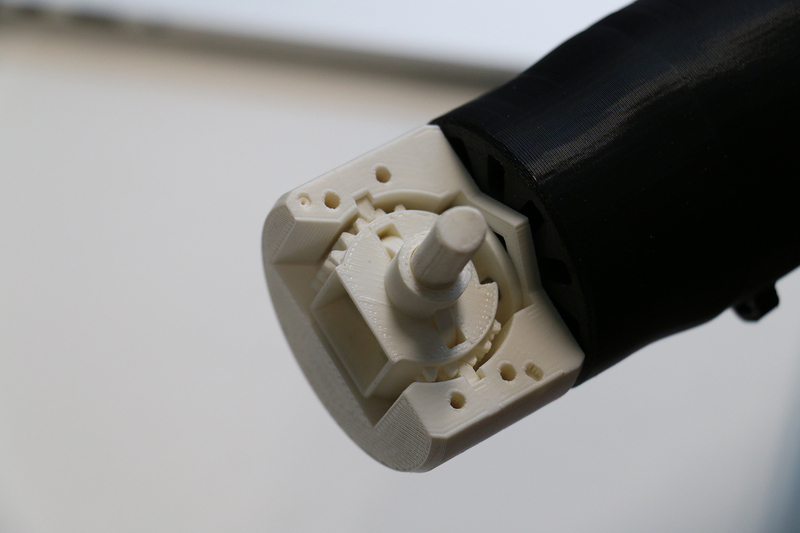 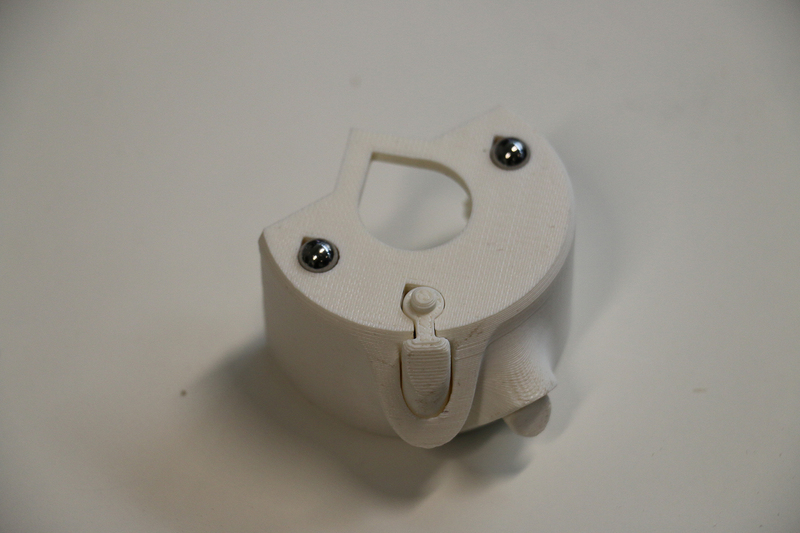 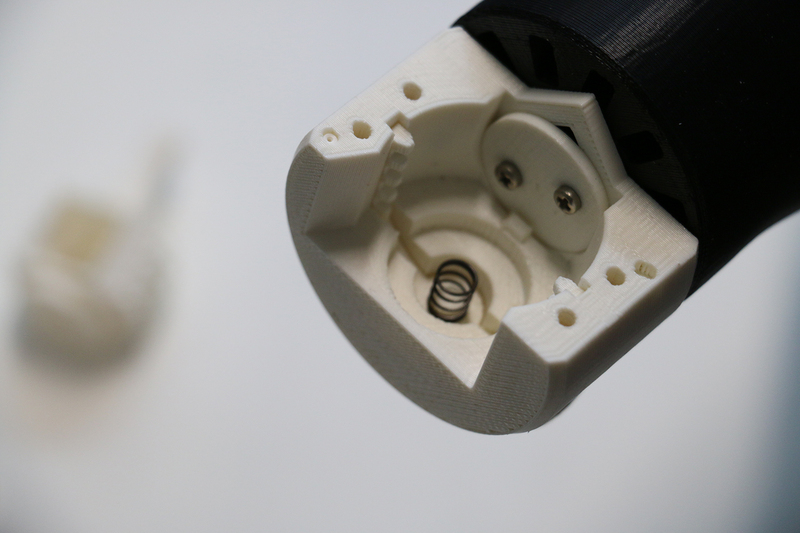 The model of the socket was made with Fusion 360. 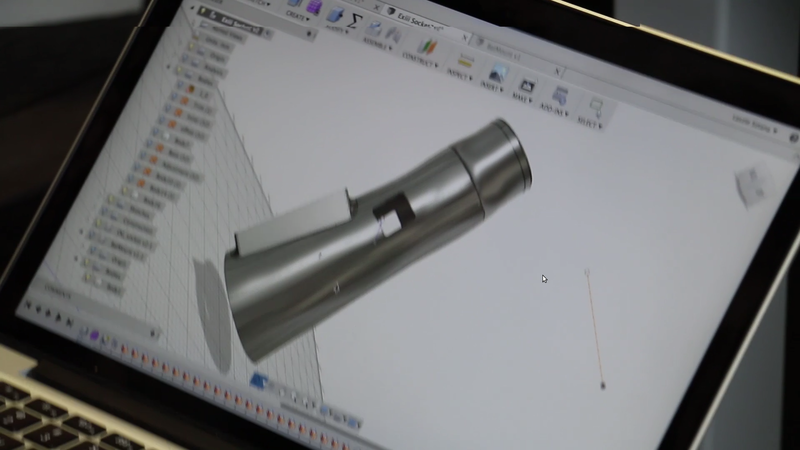 This video is not a tutorial, but a short trailer of the modelling made from the 3D scan. 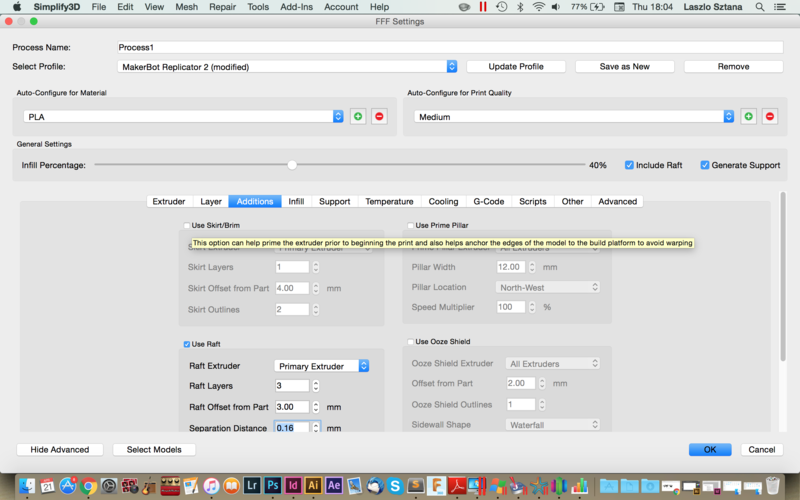 You can choose to slow down the speed of the video clicking the little icon at the bottom right of the video. 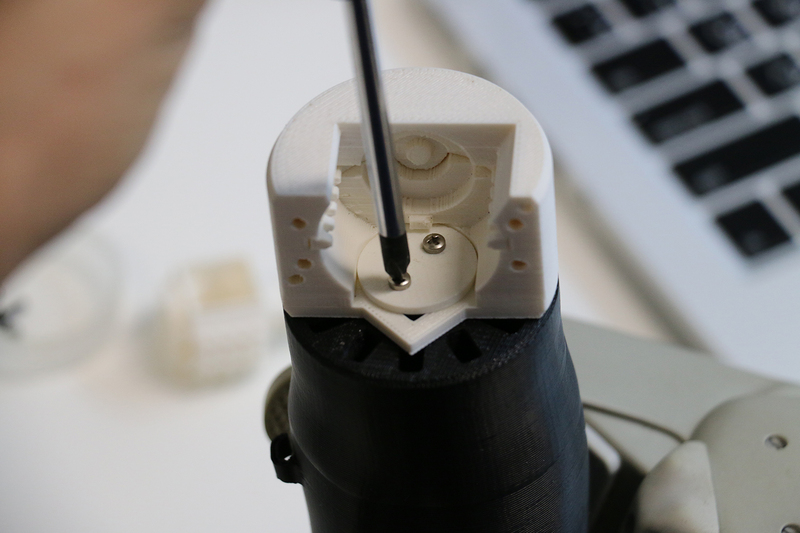 - In this case Lazslo, the 3D modeler integrated 2 square holes which correspond to the wedges of my silicone linar in order to hold the socket my residual limb. 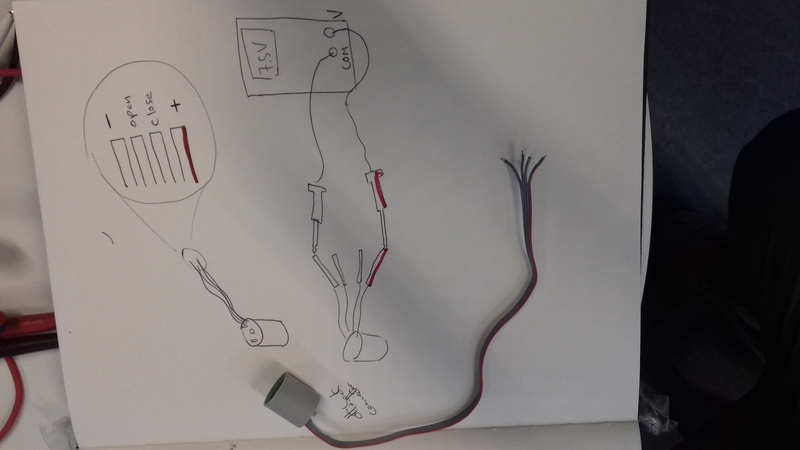 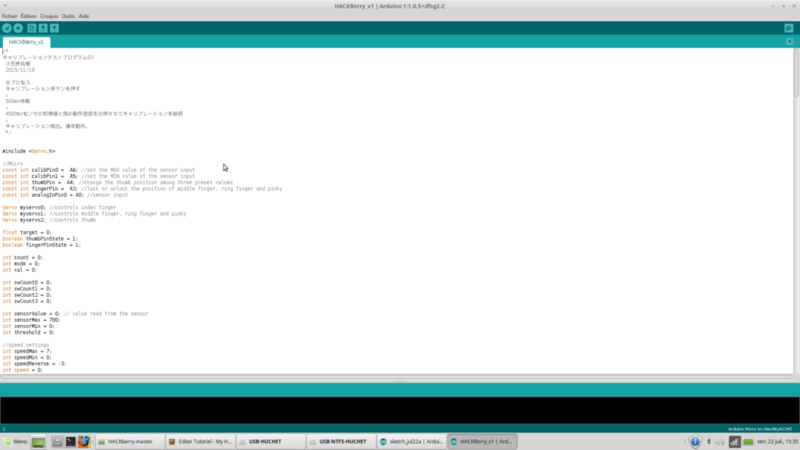 In "Tools", select "card type", then "micro arduino"
In the folder "HACKbery software", open "HACKBerry_v1.ino"
Once the code is uploaded, place the buttons switch in place, tidy the cables and close the hand. 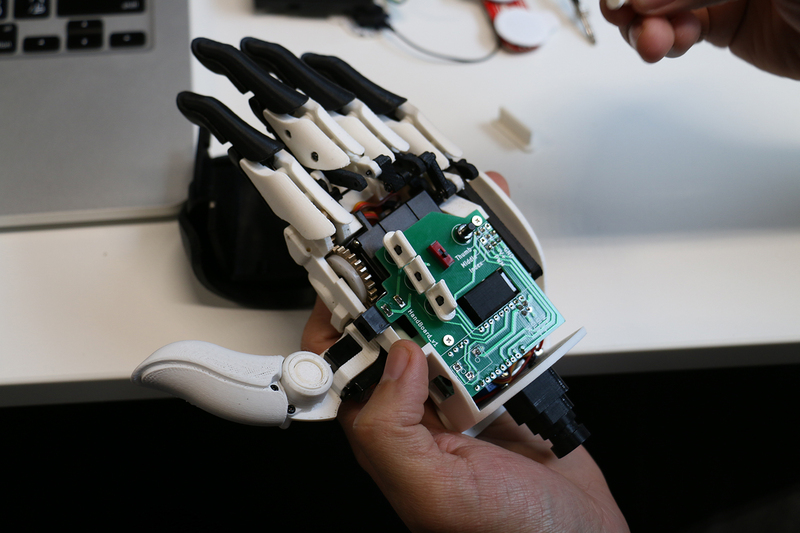 The hand is ready to use. 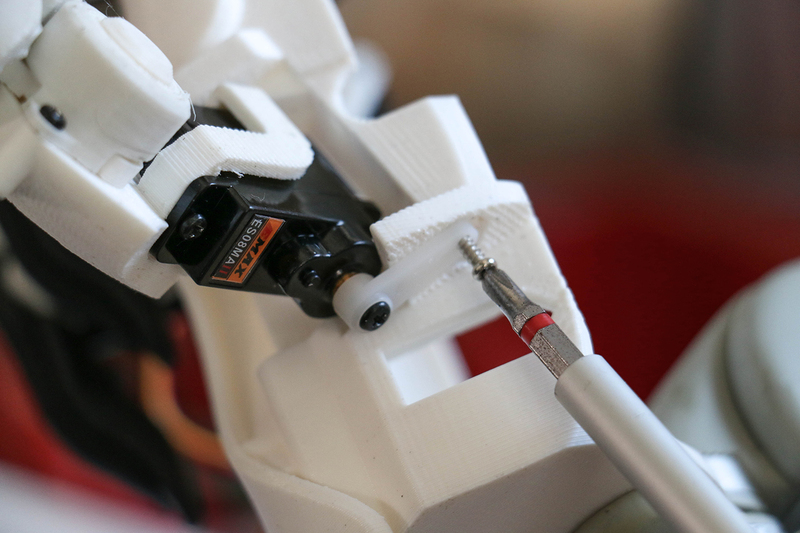 - Stick the electrode close enough to the elbow, this is where the muscle contraction is usually the best. 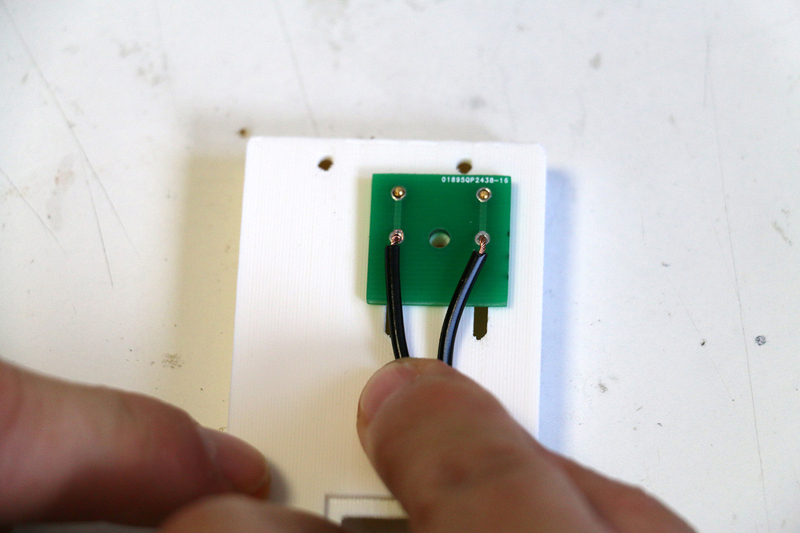 - Press the tact switch that is the closer to the index to launch calibration. 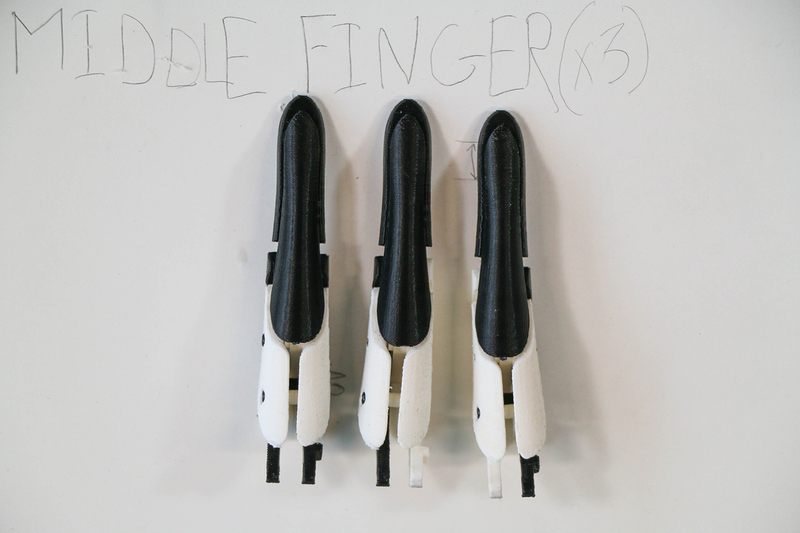 The 3 fingers of the hand will close. 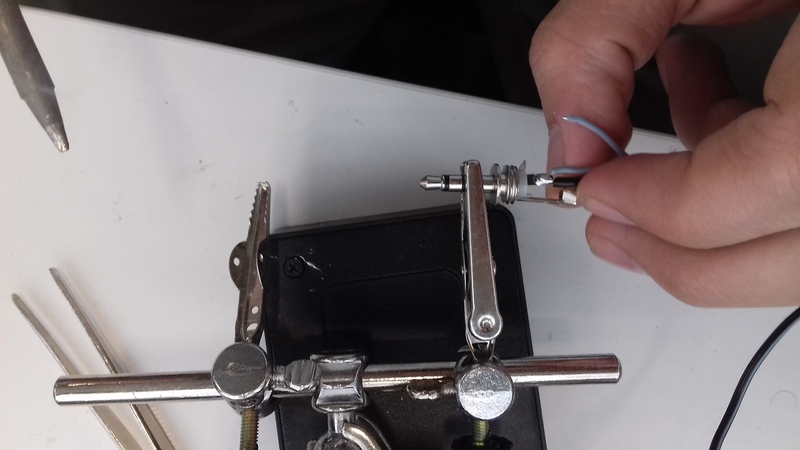 - Contract your muscle and release, the index will close, contract during 2 sec then release again, the index will close again. 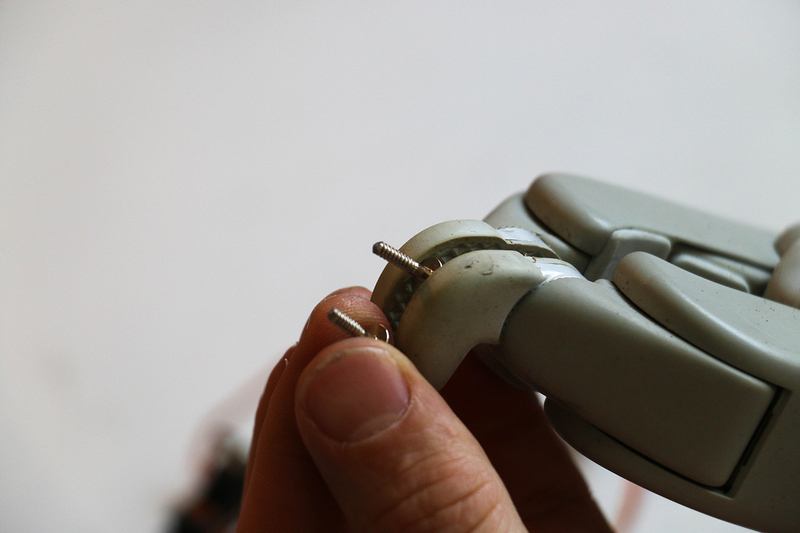 Repeat the operation until the 4 fingers open. 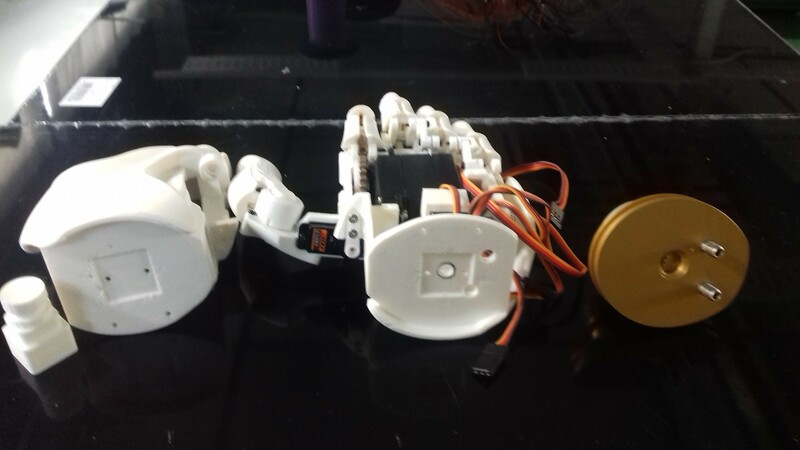 The hand itself is the same for both versions, the difference is into the human machine interface (socket, electrodes and wrist). 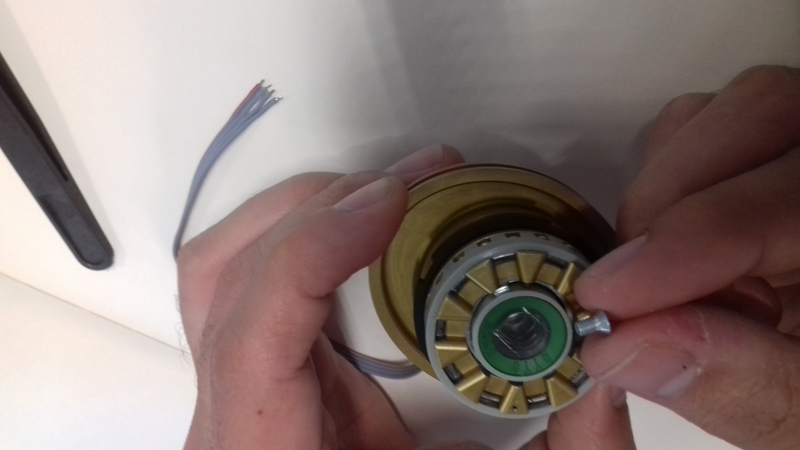 The hybrid version is supposed to be adapted on a professional wrist disconnector (not available in the market). 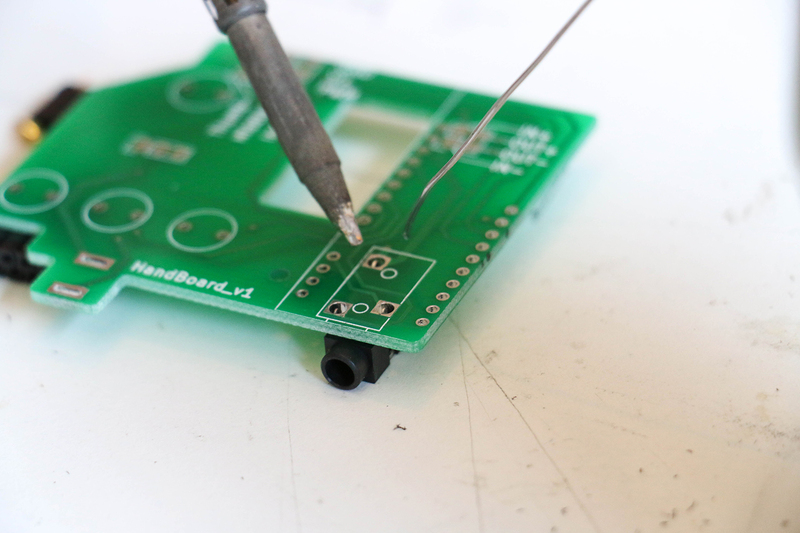 This hybrid version was made in order to be able to plug the hand directly on my daily used socket. 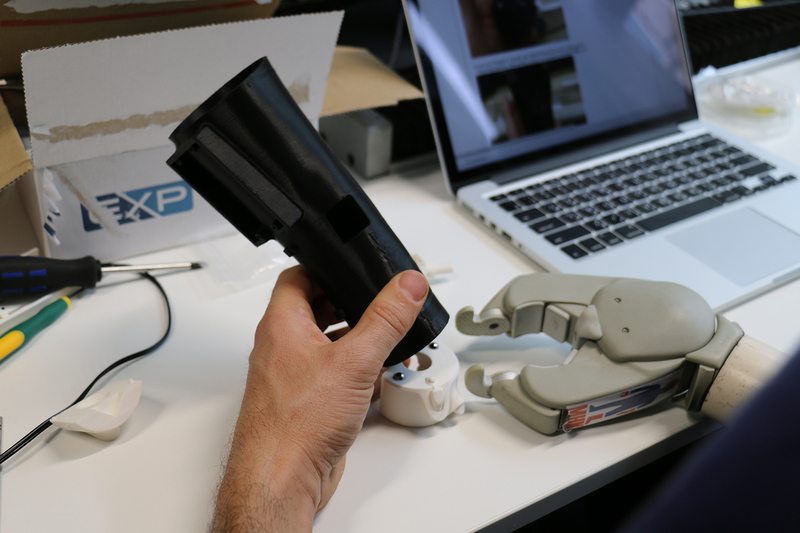 This version was possible to make thanks to the consulting from a certified O & P (orthotist and prosthetist) who provided us the component. 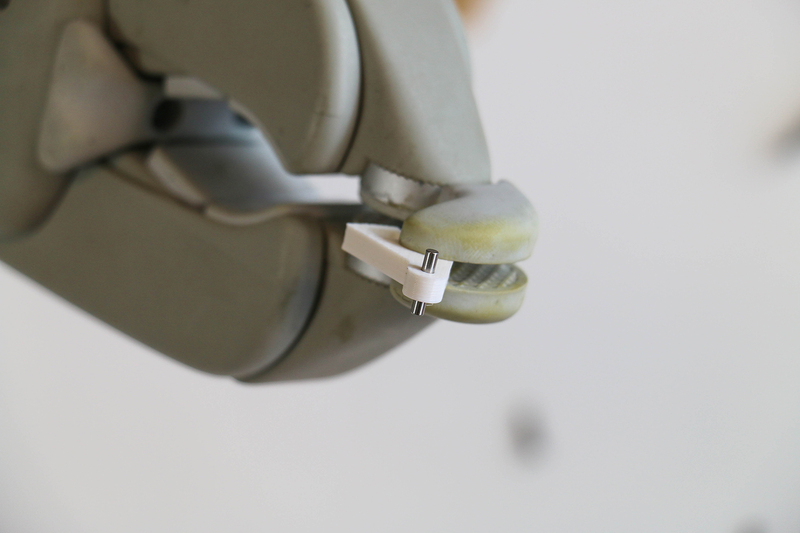 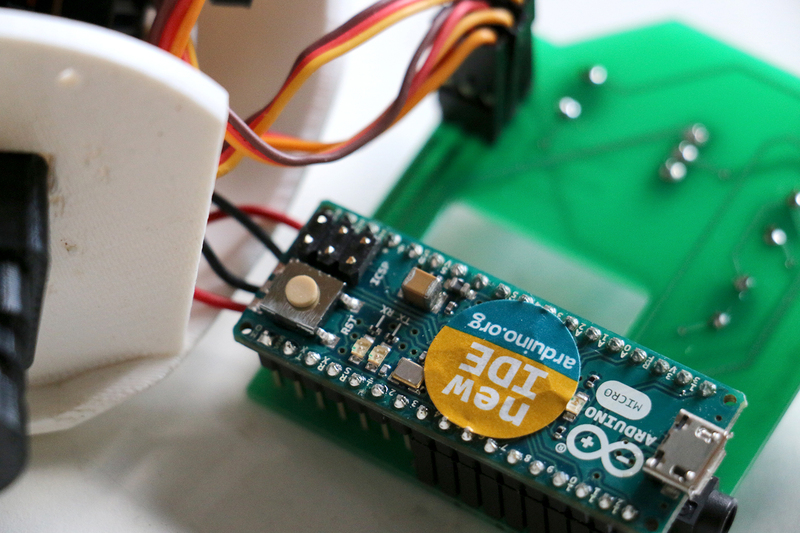 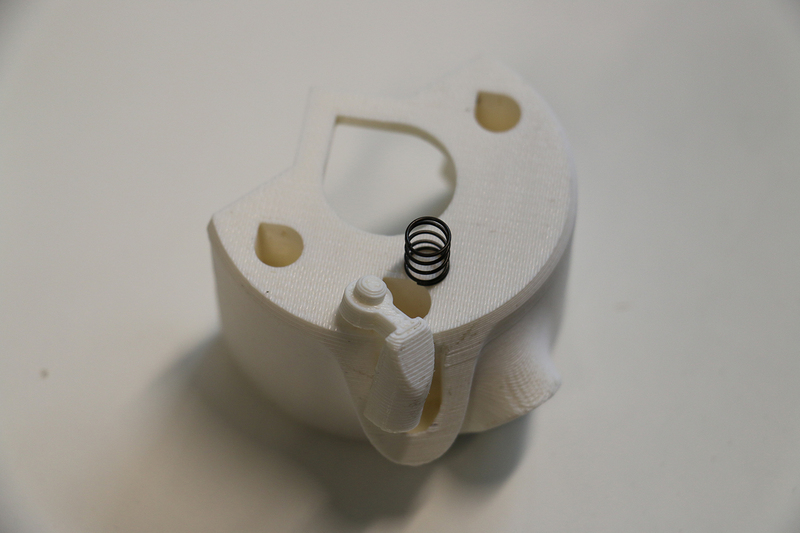 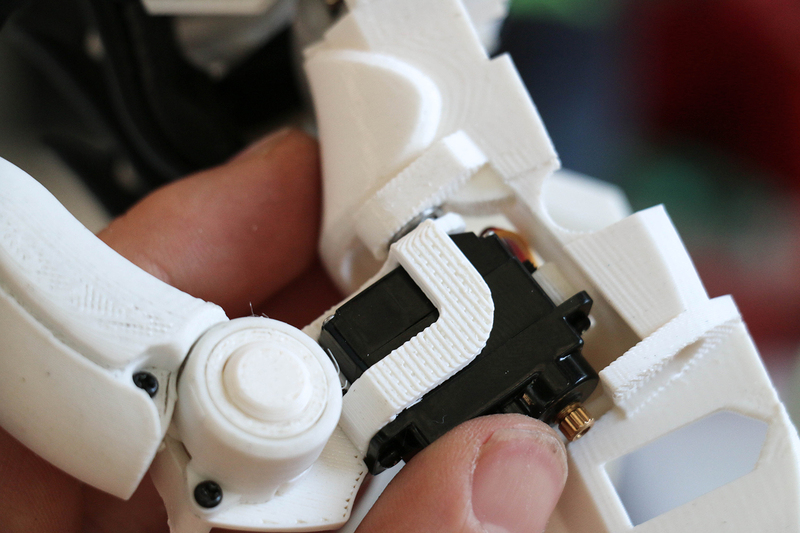 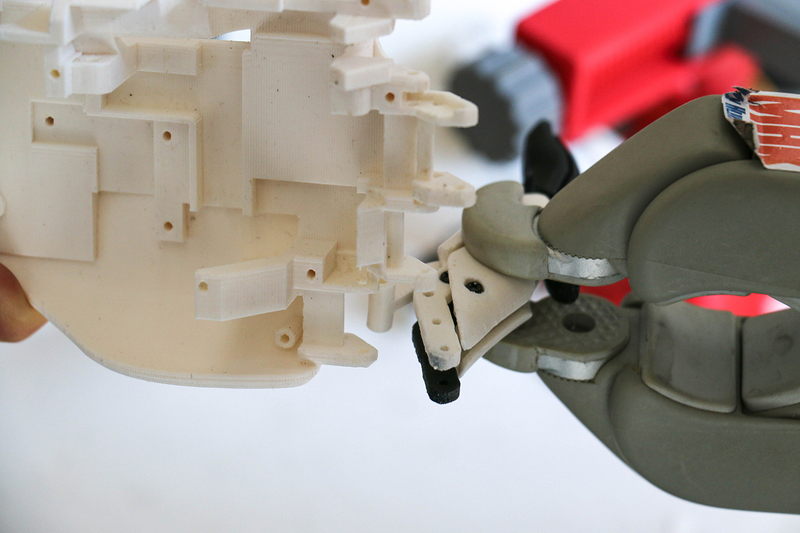 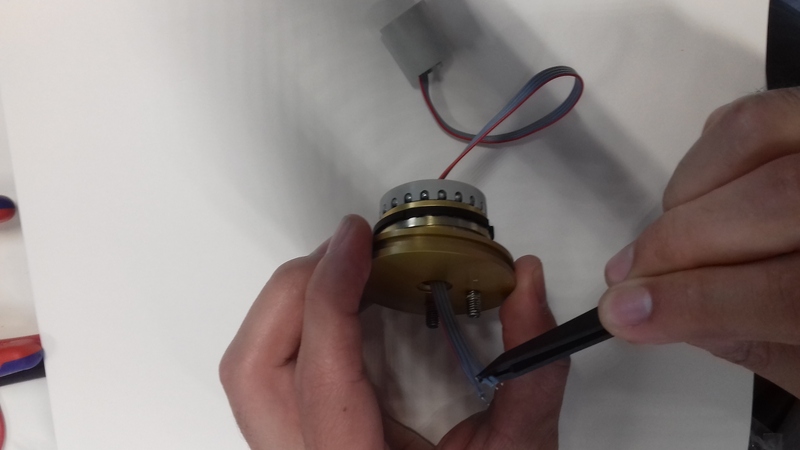 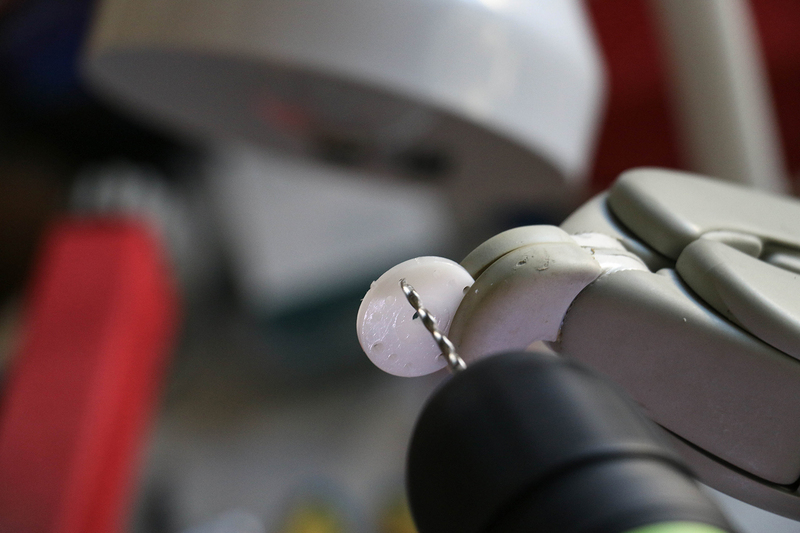 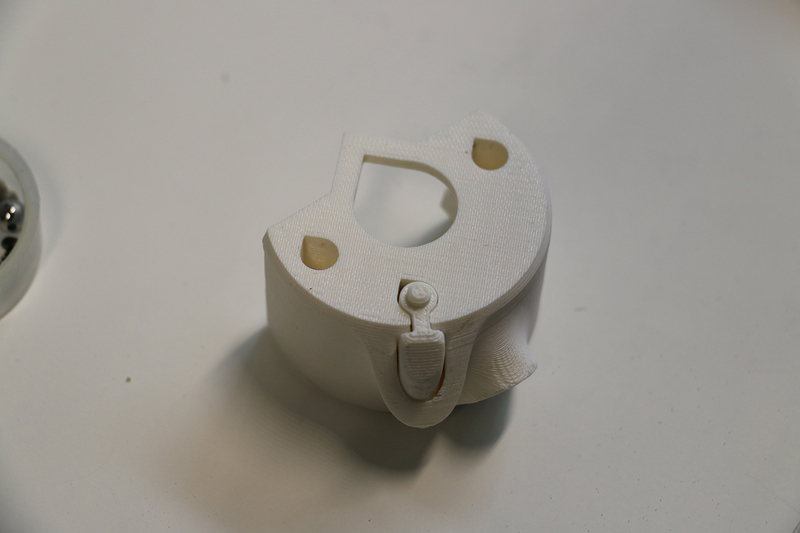 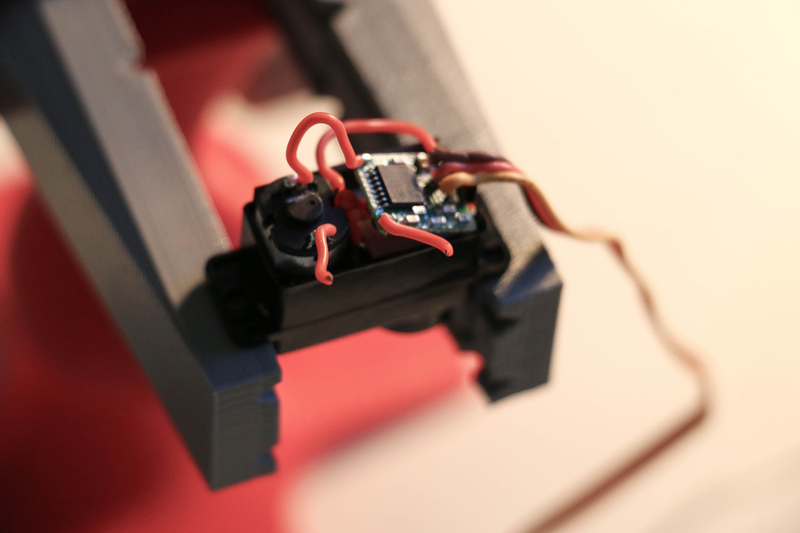 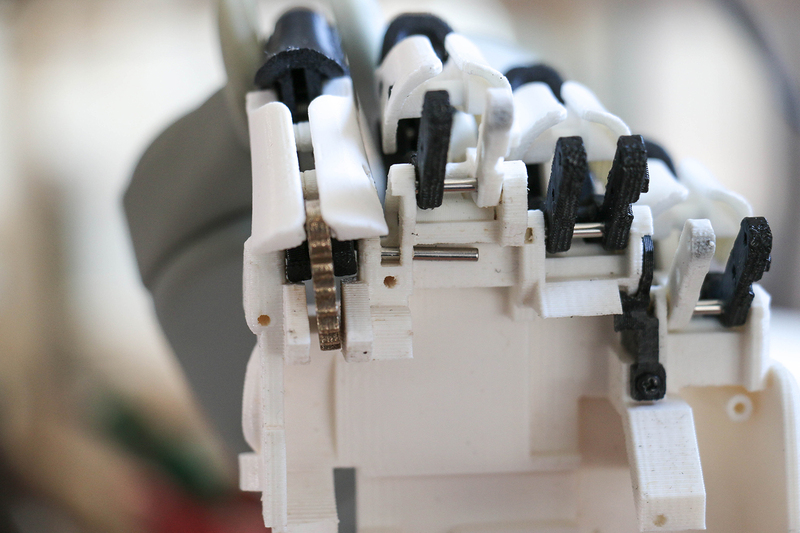 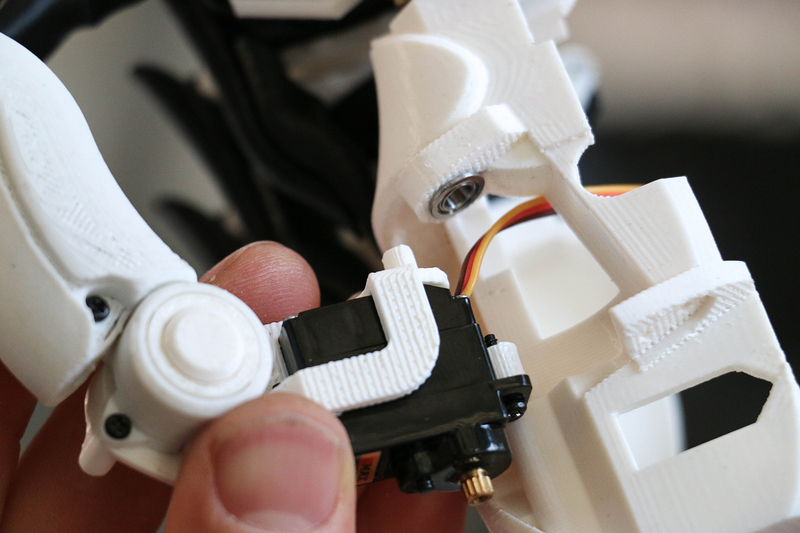 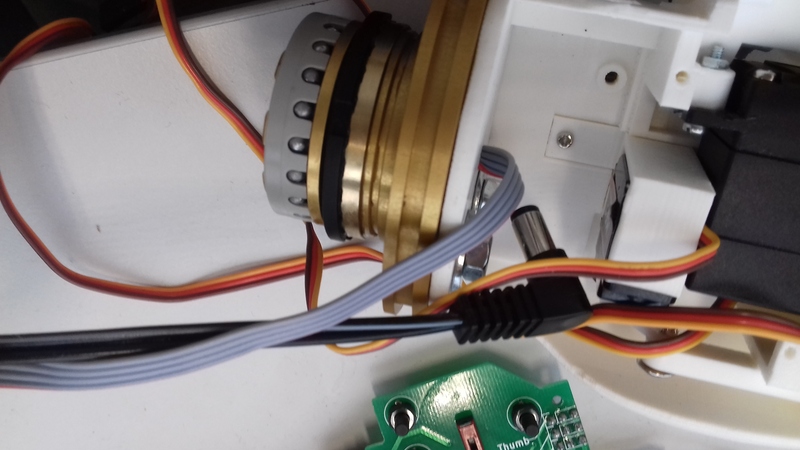 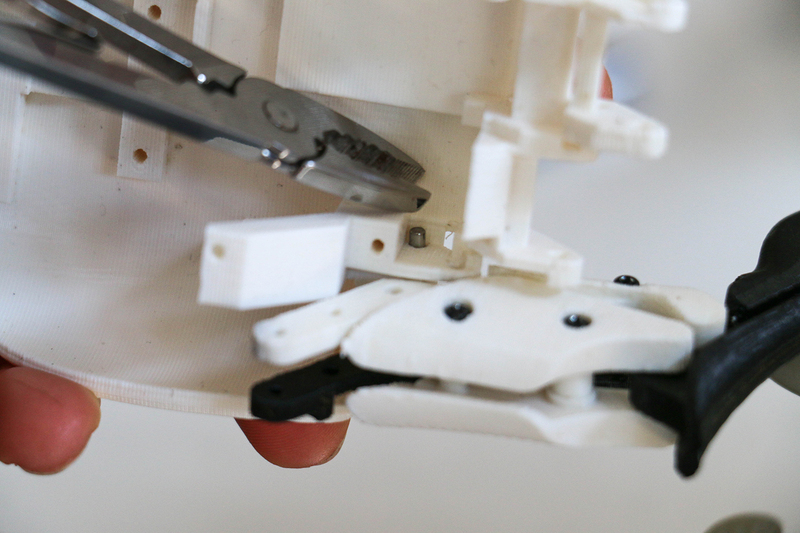 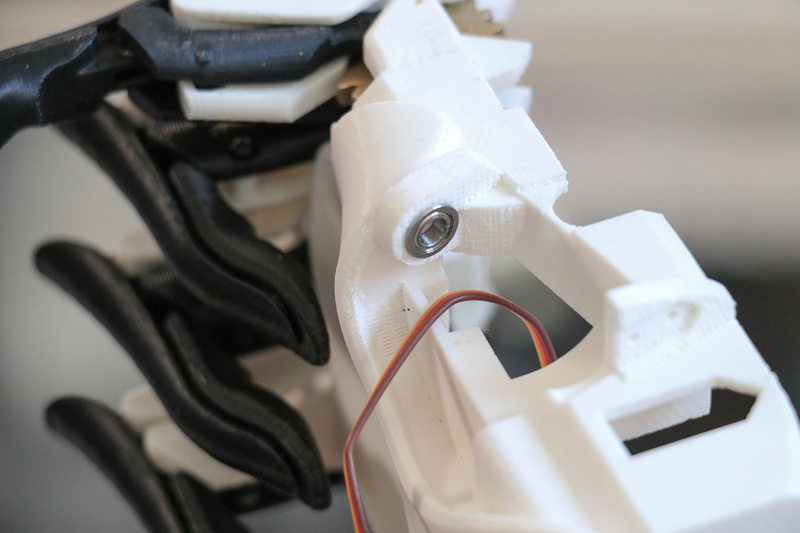 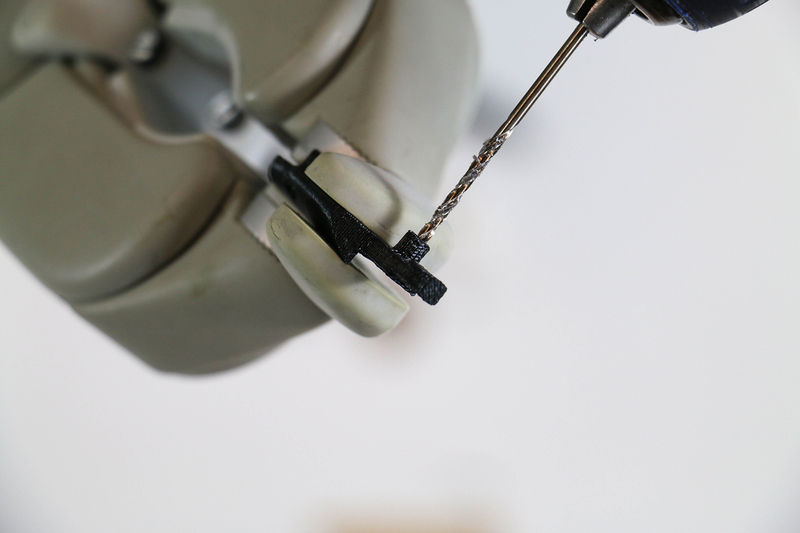 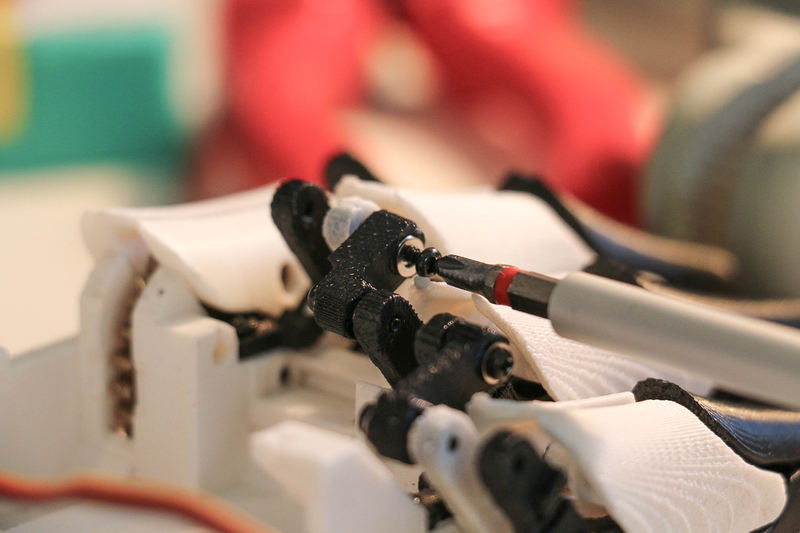 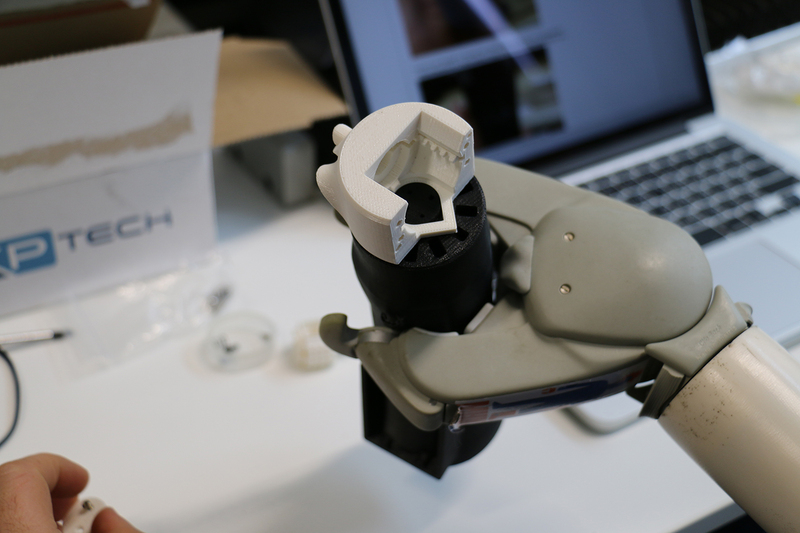 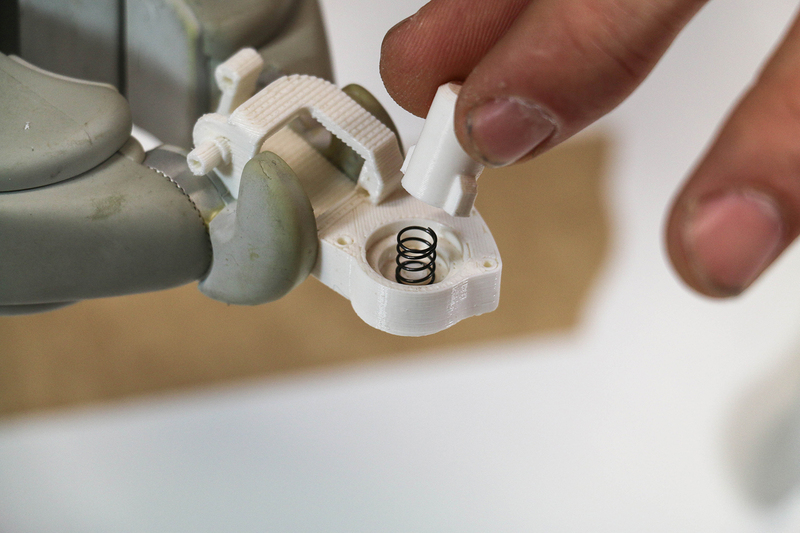 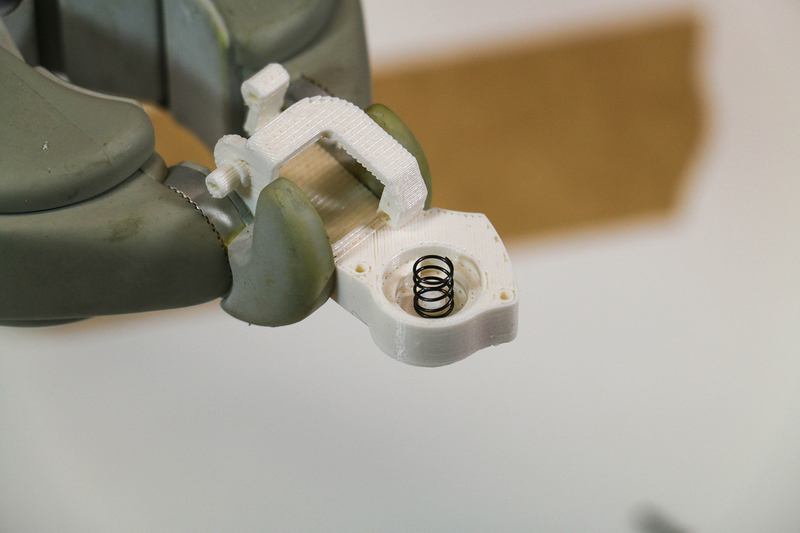 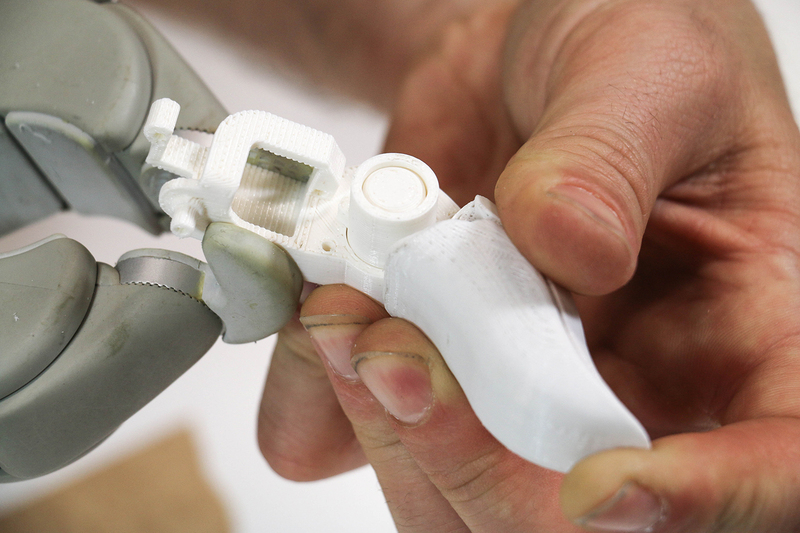 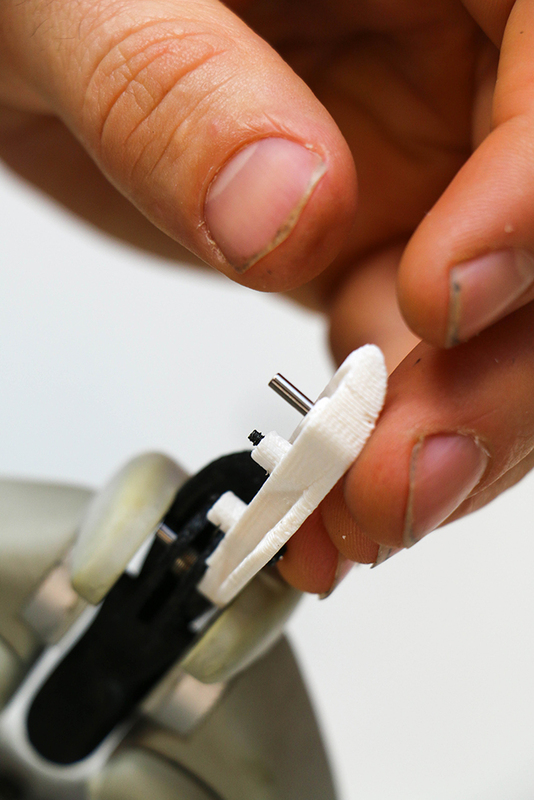 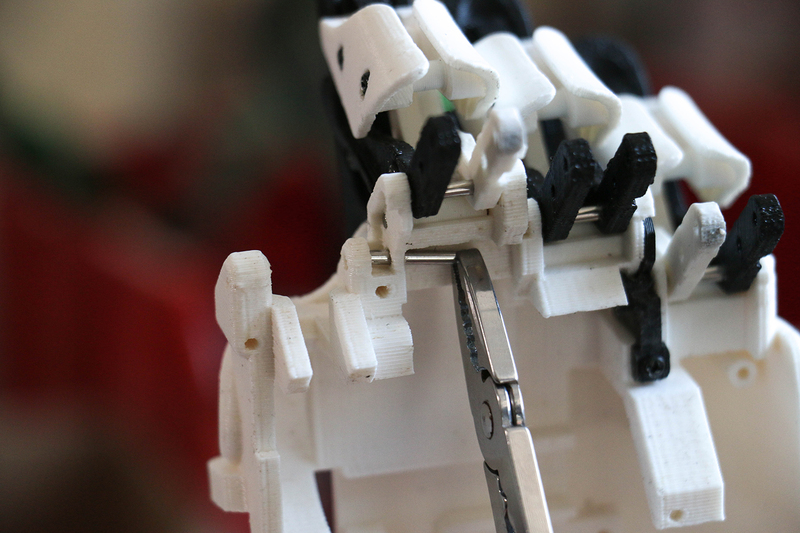 The special wrist disconnector is not available, but you can find an equivalent if you talk with a certified O & P.
- The fablab version is the closest to the original Exiii project using the mechanical design of the wrist, a 3D printed socket and affordable muscle sensors. 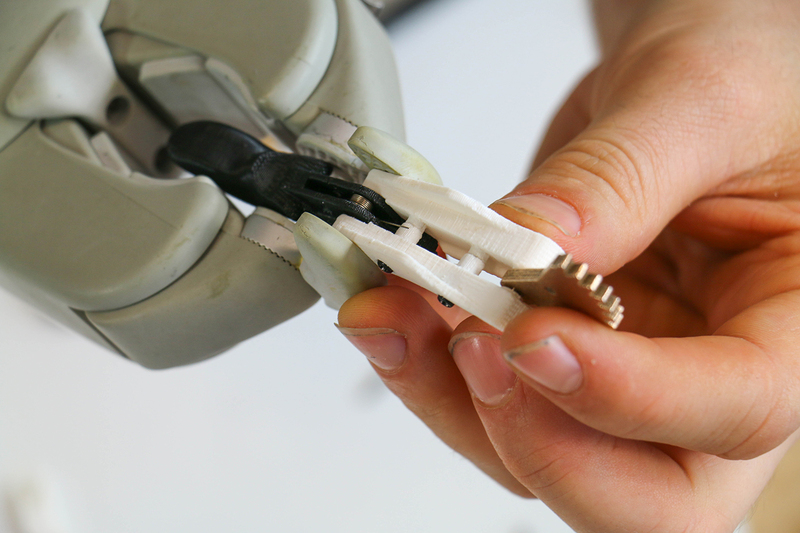 - The hybrid version is made to be adapted on a professional socket of a myoelectric hand using a wrist disconnector. 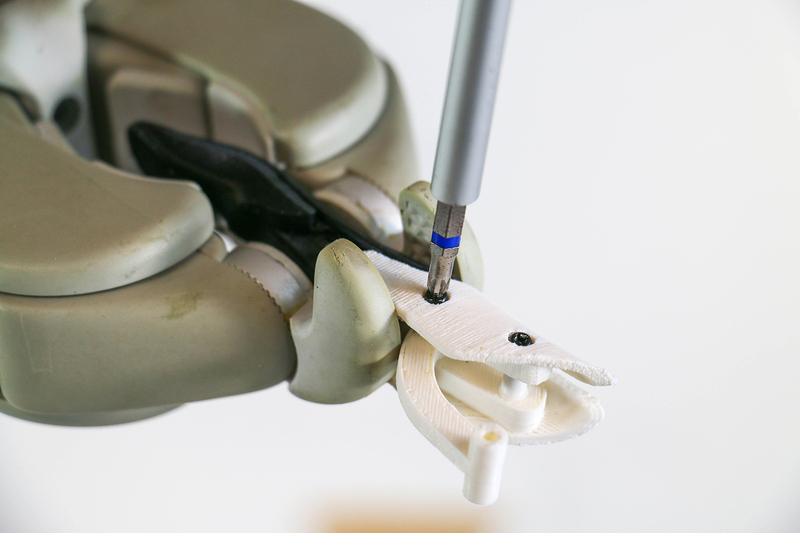 The wrist is not available on the market, and only O & P certified can provide it. 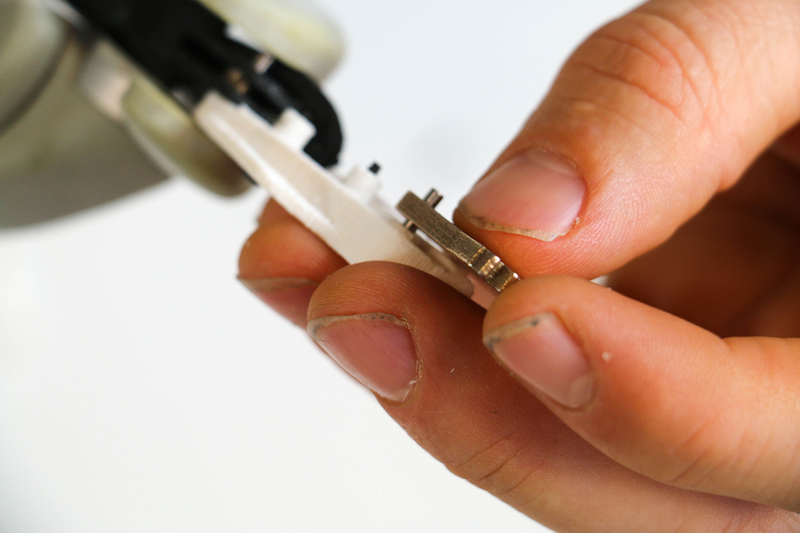 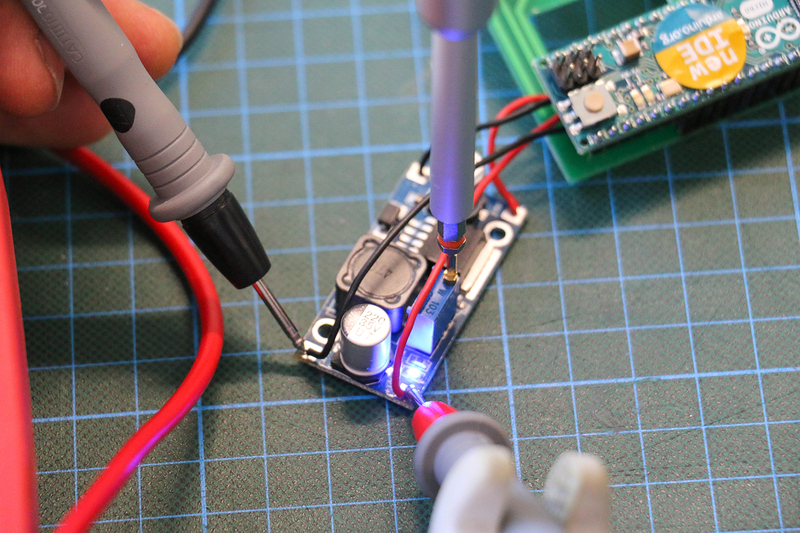 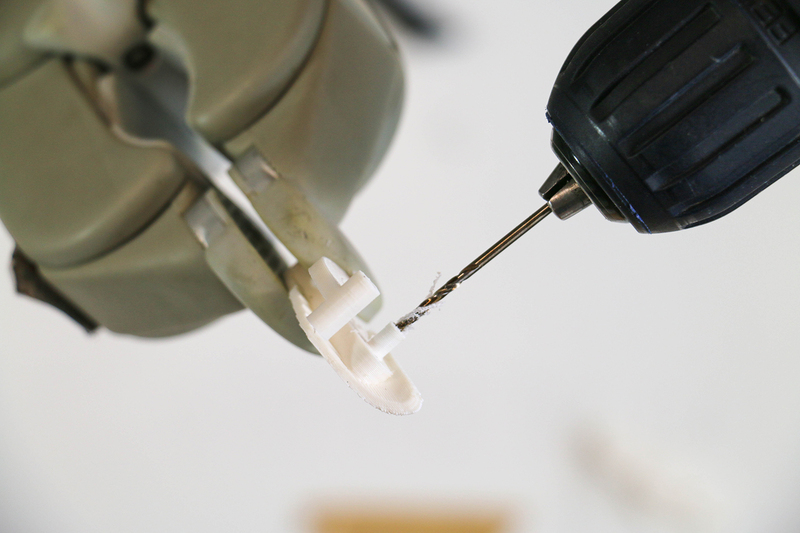 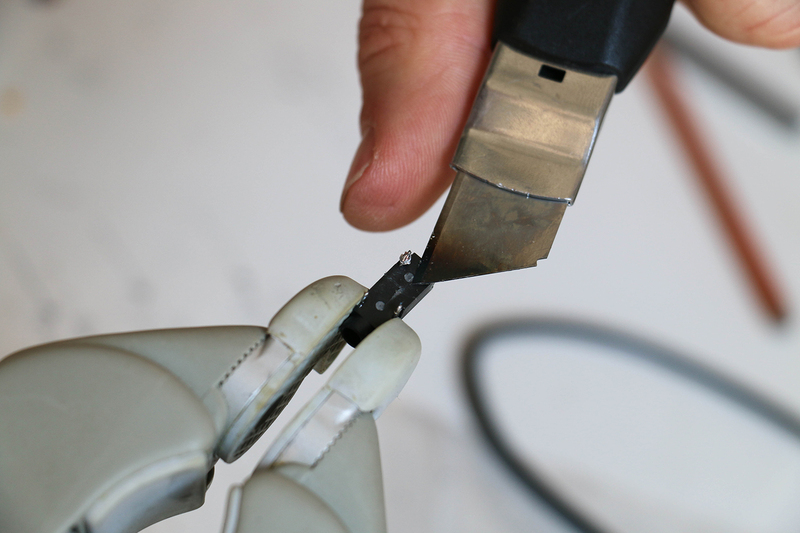 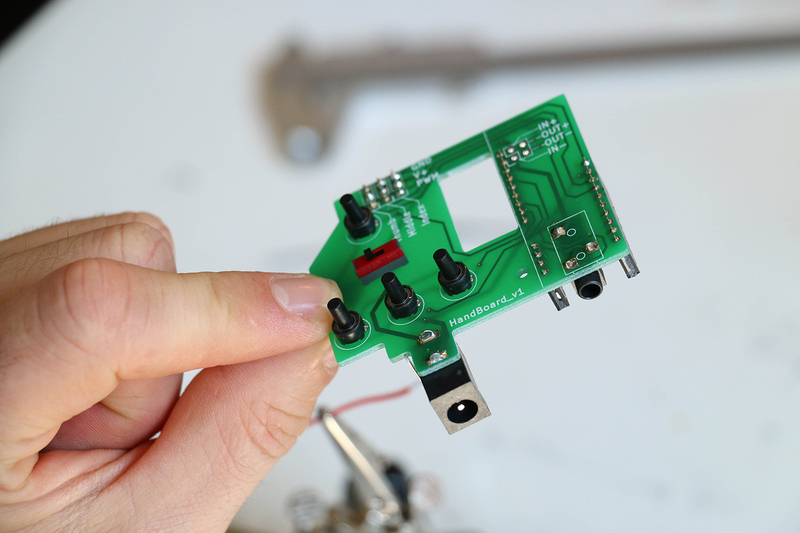 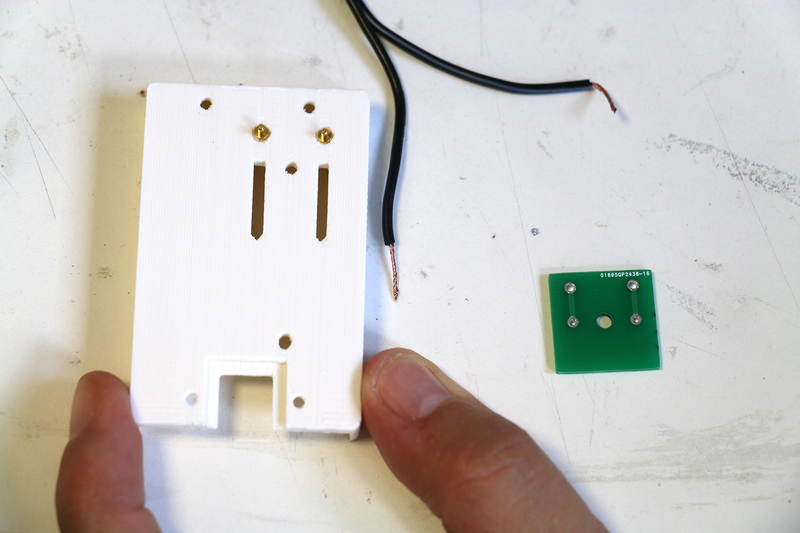 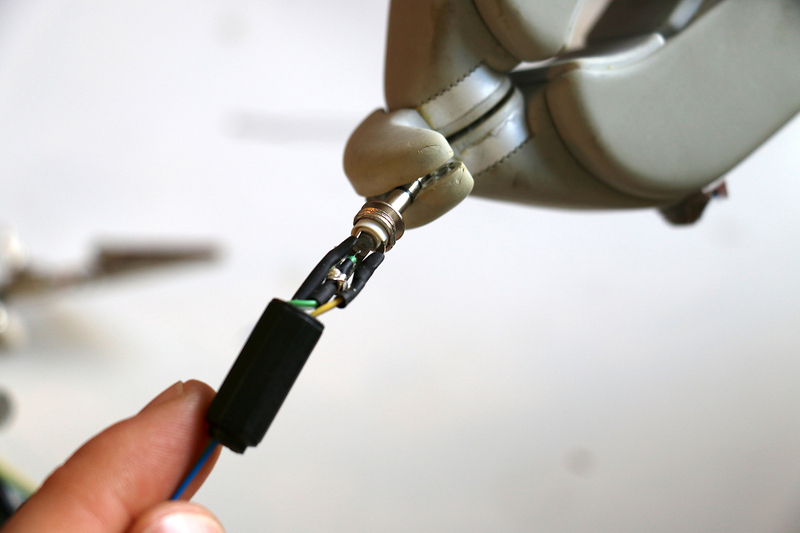 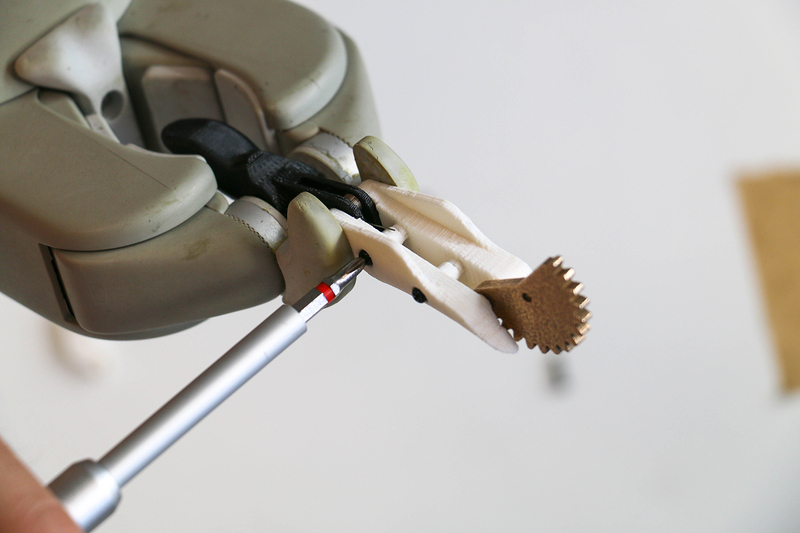 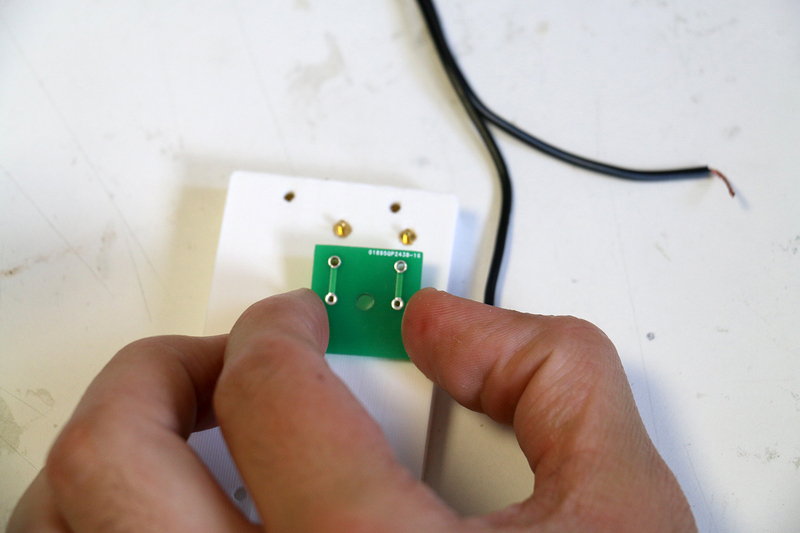 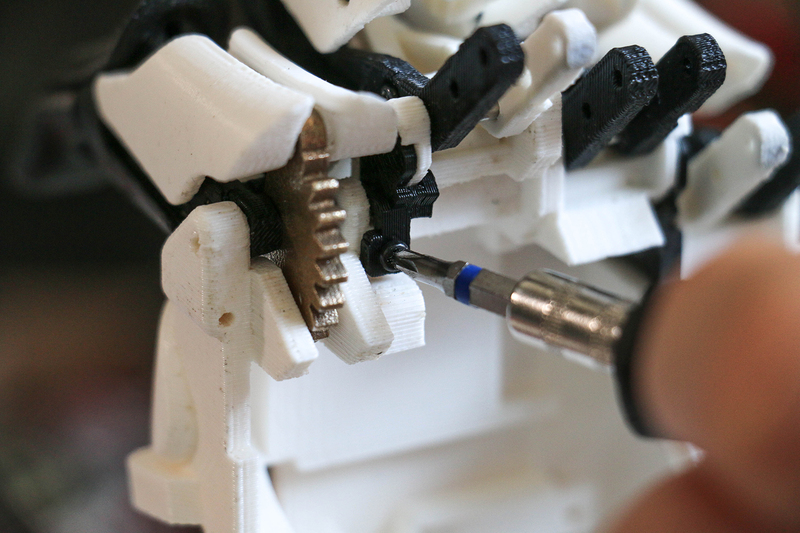 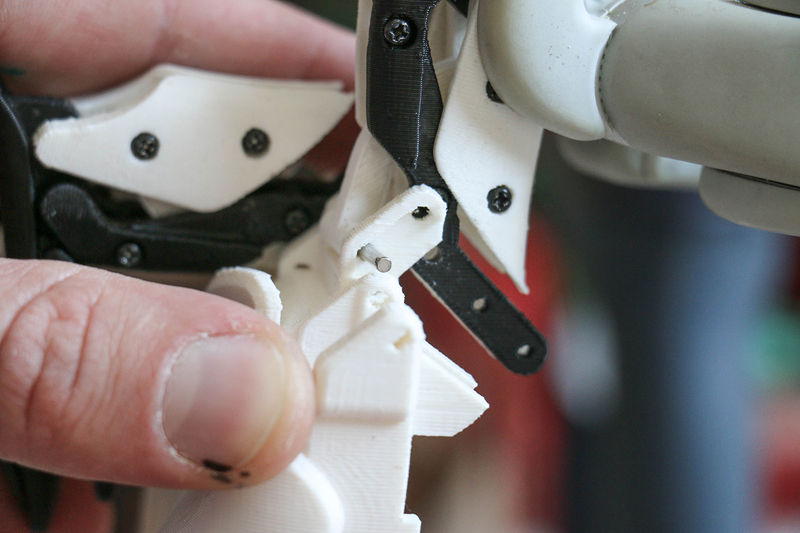 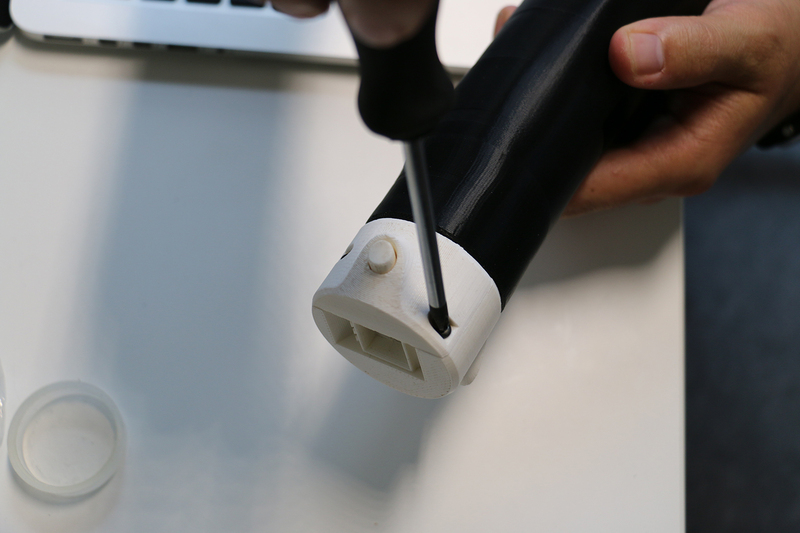 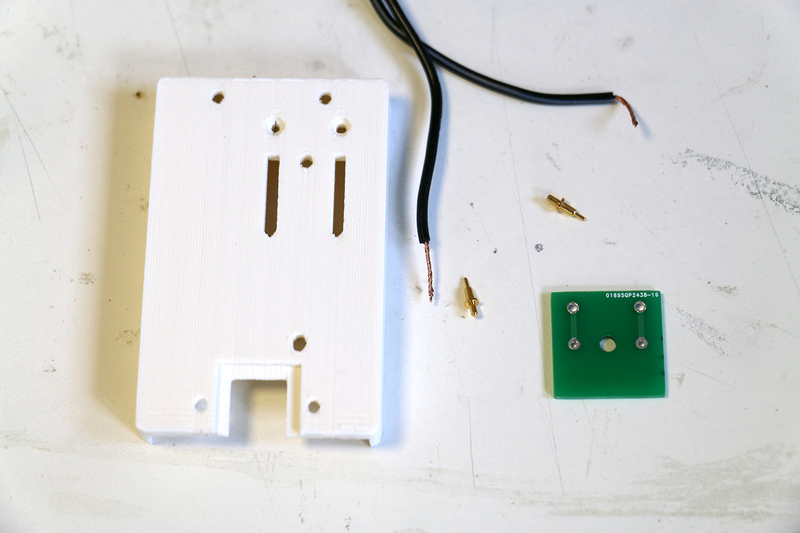 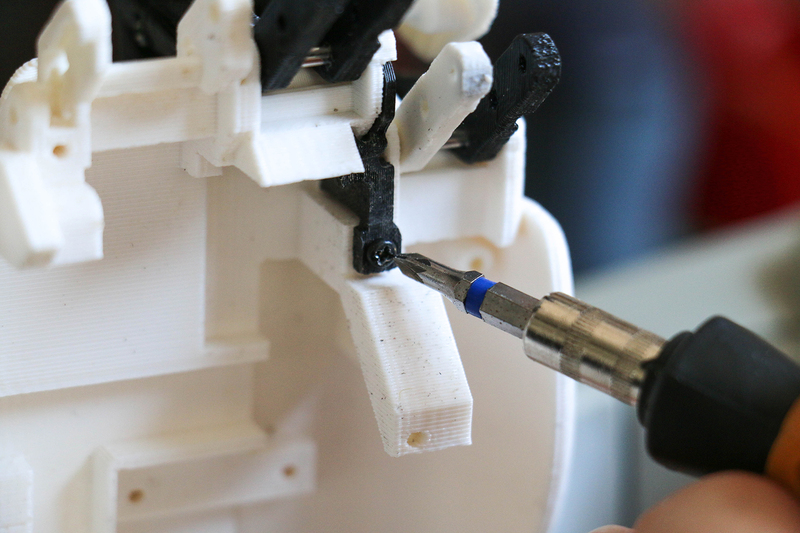 Nonetheless, this non open-source version allows to adapt the hand on a professional socket. 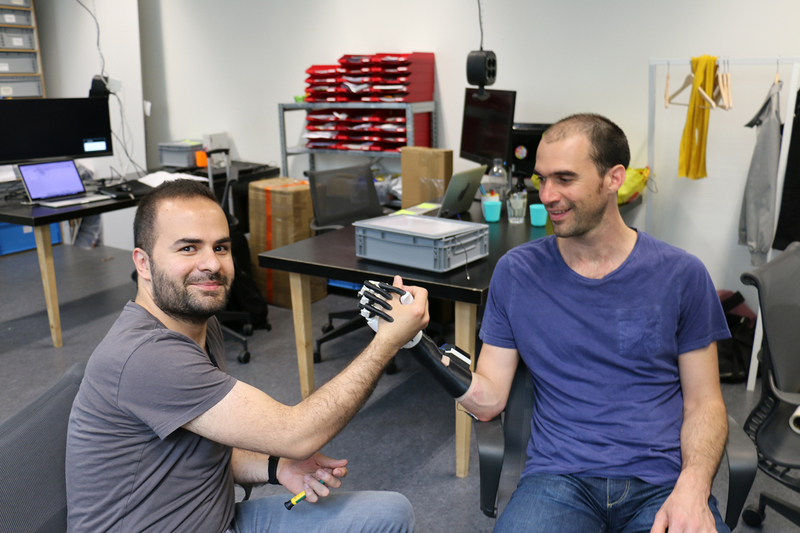 In this way, we can make sure the user is comfortable and can control the hand the same way he controls his everyday myoelectric prosthesis. 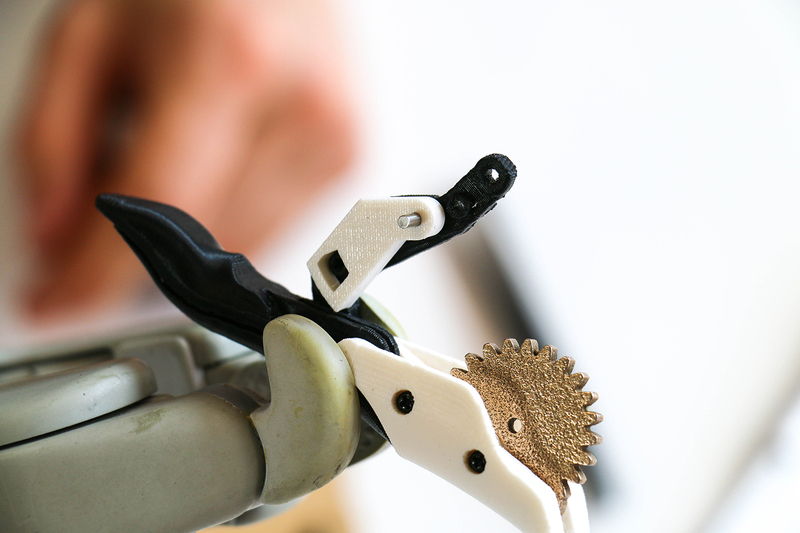 Moreover, using professional muscle sensor will allow the user to focus on the mechanical reliability of the Exiii hand. 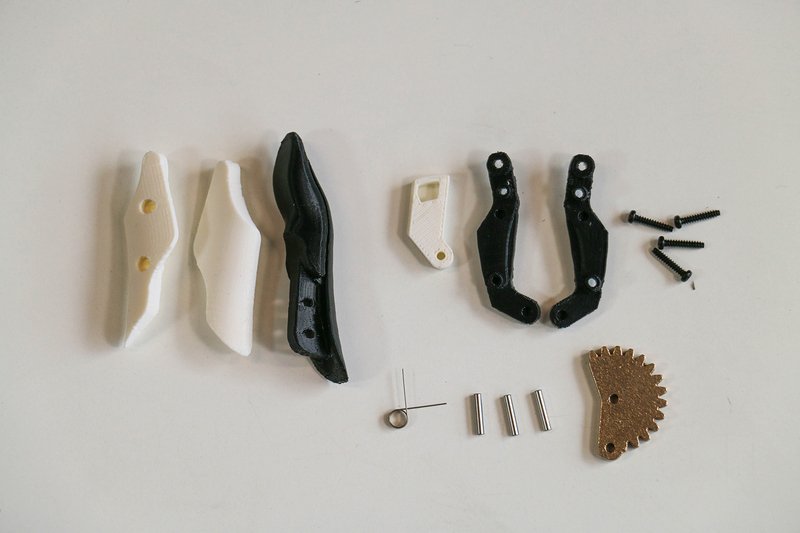 The residency at Fab Lab Berlin and the consultation from Ottobock made possible the creation of an hybrid version. 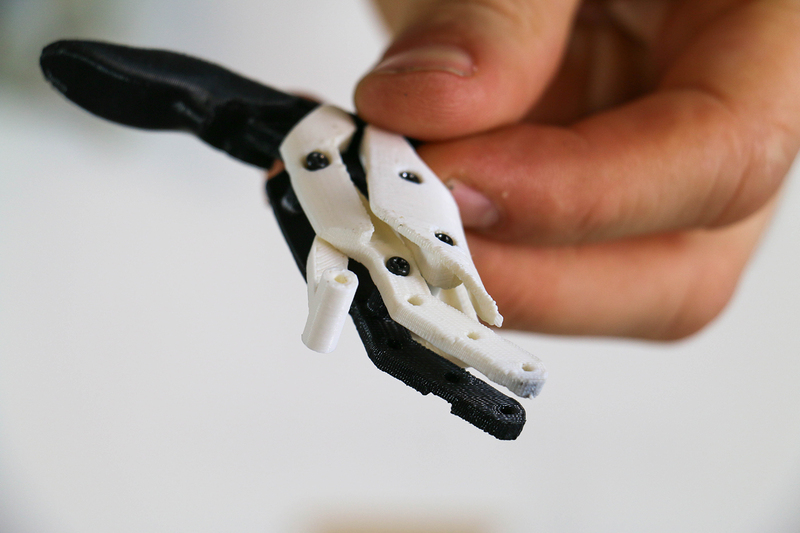 This model is about the adaptation of the Exiii hand on a professional socket. 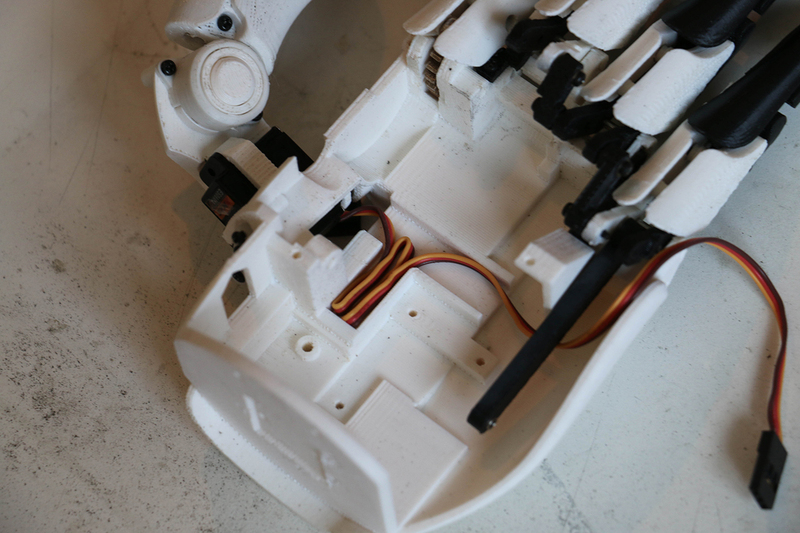 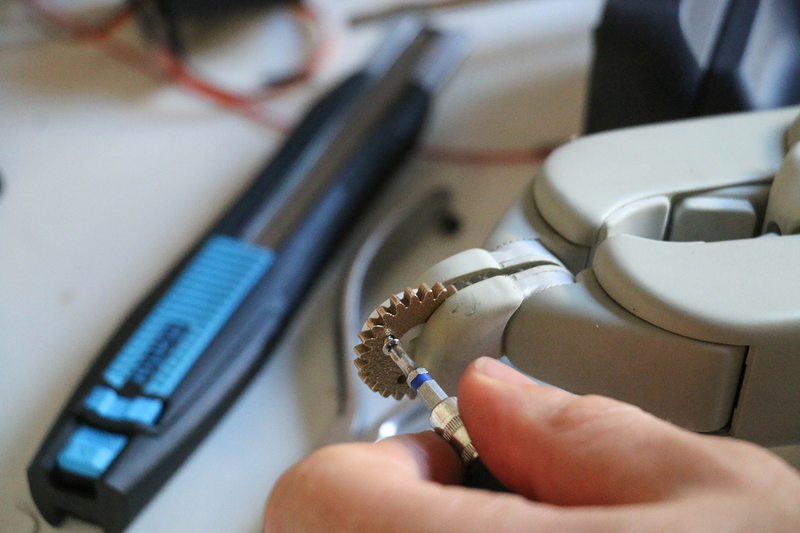 These steps explains how we adapted a wrist disconnector on the Exiii hand. 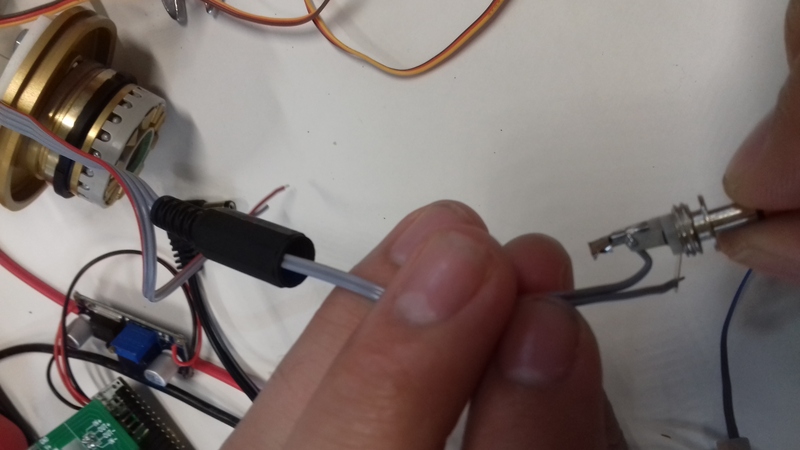 This special wrist is not available on the market, neither on a catalog but it is possible to find a similar model if you get in touch with a certified O & P.
The signal Open coming from the connector is soldered to the signal of the mini jack. 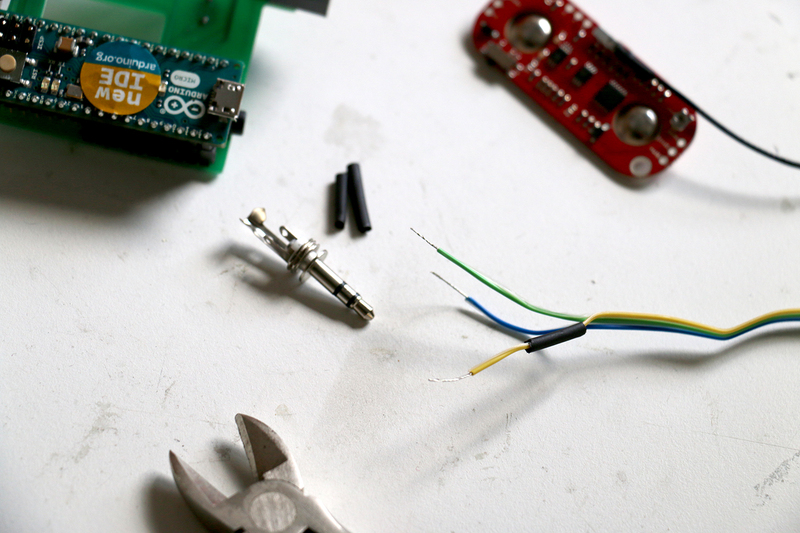 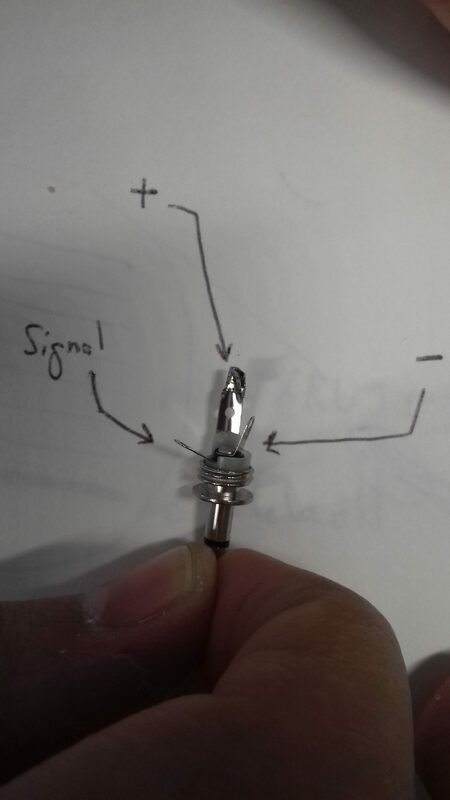 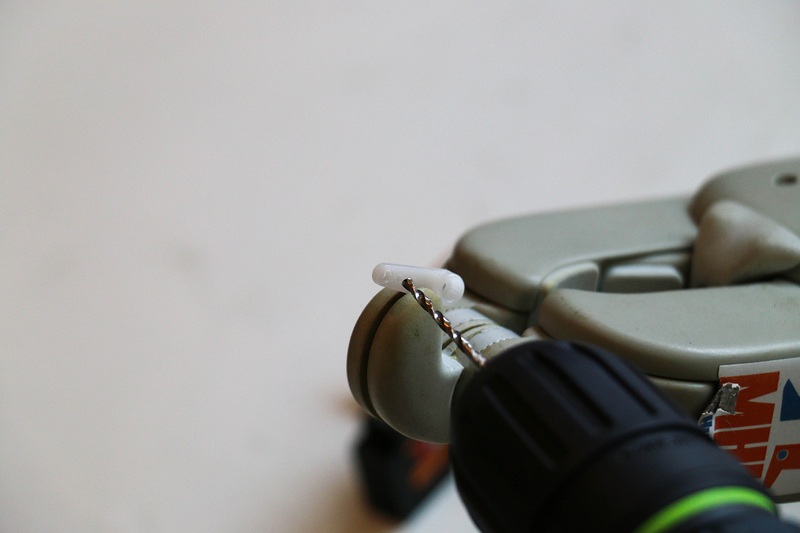 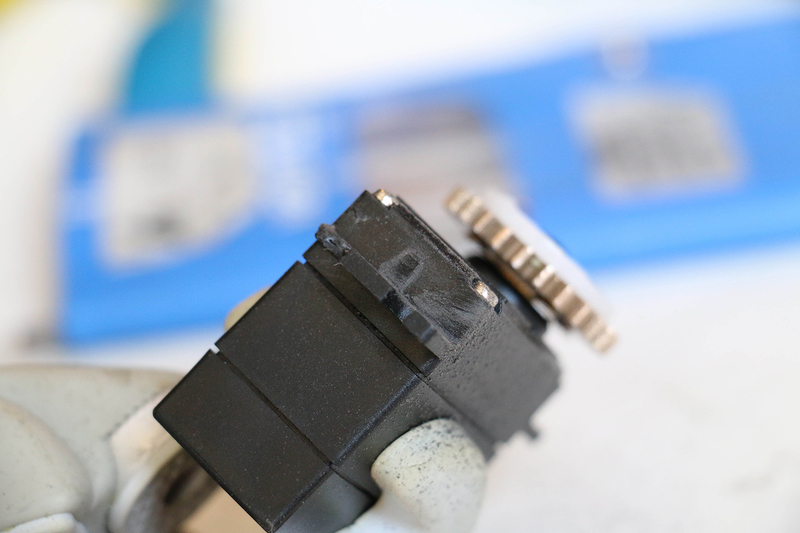 The - of the connector (battery) is solder to the - of the mini jack. 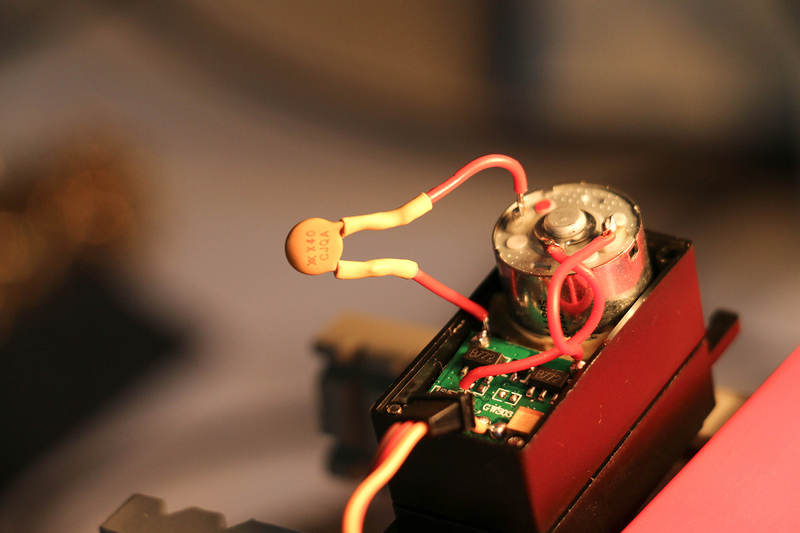 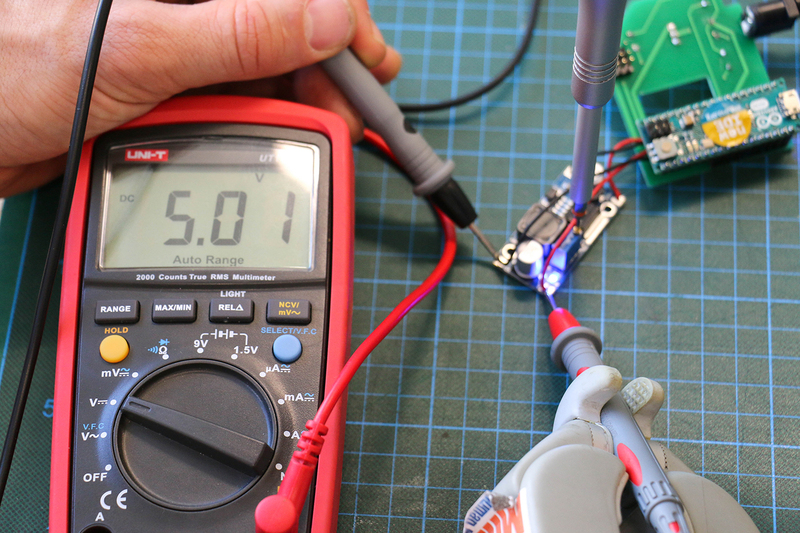 The + coming from the battery (red wire) is soldered to the + of power cable. 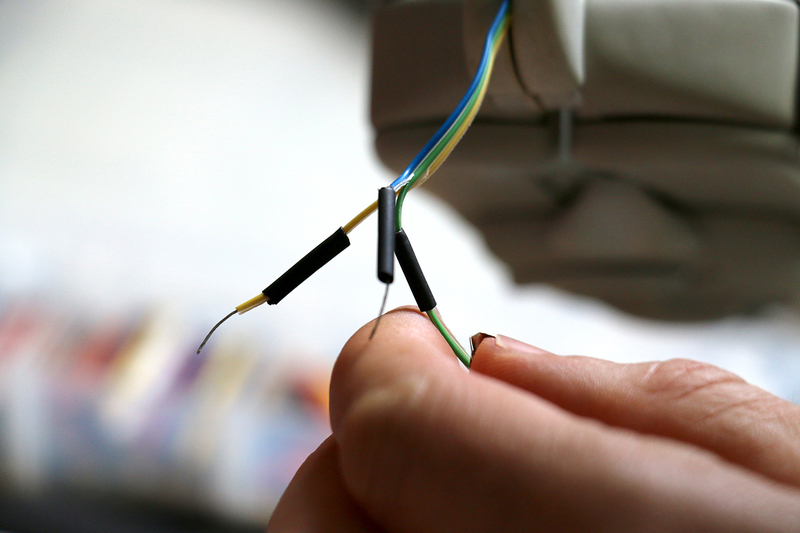 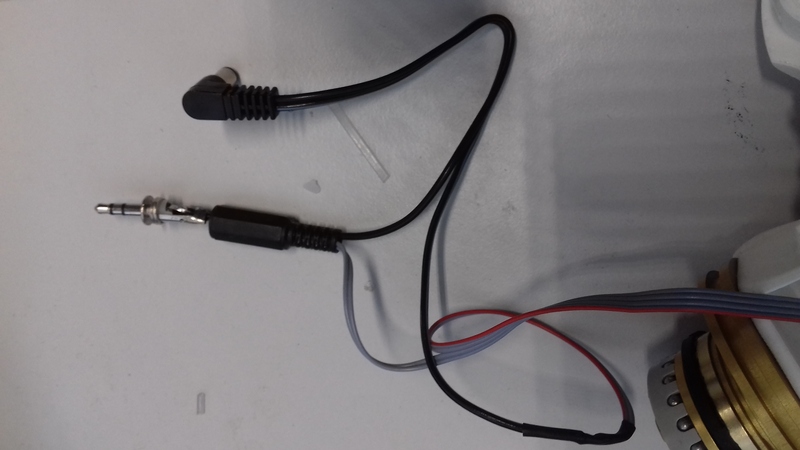 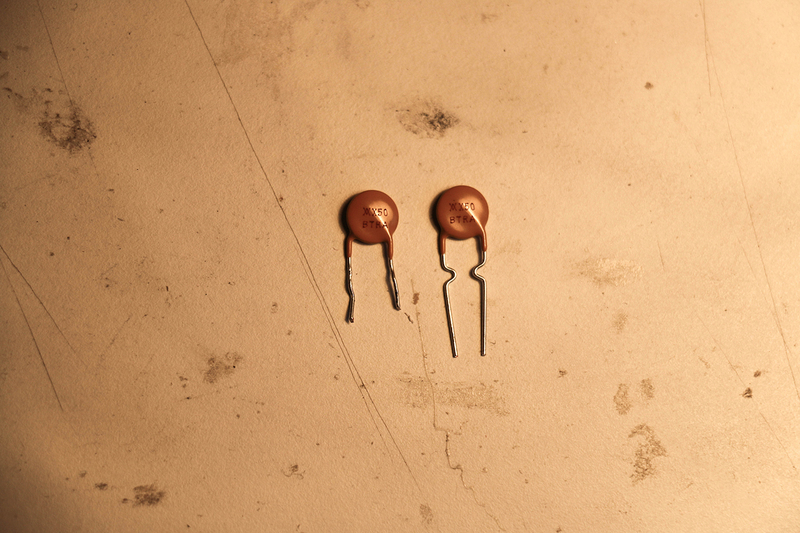 The - from the power cable is solder to the - . 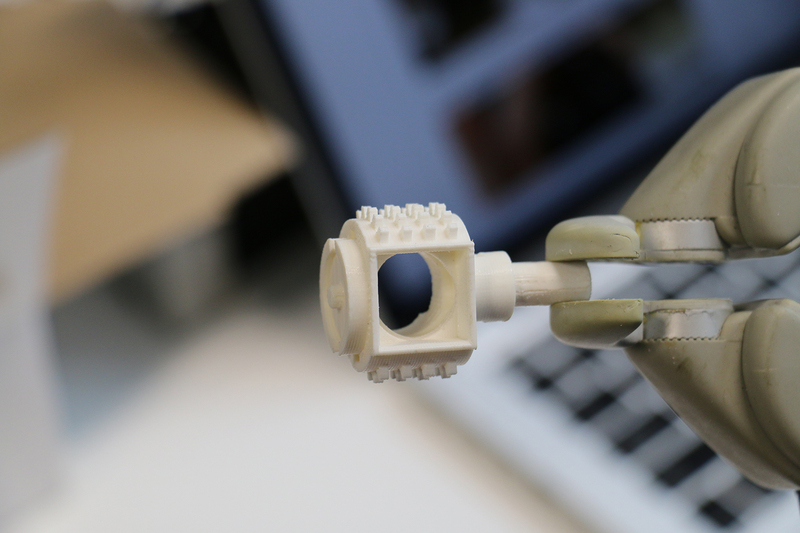 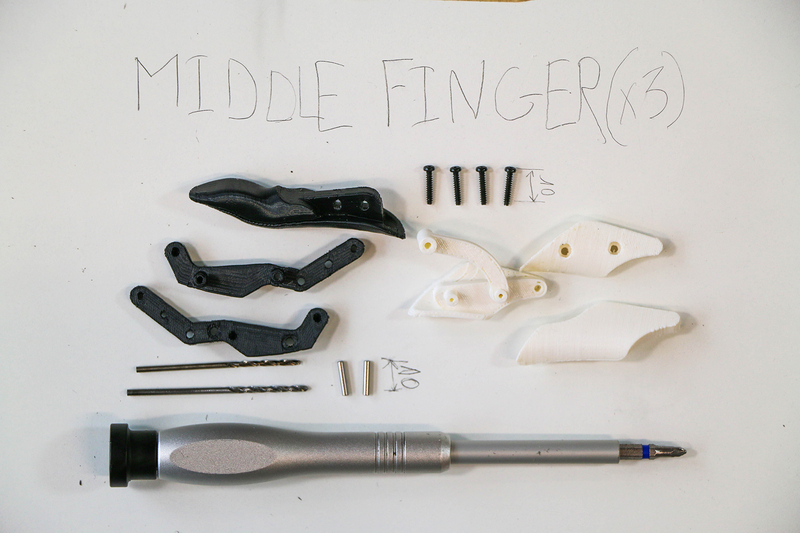 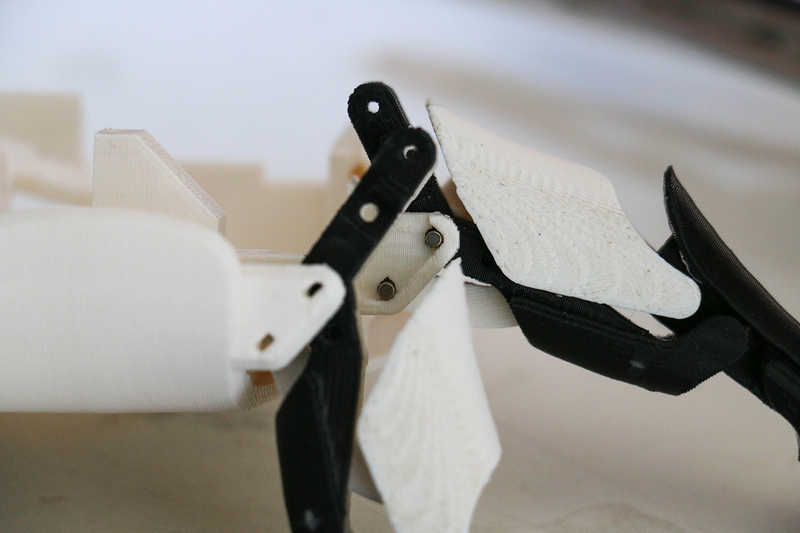 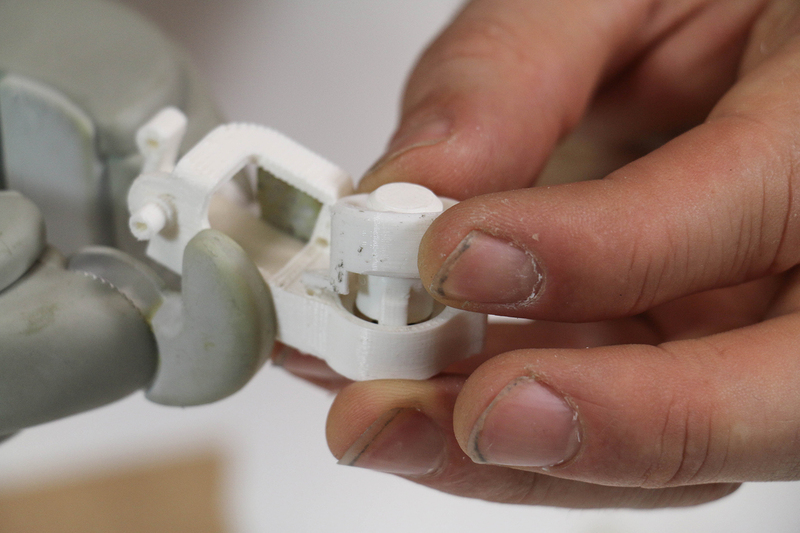 The initial plan was to make this hand available to anyone and possible to realize in a Fablab using standardized and worlwide available components. 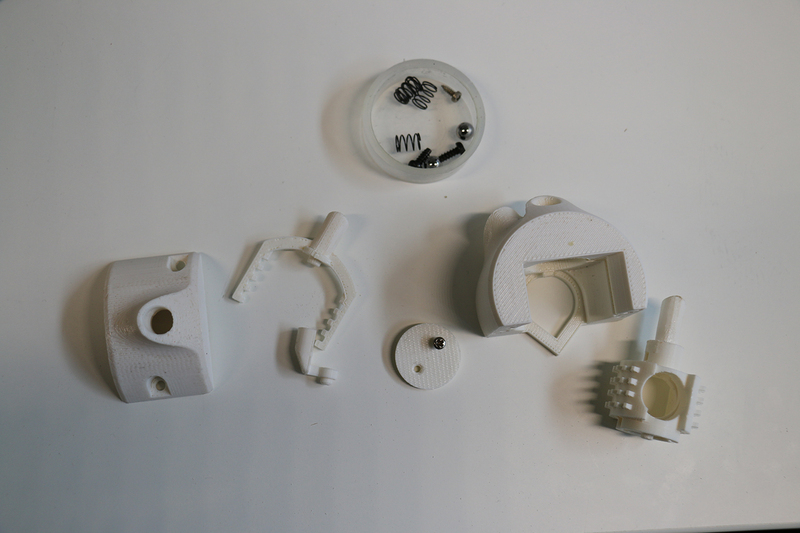 This is how we decided to work on a 3D printed socket but the complexity of the project makes difficult to mix standard components with quality. 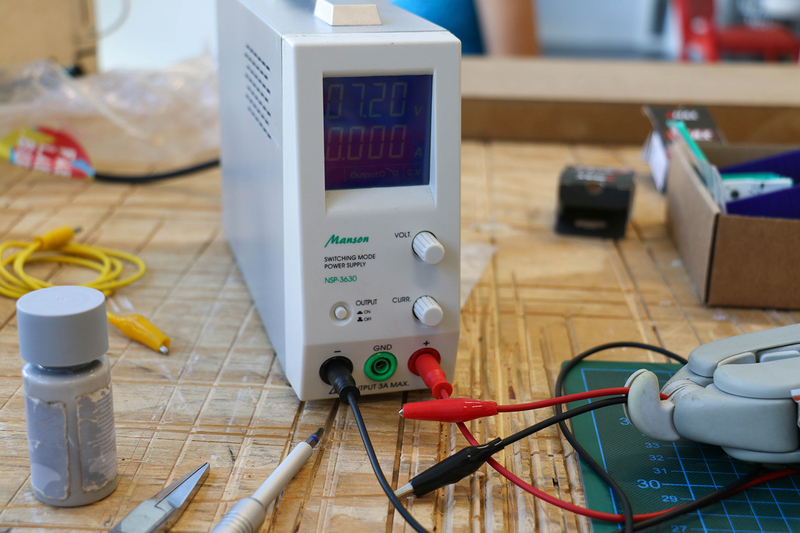 The challenge of this residency program was also to find a balance between an open source project based on a community and a company focused on business. 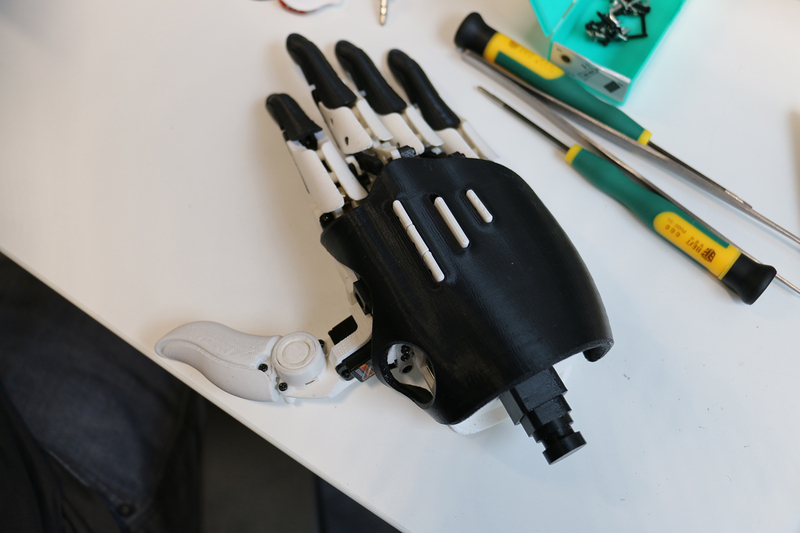 During the process of fabrication, new ideas came along and we made the decision to change the plan a little bit during the learning process of making this hand. 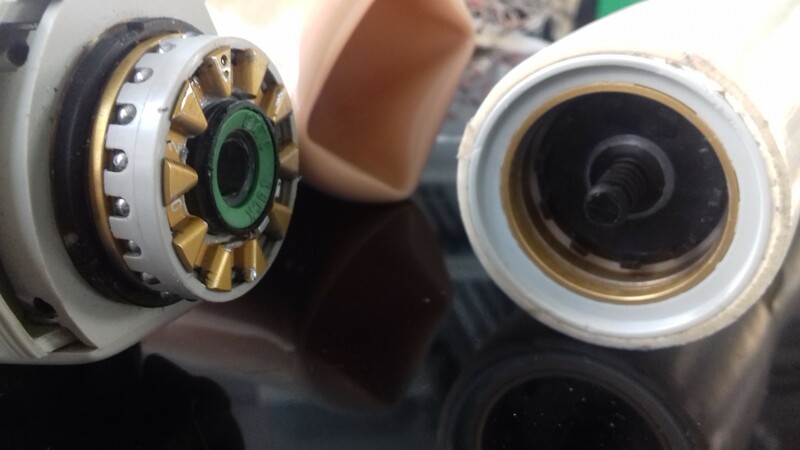 Because I wear a myolectric prosthesis averyday an allready have a socket, we decided to try to adapt the Exiii hand on my socket. 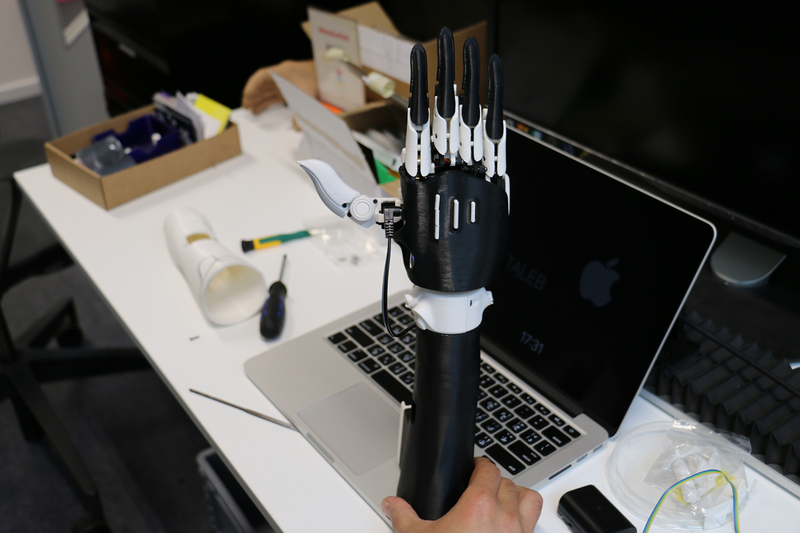 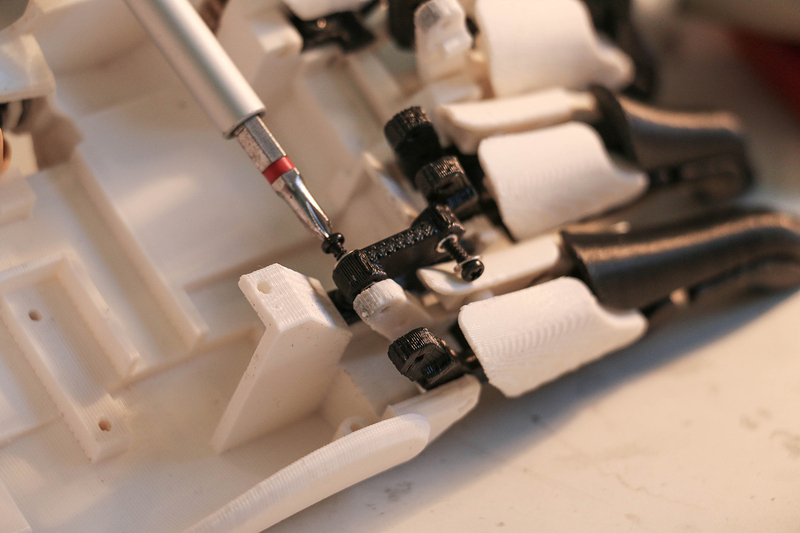 This "hybrid" prosthetic hand is a symbol of the possibility to adapt ourself. 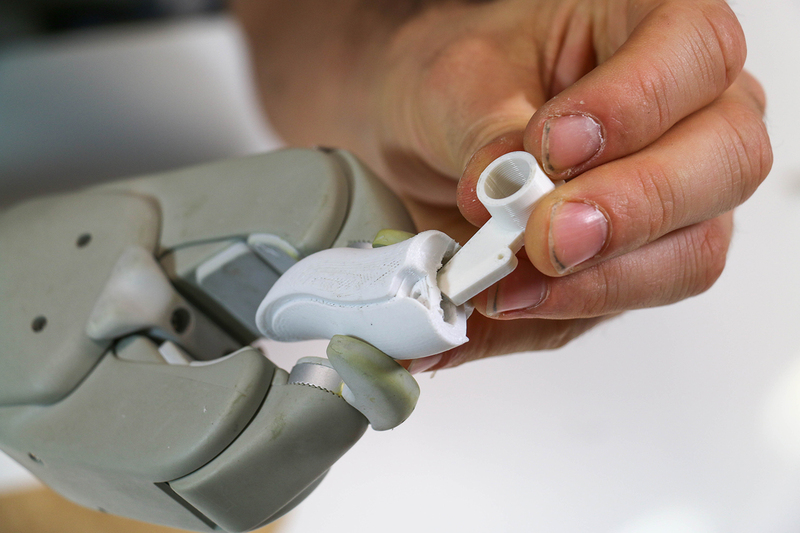 The hybrid version was not part of the initial plan regarding the non availability of the components (wirst, socket, electrodes) and because the focus was to make this prothesis available, but this hybrid version is a "first time" between a company such as Ottobock and Open Source. 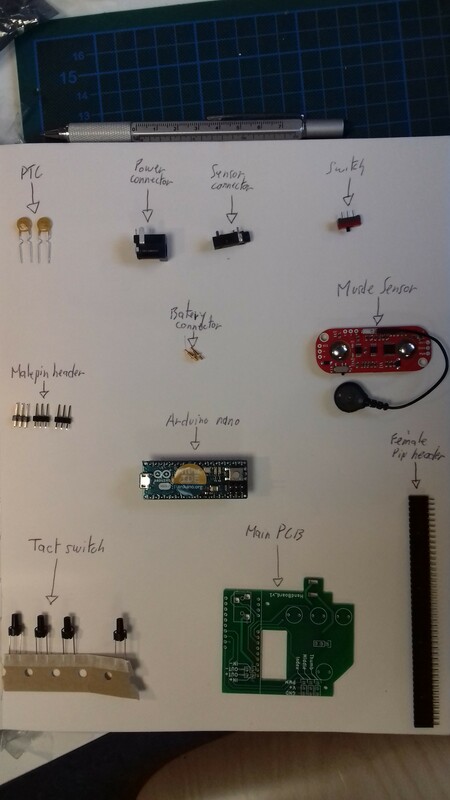 It really represents the possibility and also the difficulties between traditionnal (to follow the initial plan) and DIY (try everything). 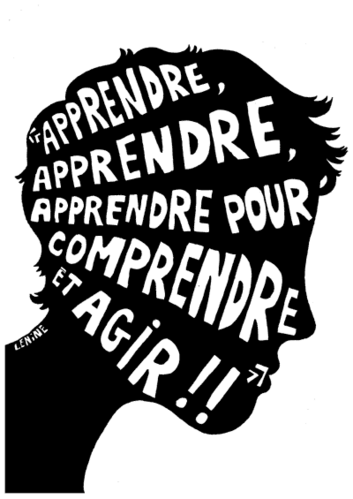 It is a learning process, hard to accept sometimes and often with a lot of doubts because we don't really know where this will lead us. 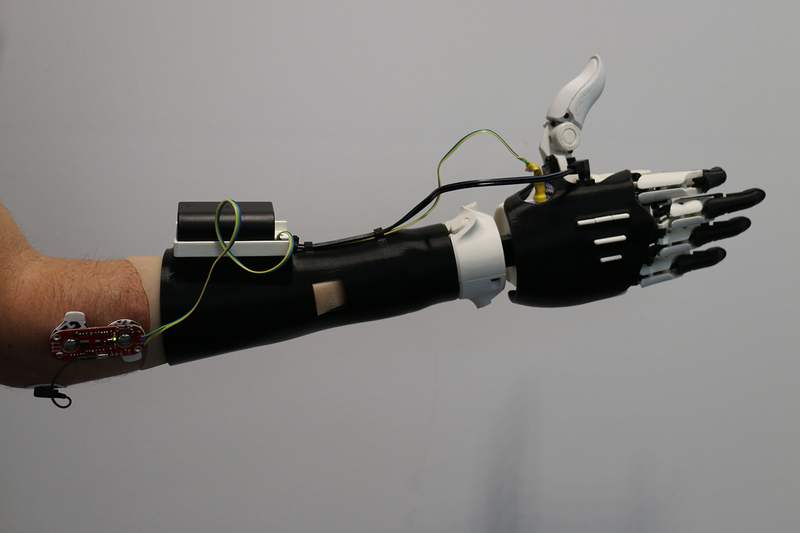 Negative: As a myohand daily user, I tested the speed, force, control and usability of the Exiii hand. 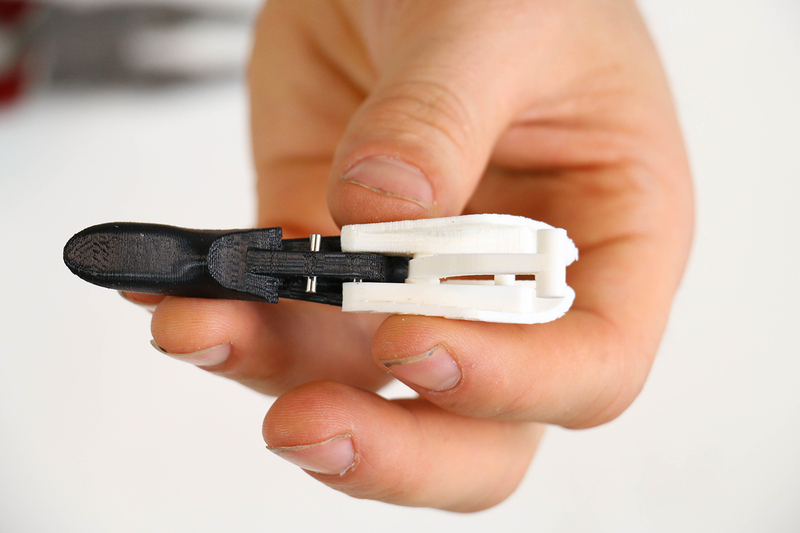 It is, from my point of view definitely not usable for a daily use because it is not enough strong, robust. 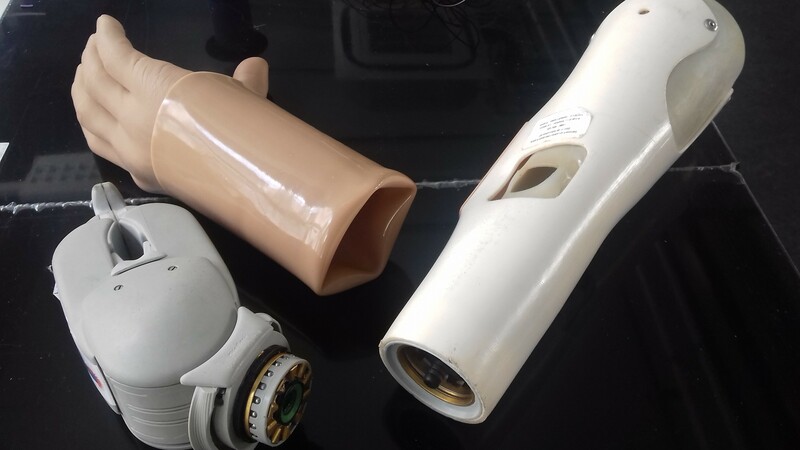 It is also difficult to put on clothes because the hand can't grab the clothes strong enough. 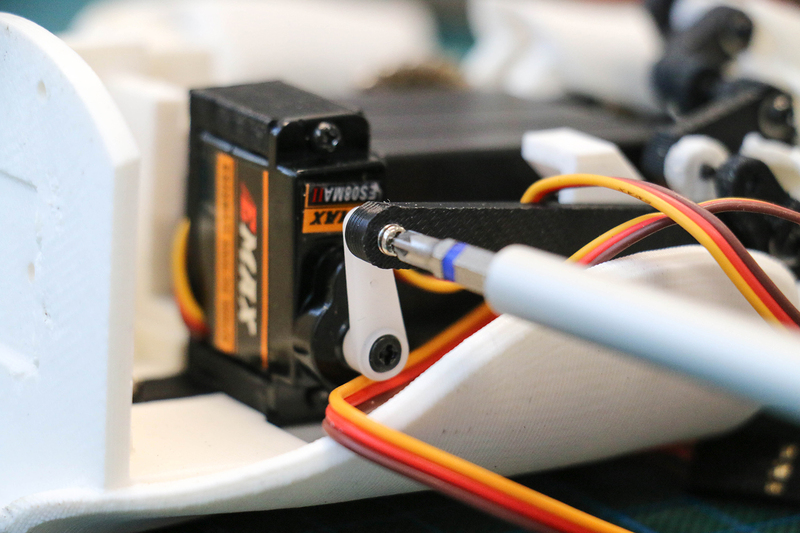 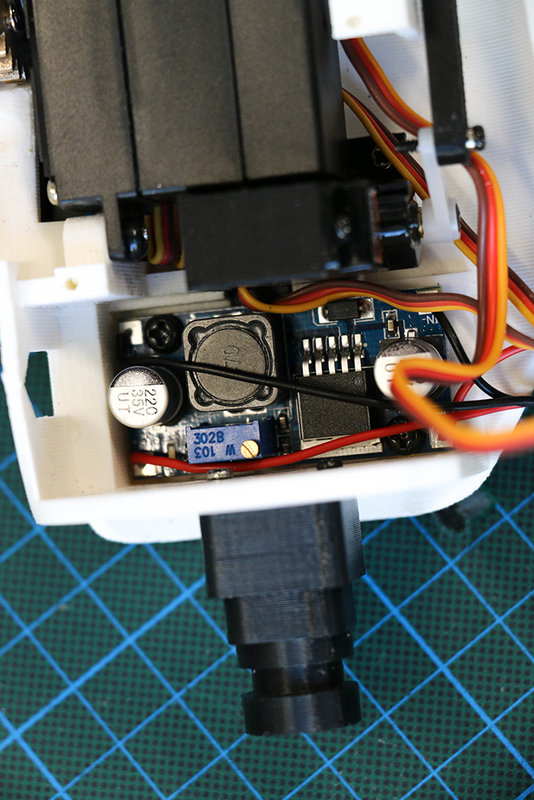 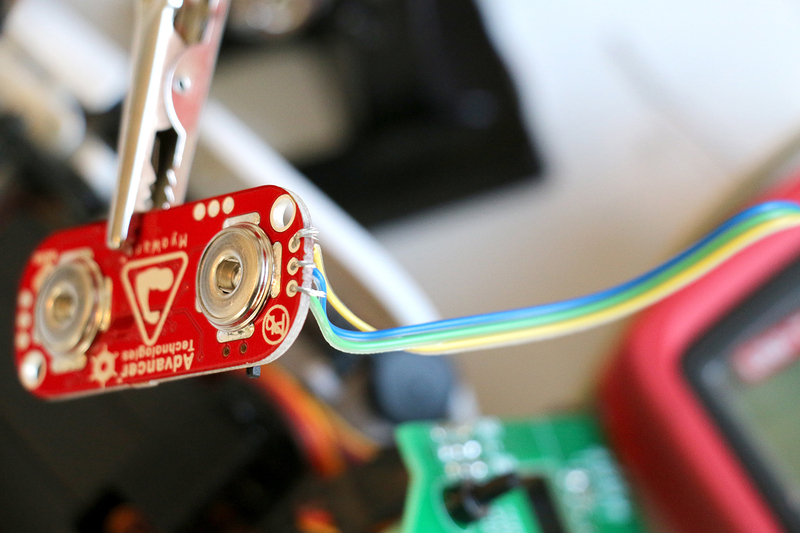 The servos heat very fast and stop working after about 15 min use. 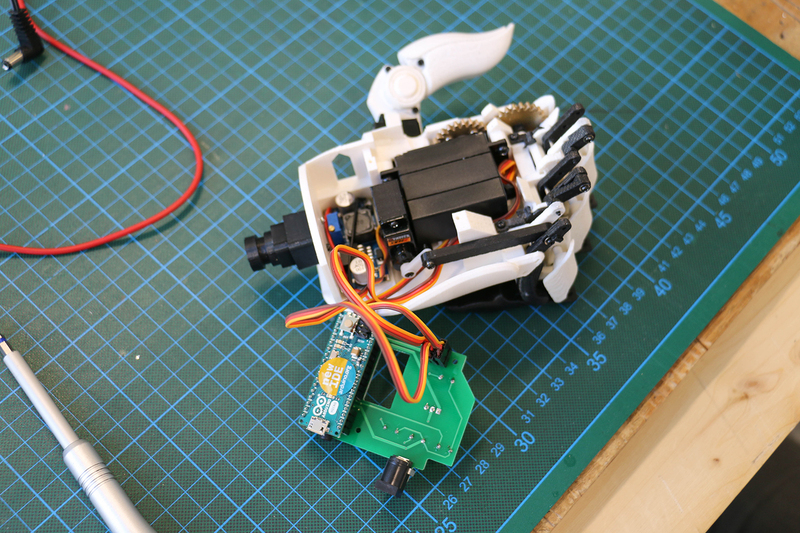 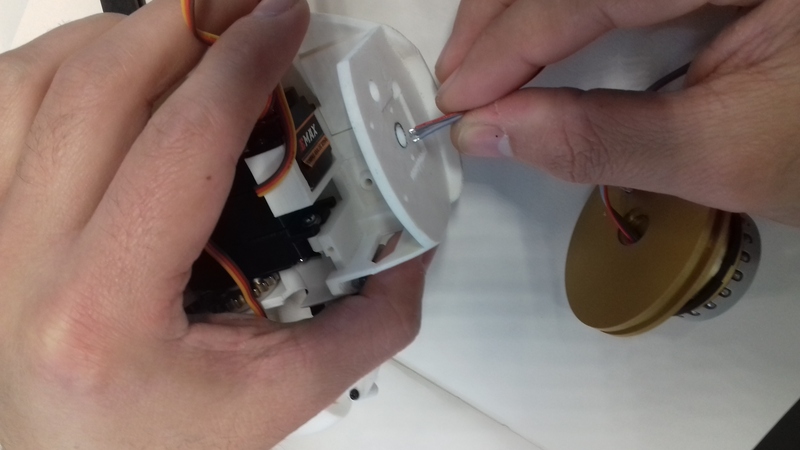 The hand must be stopped to cool down the servos, and each time the hand is turned on, the training mode takes about 5 sec to set up. 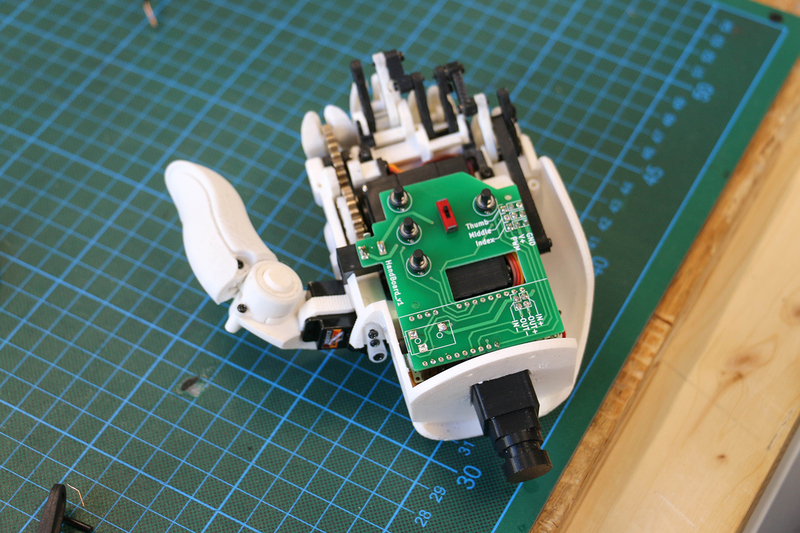 Each time the hand is turned on, the training mode takes a little bit of time which does not really motivates to use the hand. 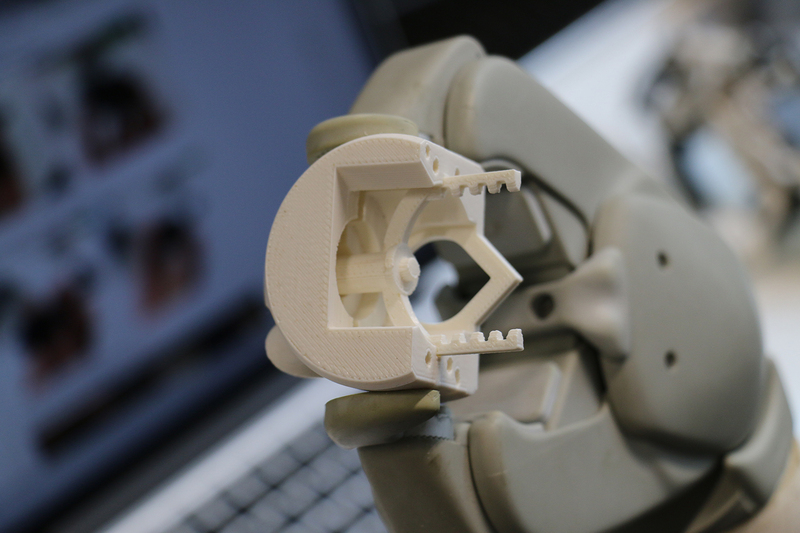 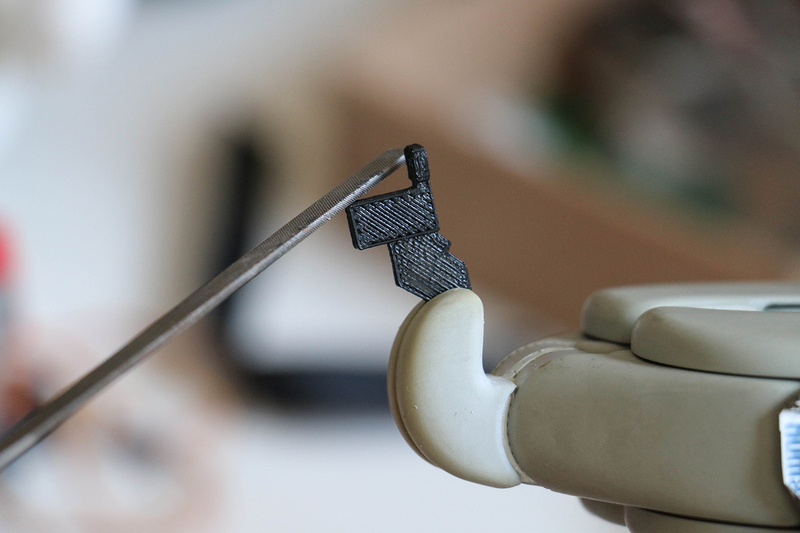 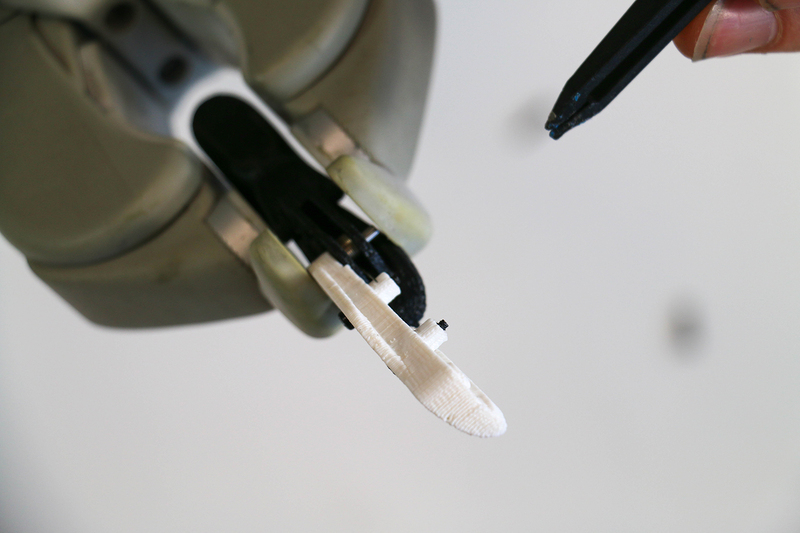 Positive: For the first time ever, it is possible to use a 3D printed open source bionic hand, which means, possible to grab objects such as cups, a smartphone or small objects such as a pen, a sheet of paper, a spoon, a cookie, even a cigarette for smokers. 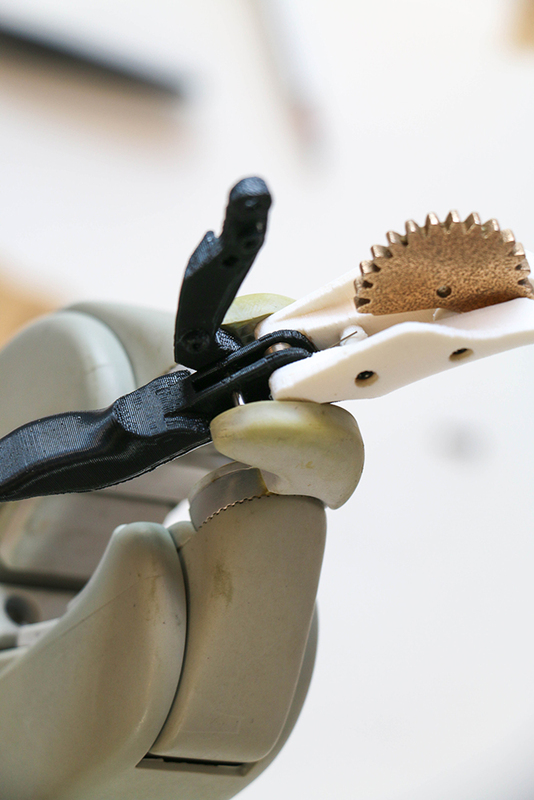 The different modes allow to switch between power grasp, precision grasp, or lateral grasp which give the sensation of doing more things. 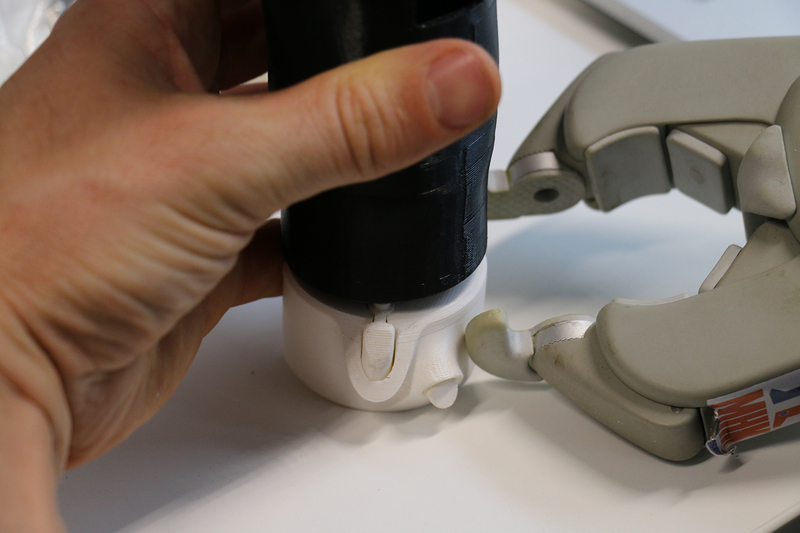 For the 1st time, I have seen myself using the Exiii hand instead of my Varie + speed Ottobock hand when it comes to tap on a laptop thanks to the index position. 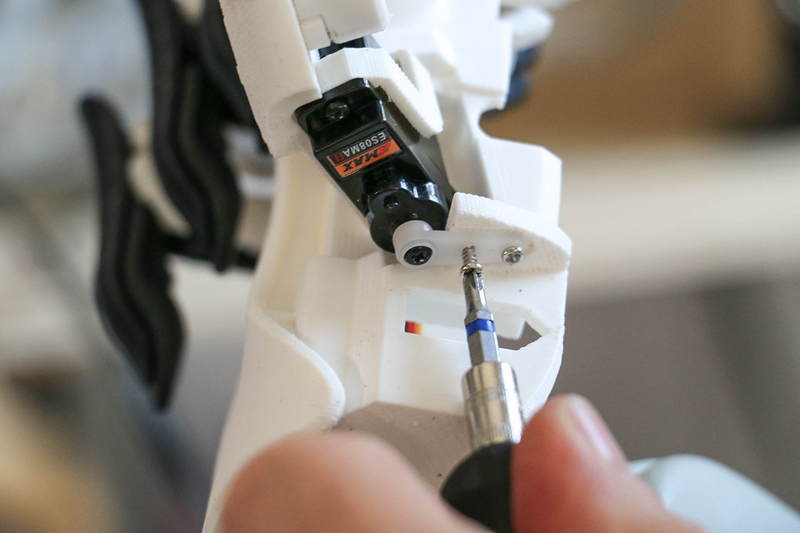 It was difficult as an amputee and a non technician to make this project. 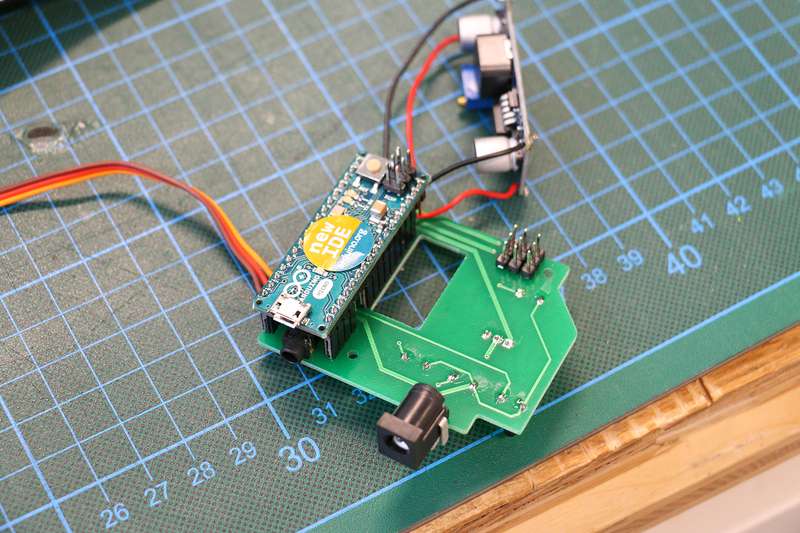 I was really afraid not to succeed because this project is complicated and involves lots of dexterity and skills because of the small components and the electronics. 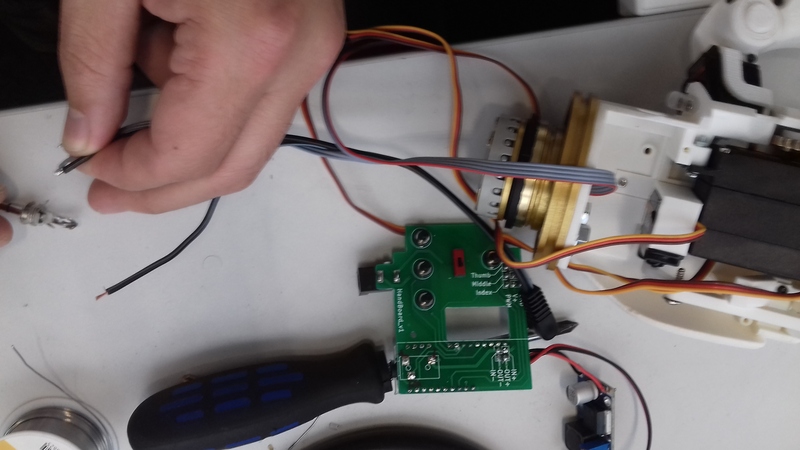 Thanks to the team work and the residency program, I was feeling more confident and slowly but surely started to use the machines such as 3d printers or iron solder. 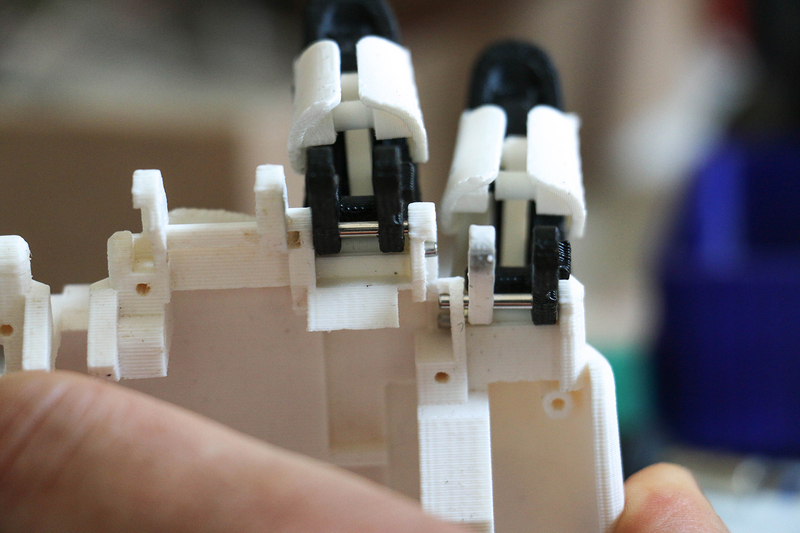 Thanks to both versions, we could benefit of the experience of the 1st hand to make this second version faster. 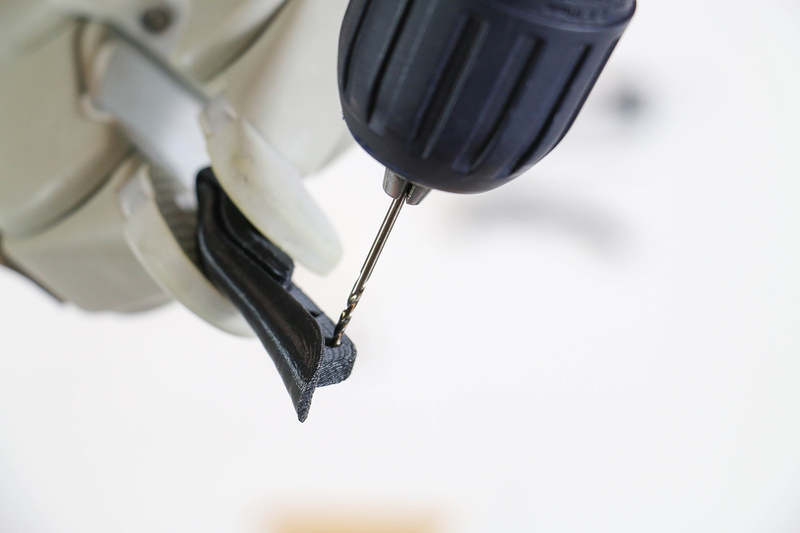 It was a learning experience to be part of the residency program at Fab Lab Berlin, to benefit of the help from Makea Industrie and consulting from Ottobock. 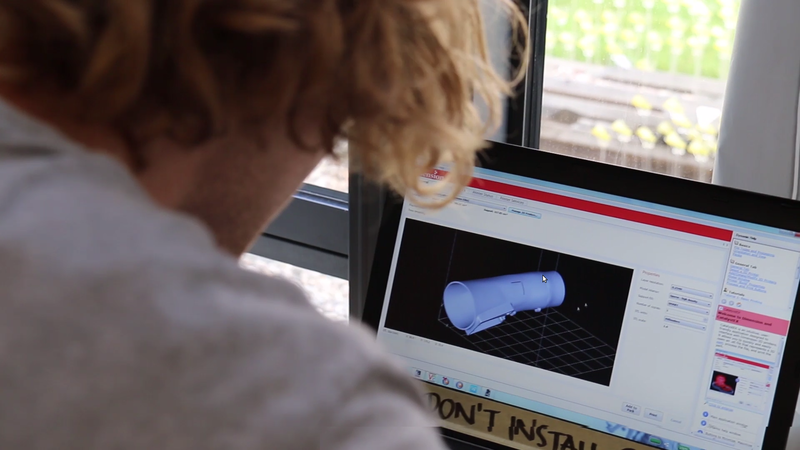 It made the project possible to make and proved how positive, creative and productive is open innovation. I am looknig forward to live such an experience again.